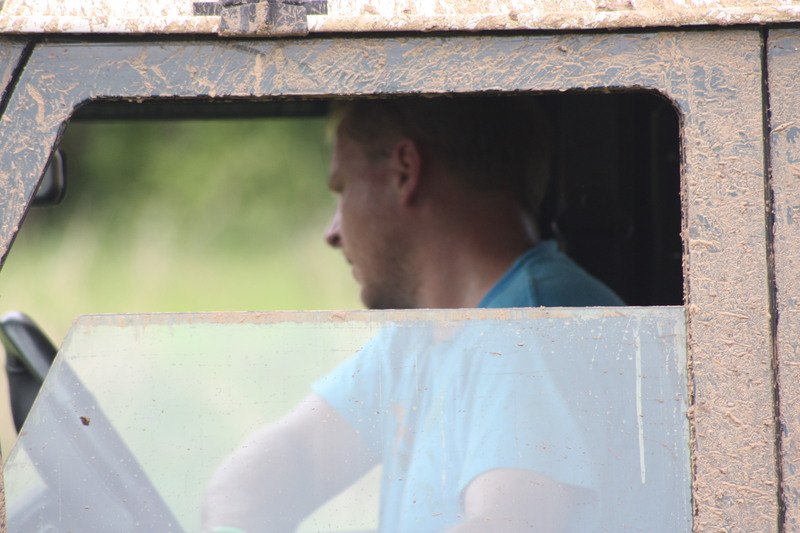 Is Wilson a “City Slicker” 4×4? 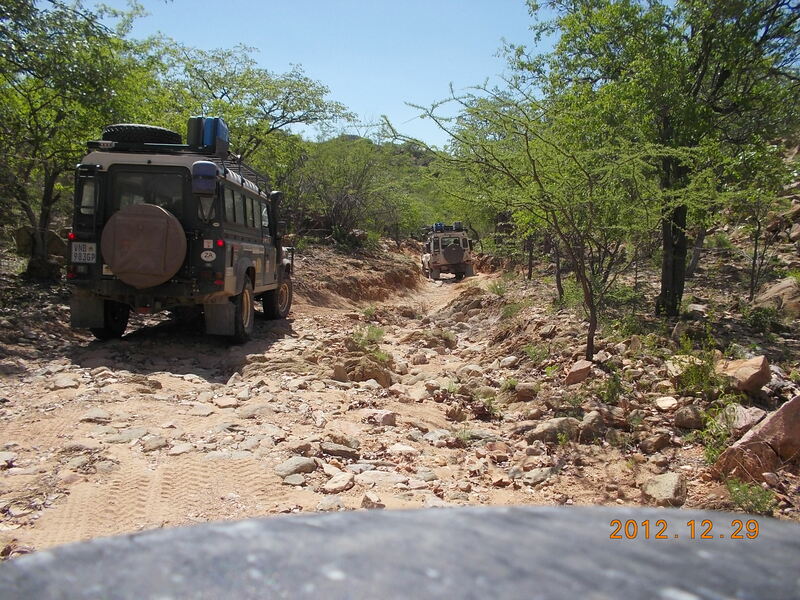 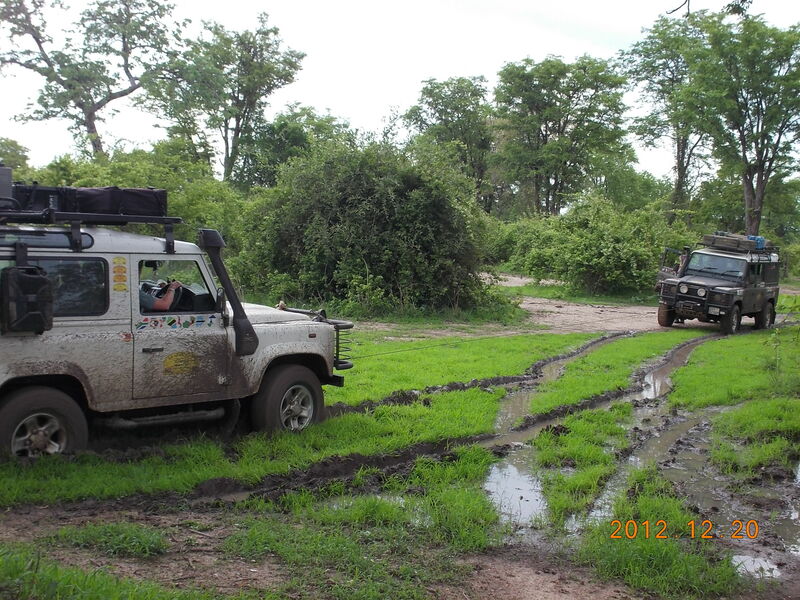 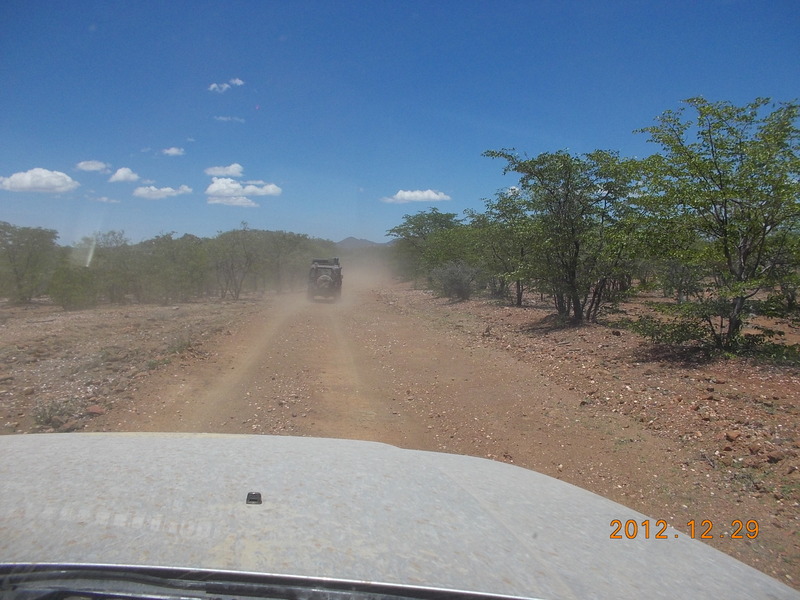 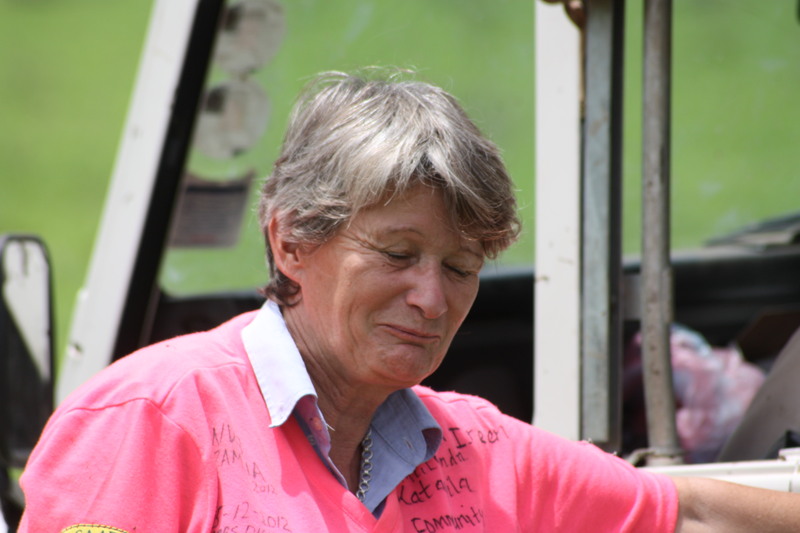 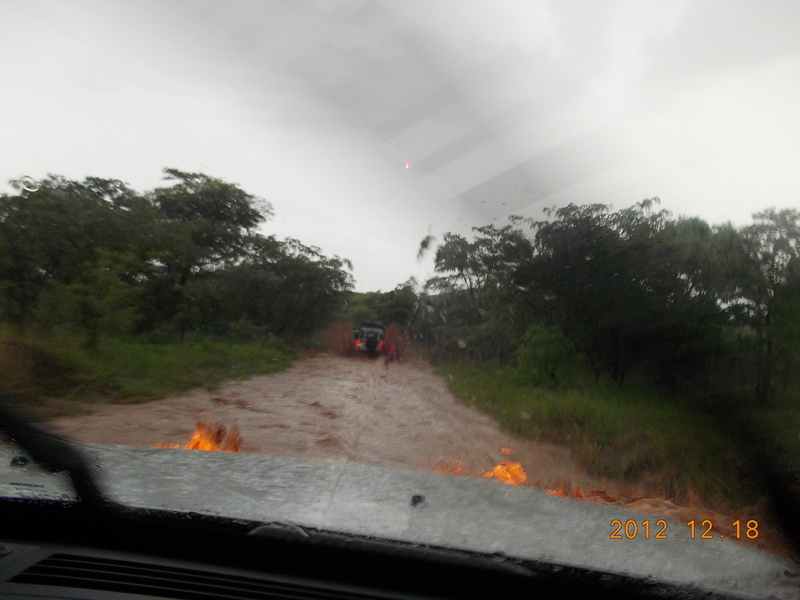 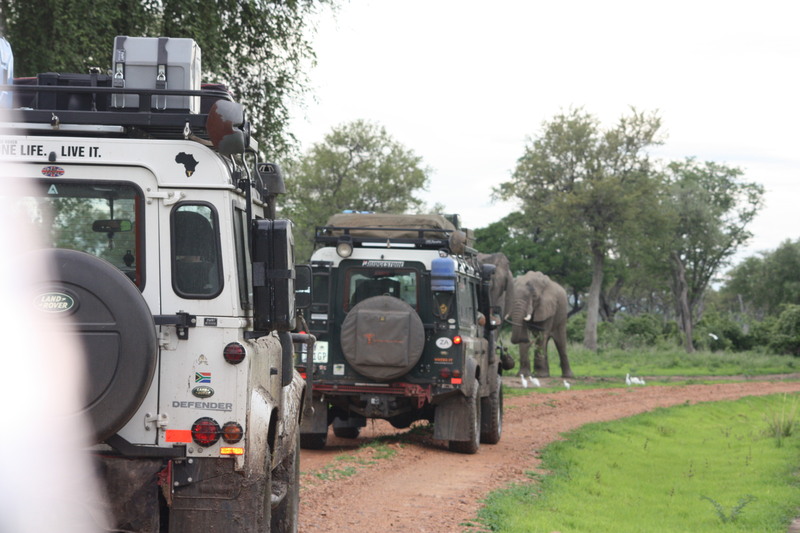 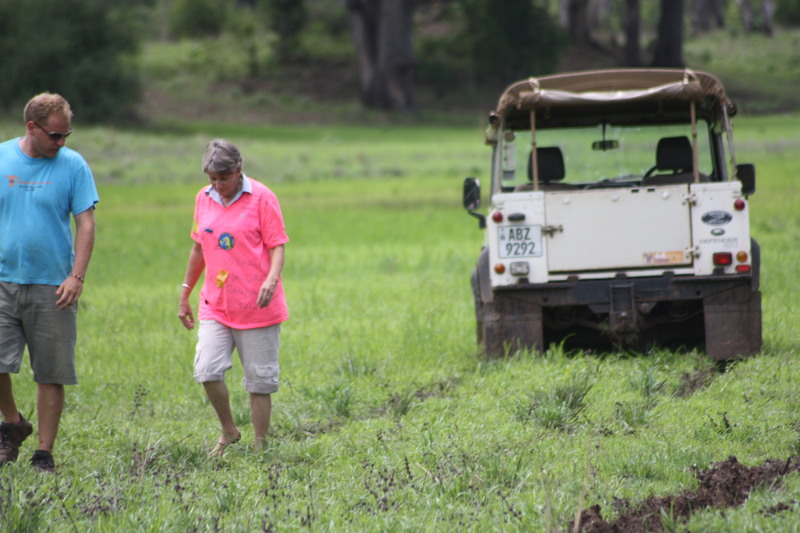 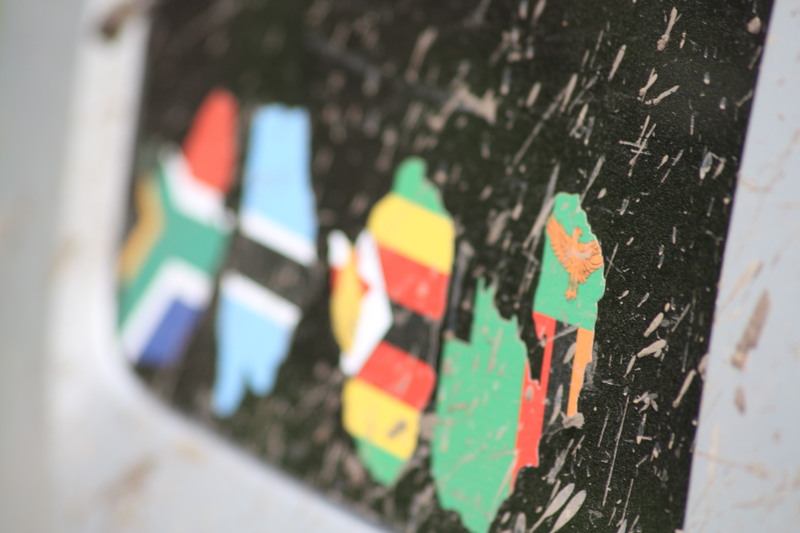 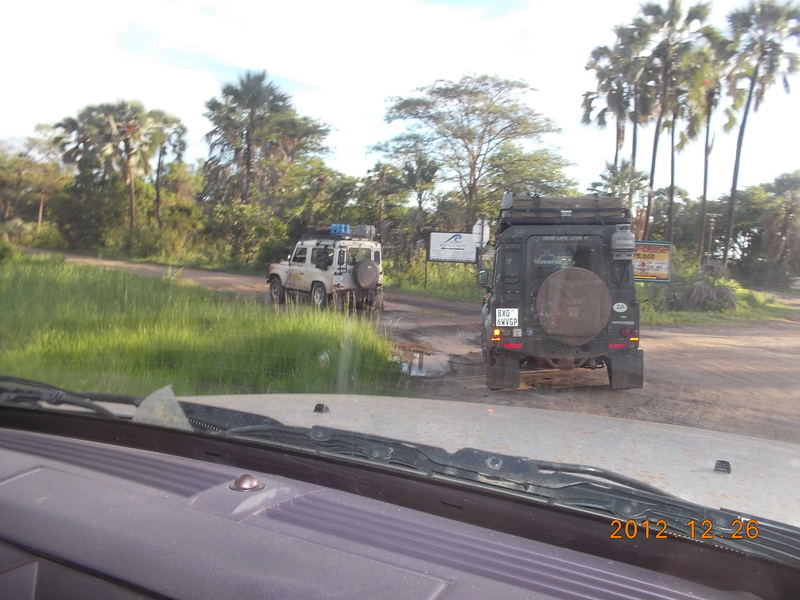 On the 15th of December 2012 our convoy left South Africa to the Luangwa Valley in the North West of Zambia. 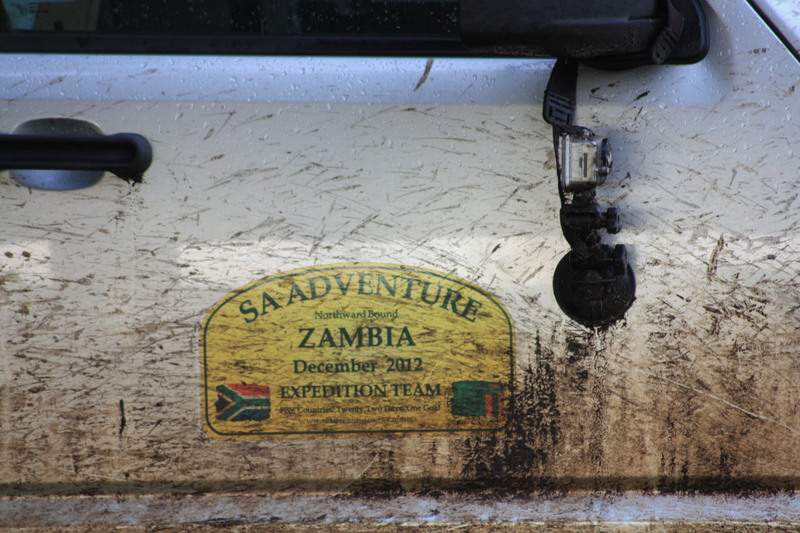 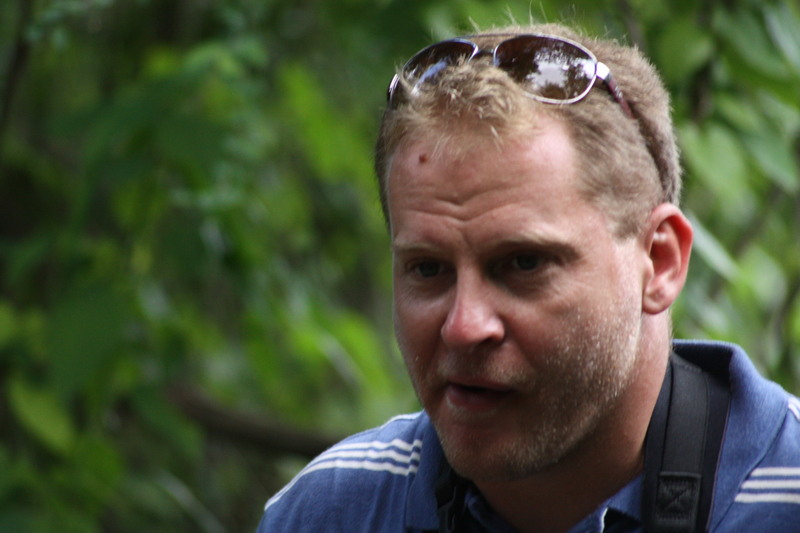 Tim from SA Adventures led the expedition team. 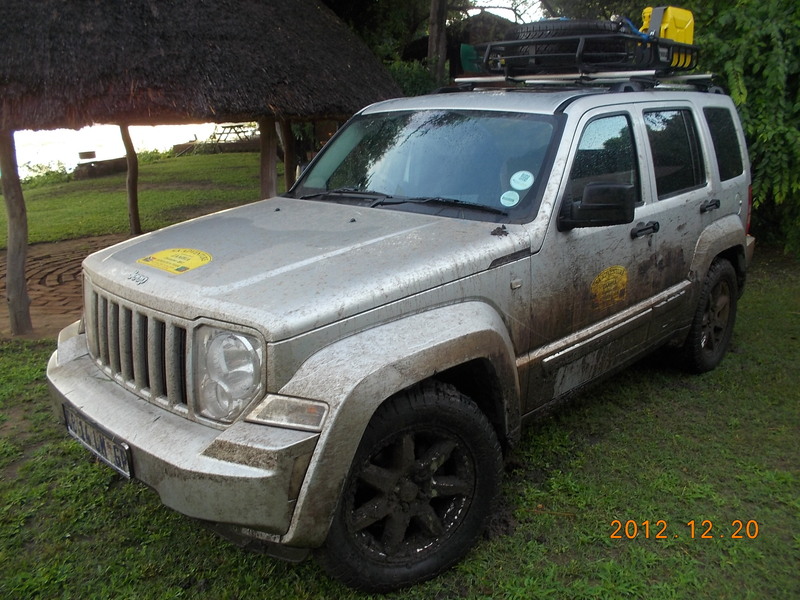 Our team consisted of 5 vehicles, 4 Land Rovers and my factory standard, 2012 2.8 Diesel Jeep Cherokee. 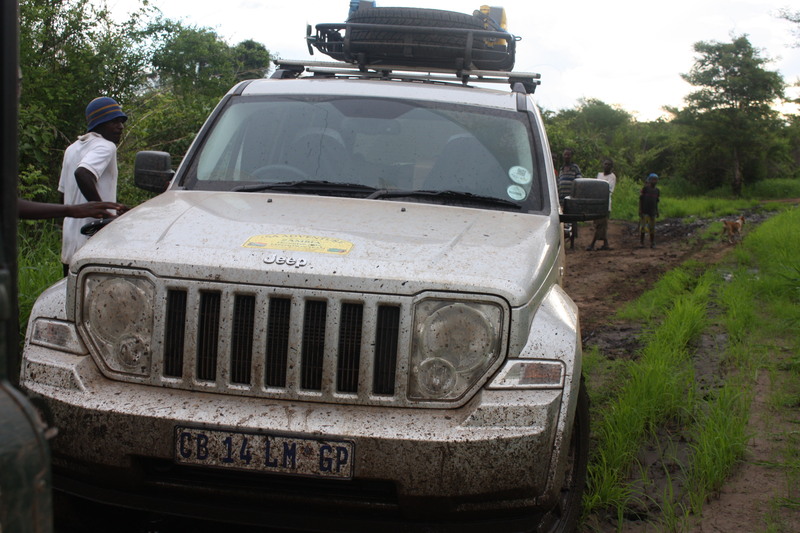 At first I was skeptical about taking a “City Slicker 4×4” off the beaten track into the African wilderness. 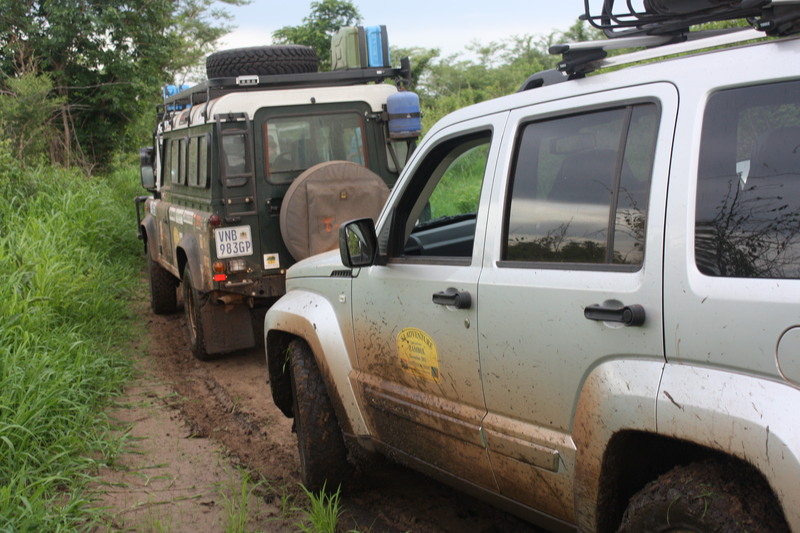 We completed a staggering 8,500 km in 21 days that took us through 5 countries: South Africa, Botswana, Zimbabwe, Zambia and Namibia. 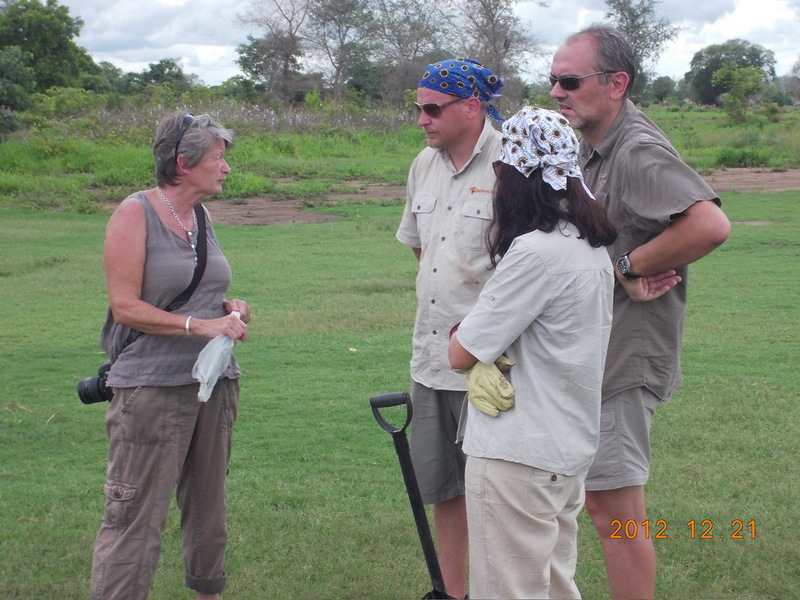 The team Bob, Tim, Sue, Bear, Dace, Freese, Michele, Carmen and Jacques. 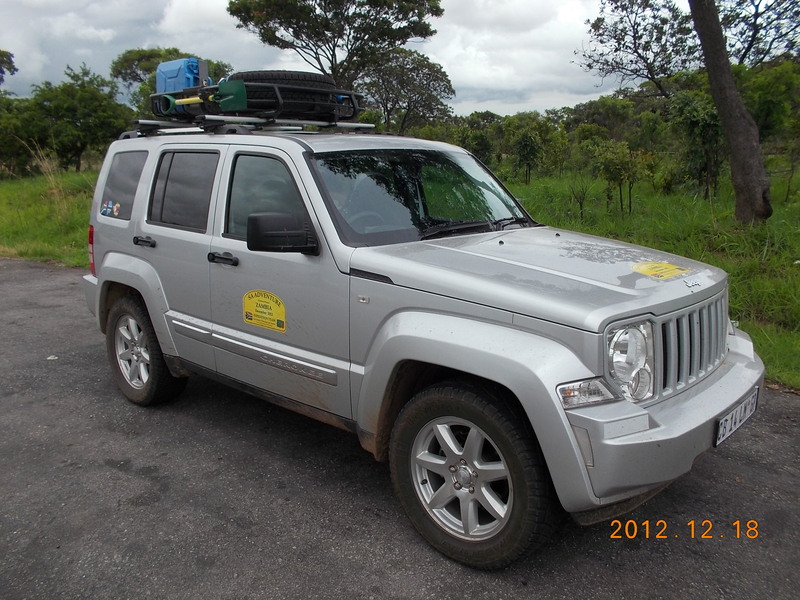 I replaced the factory standard Jeep Cherokee’s tyres with General Tyre’s Graber All-Terrain (AT) tyres. 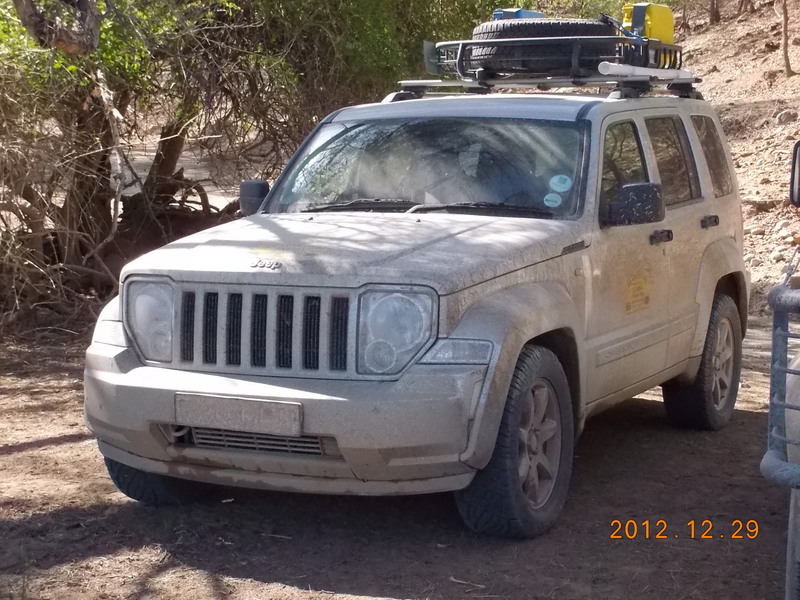 What a nightmare it was to find 18 inch AT tyres that will fit the Jeep’s specifications. 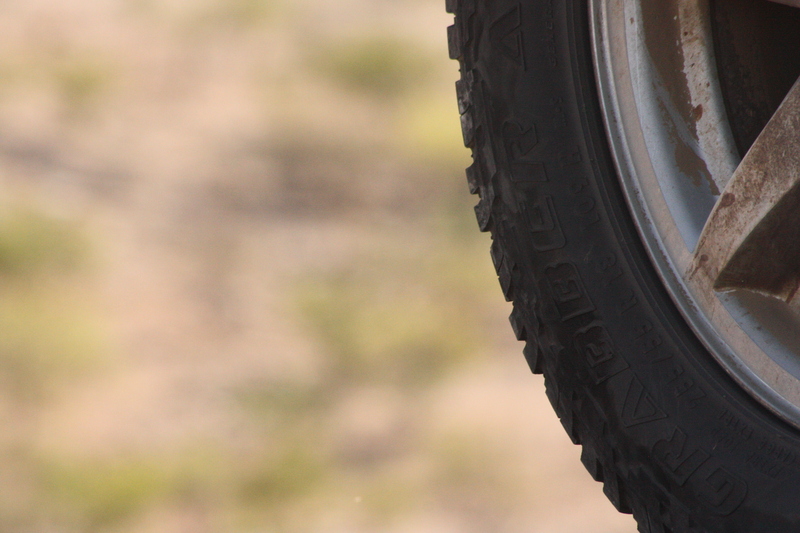 I ended up fitting a set of 255/55/18 Grabber tyres from General Tyre, the difference in circumference was only 2mm on the outer diameter (OD). 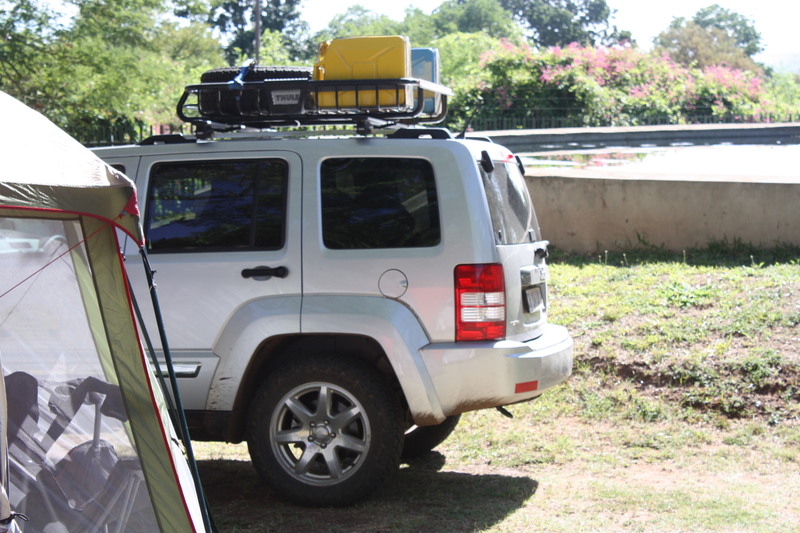 I also had a Tule basked roof rack that I had to customize to accommodate two Jerry cans and a sixth wheel. 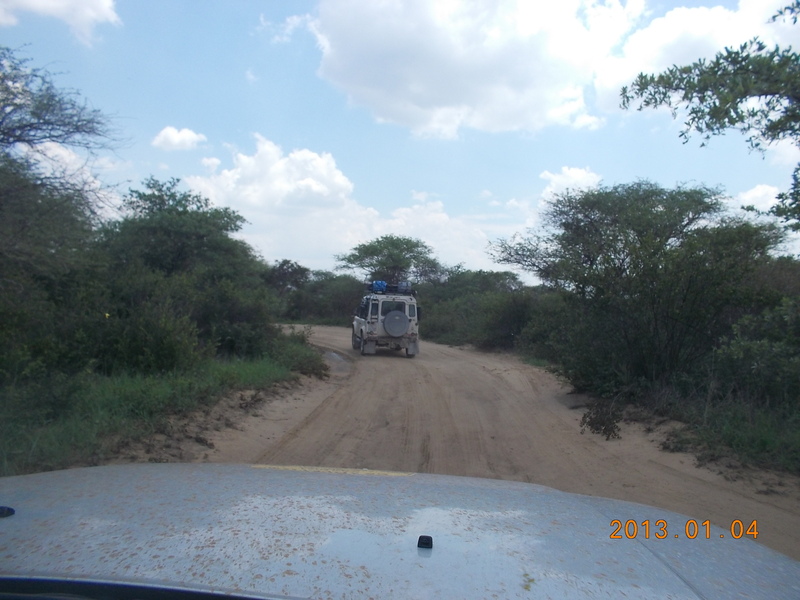 Prior research of the route ahead, I noted that Van Zyls Pass was on the route, and as i did not want to take any chances with low profile tyres that could potentially jeopardise the convoy’s mobility, and I was the odd one out with 18 inch wheels. 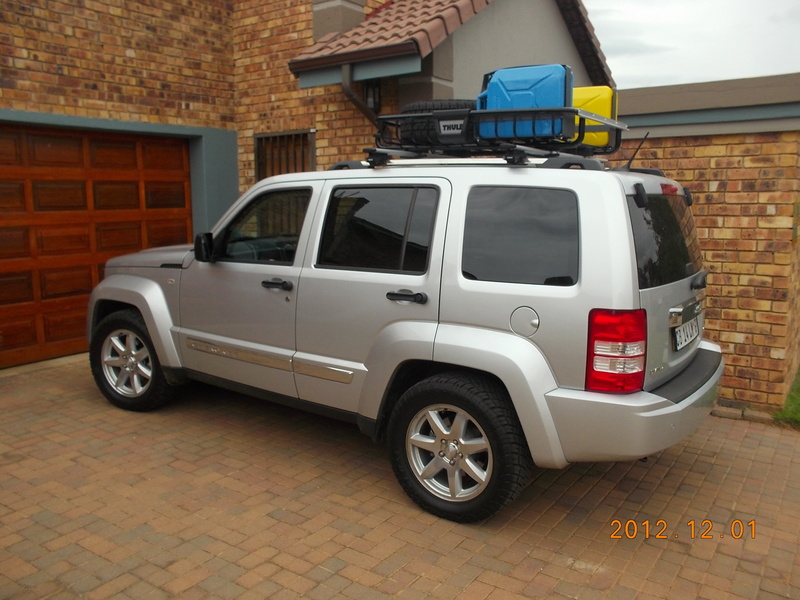 The roof rack was also a concern seeing that it is limited to a maximum weight of only 80 kg. 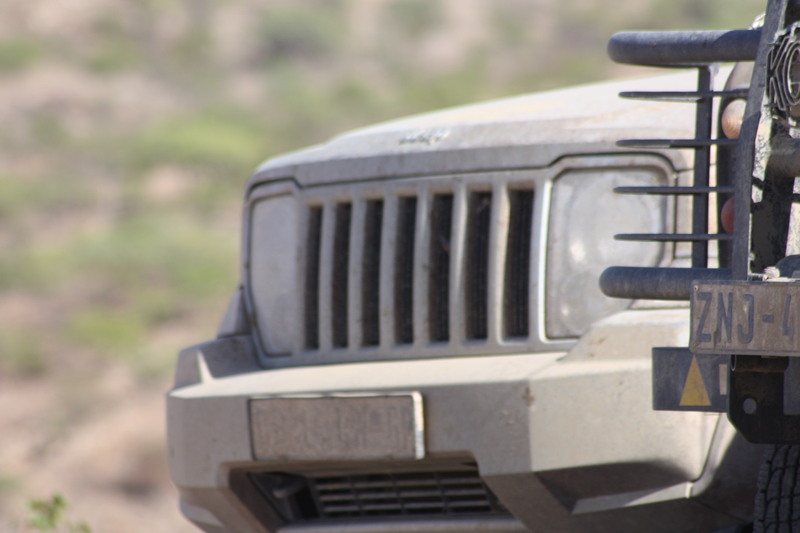 Jeep has a maximum roof carrying capacity of 87kg, this is to prevent excessive rollover rather than total carrying weight. 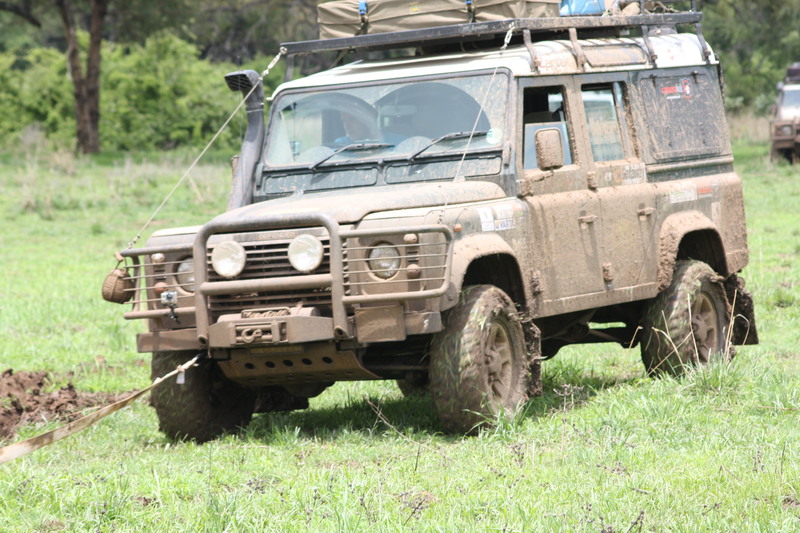 The total weight of 90 kg consisted primarily of the roof rack which weighed in at 35 kg, the two jerry cans weighing at full capacity 40 kg and the spare tyre a handsome 25 kg. 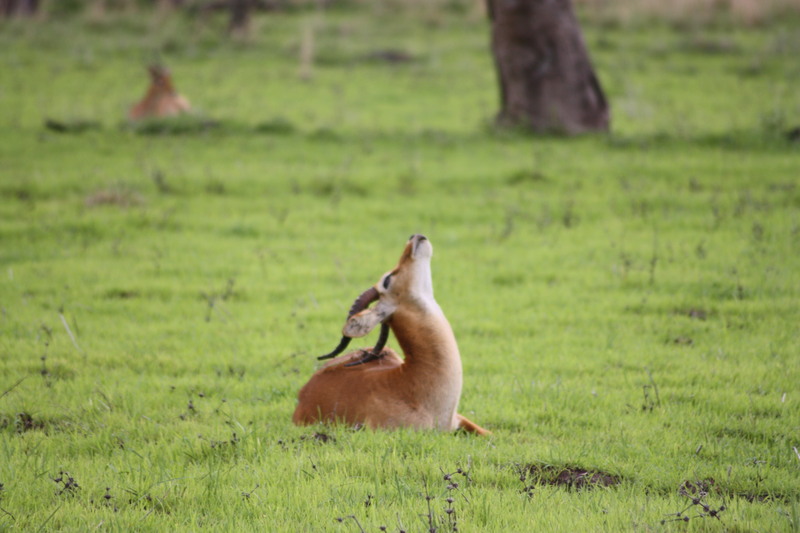 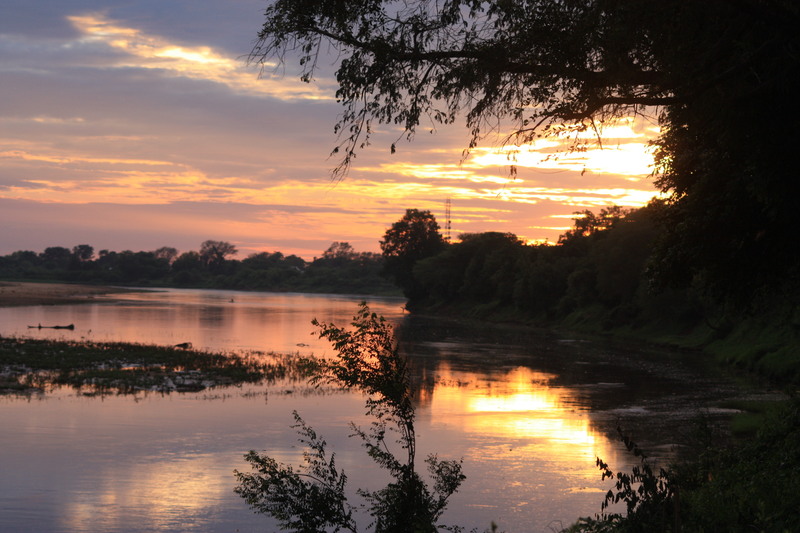 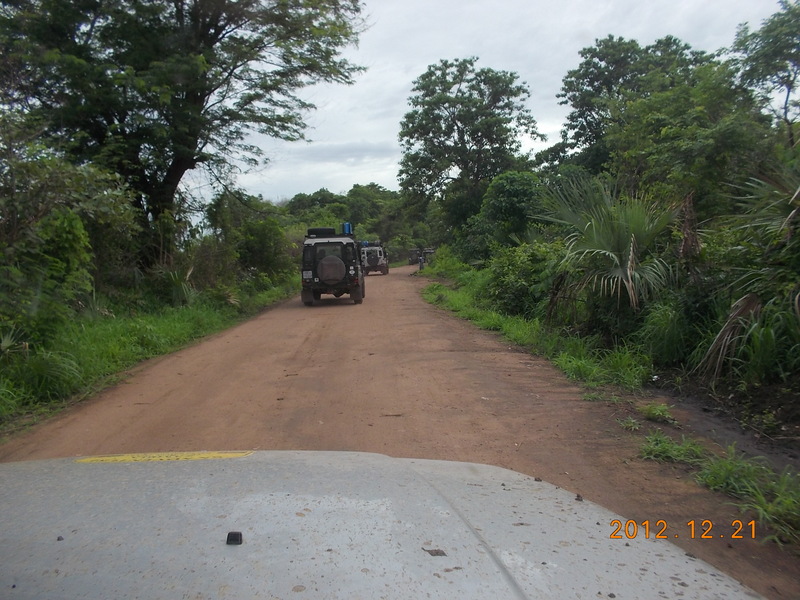 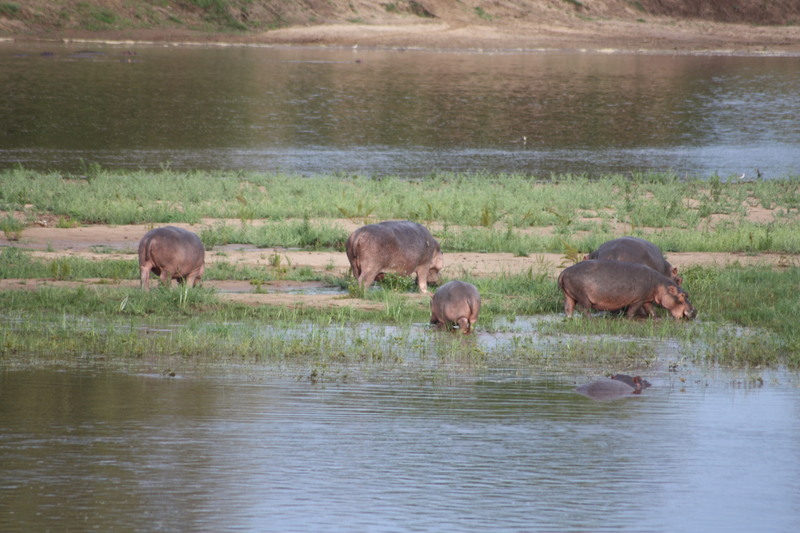 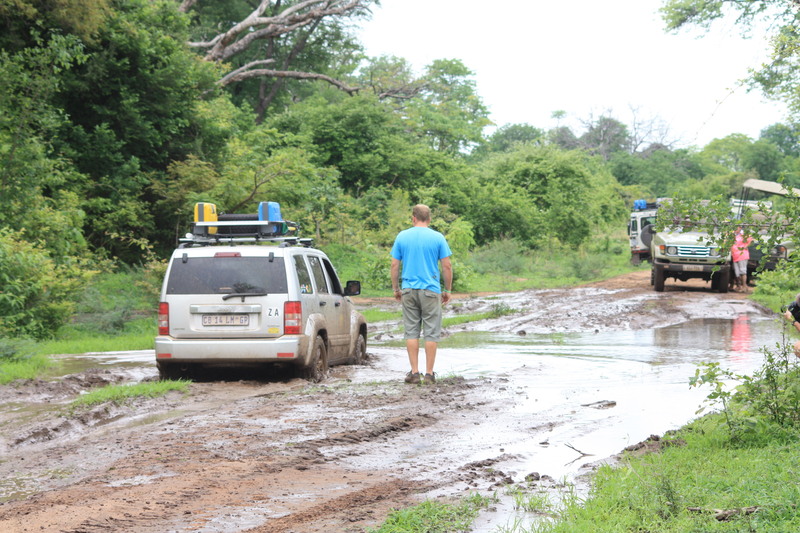 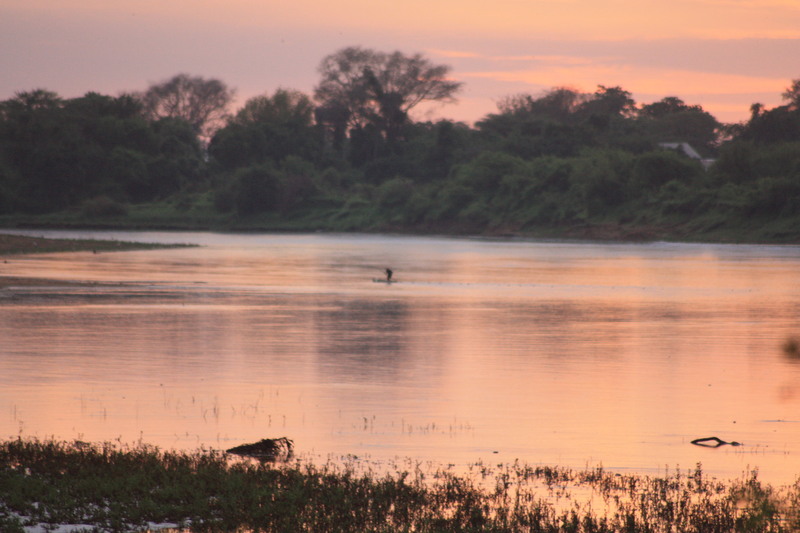 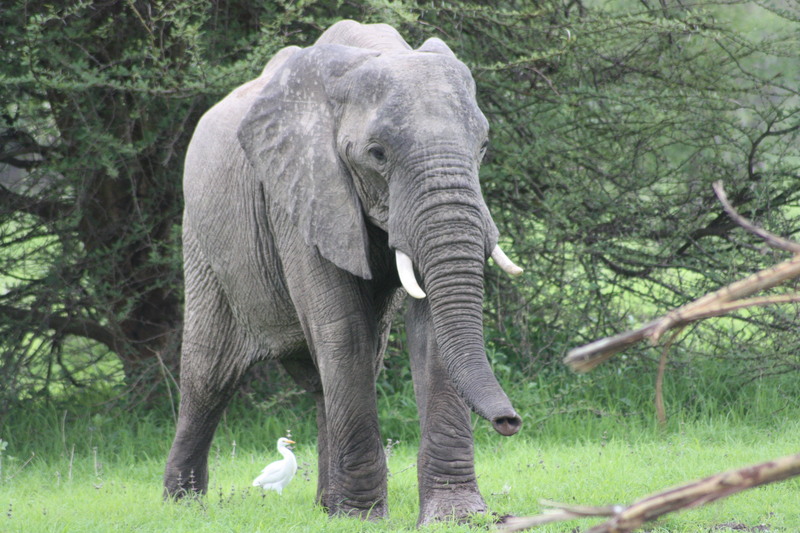 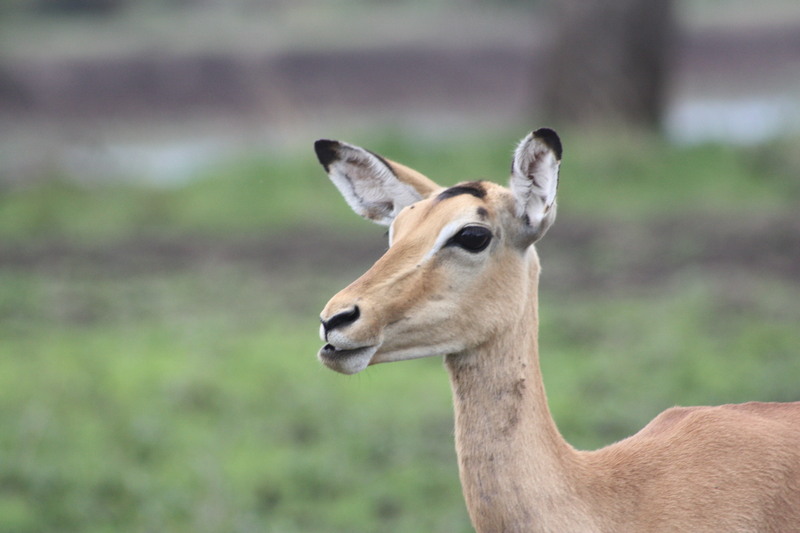 The first part of the Journey was mainly tar road from Johannesburg to Luangwa. 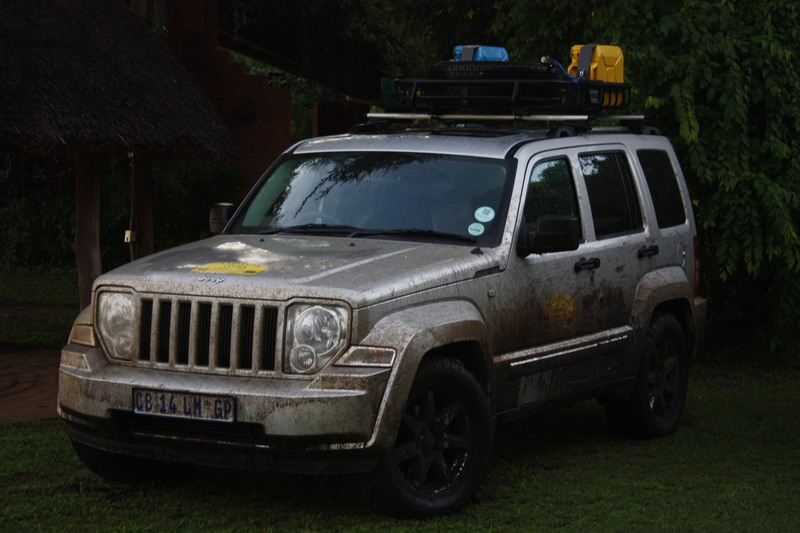 The Jeep did very well giving me an average fuel consumption of 8.2 l/100km. 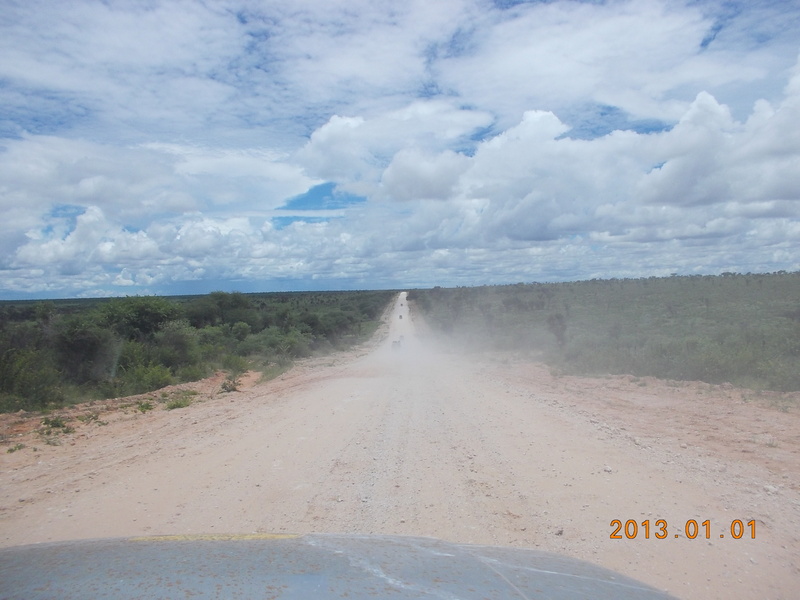 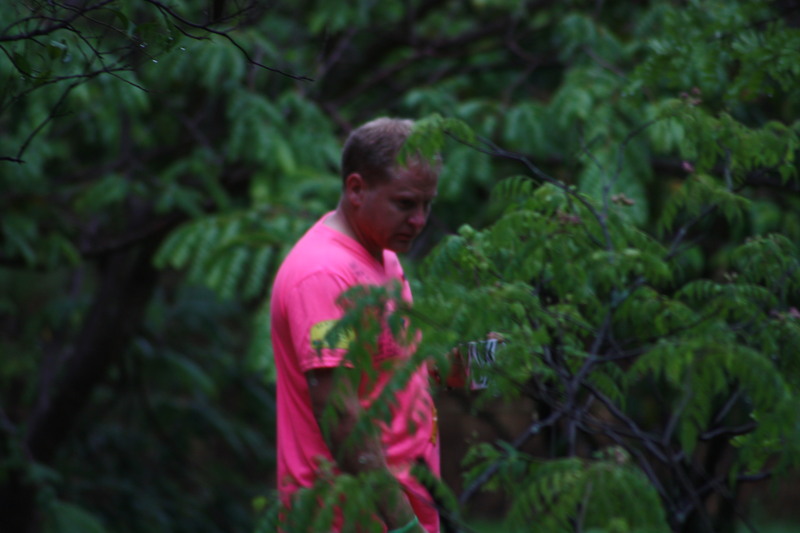 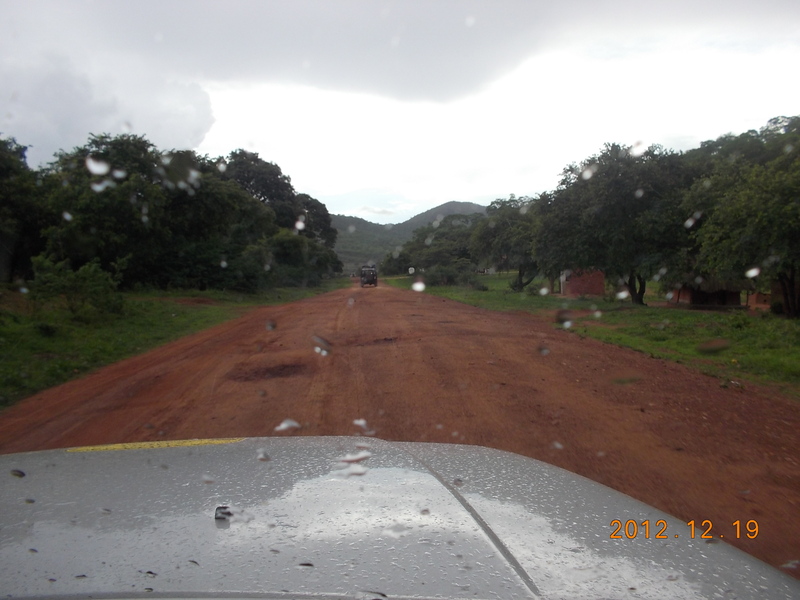 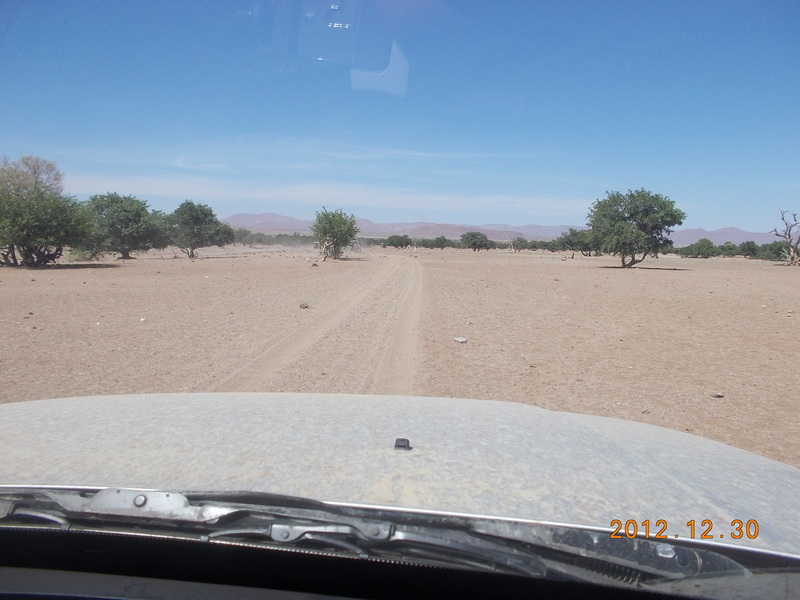 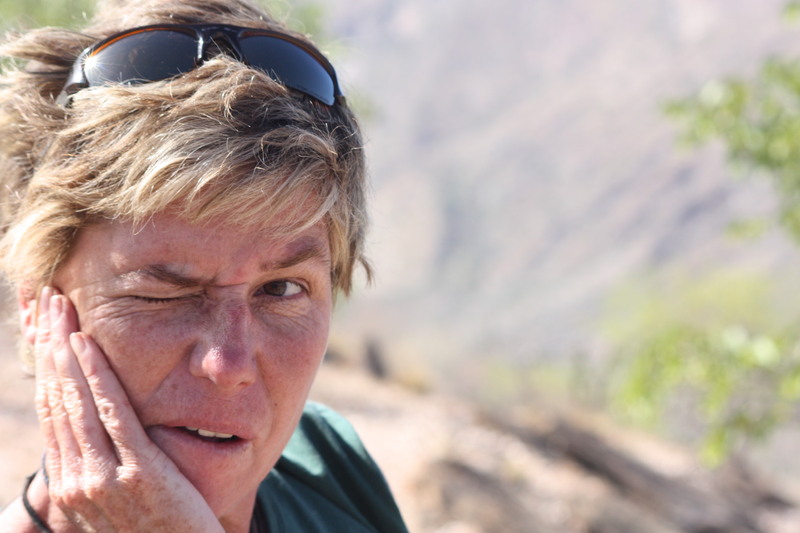 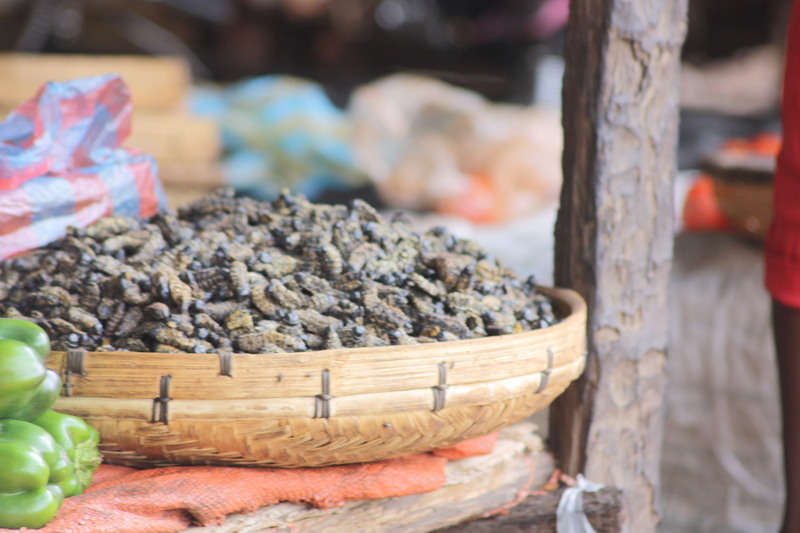 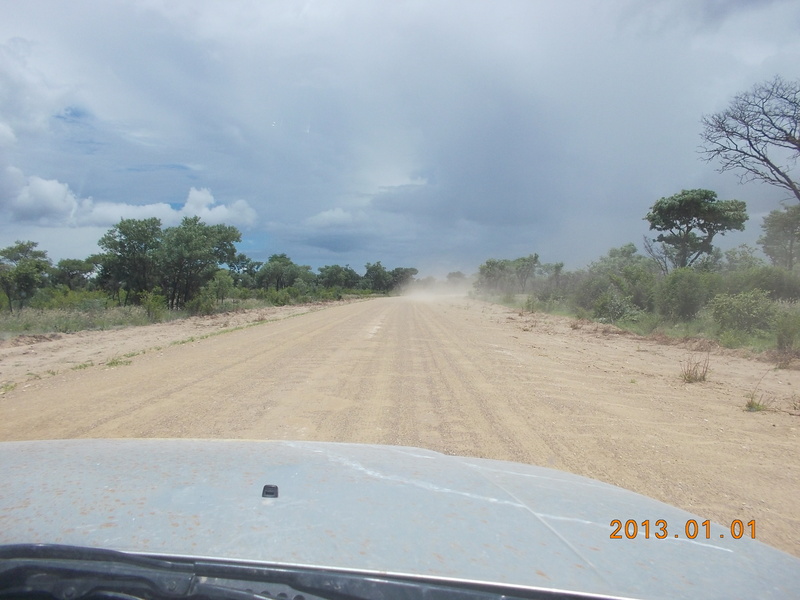 About 100 Km before Chipata, Tim pulled of the road and told us we are going to take a gravel road that is shorter and would save us some time…..yeah right, Tim, we believe you….. 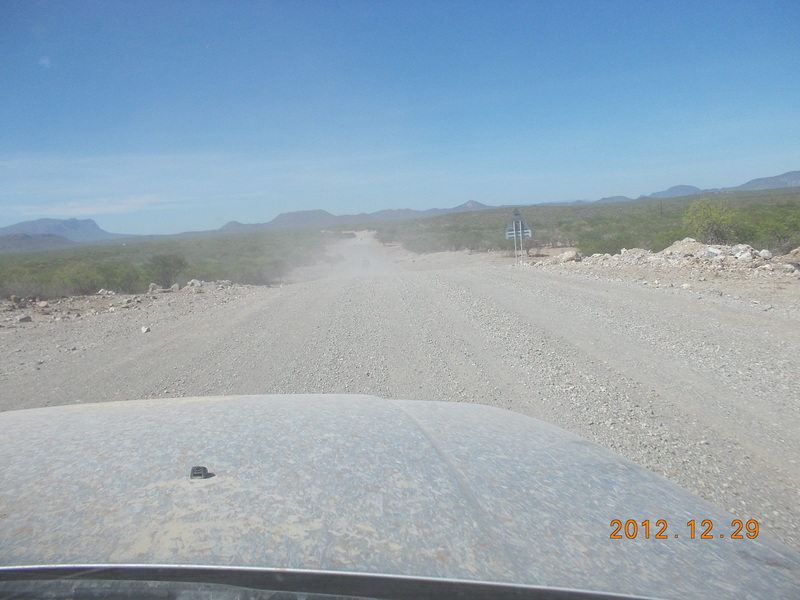 It took us 5 hours to drive that shorter route! 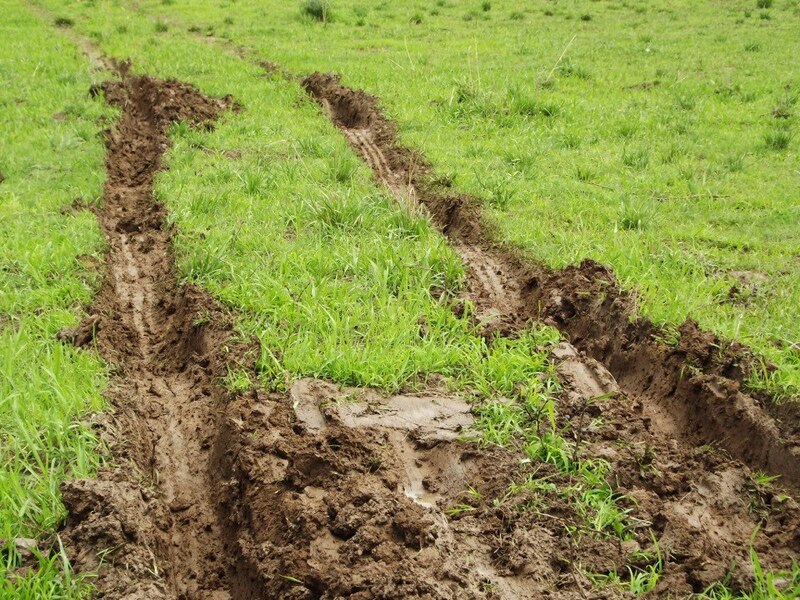 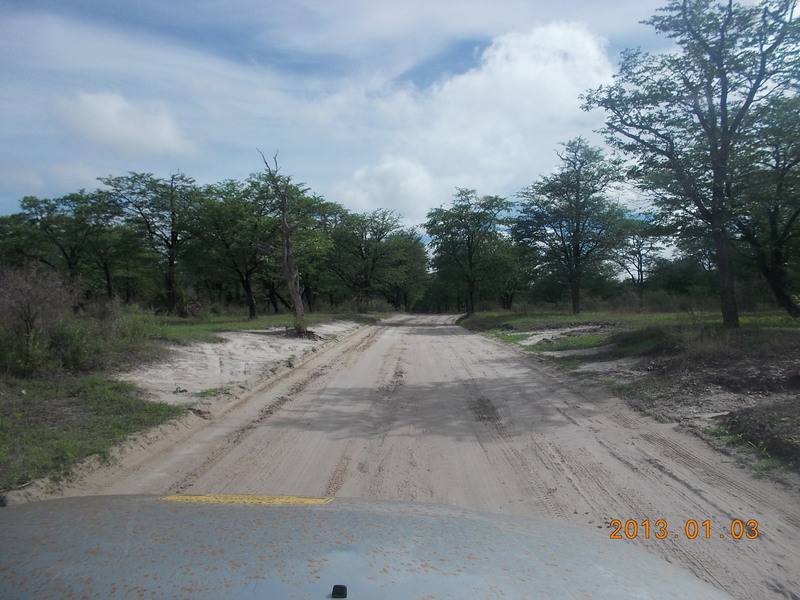 This was not an ordinary trail for a “City Slicker 4×4” I said to myself over and over whilst the Landy’s in front of me were spinning out in the thick black cotton mud of North Zambia. 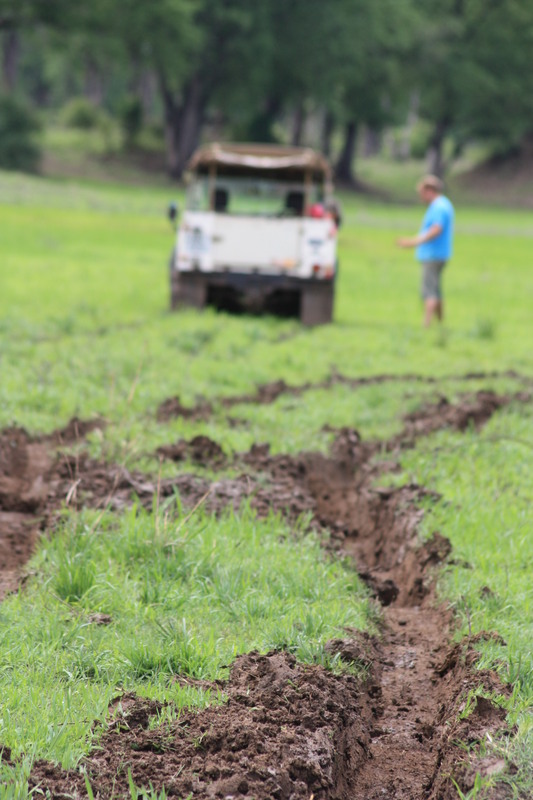 I once lost concentration and found myself stuck in this thick mud, and surrounded by cheering local kids from the side and an elderly lady giving me some 4×4 tips, and Tim every 15 seconds on the radio, asking “Jacques! 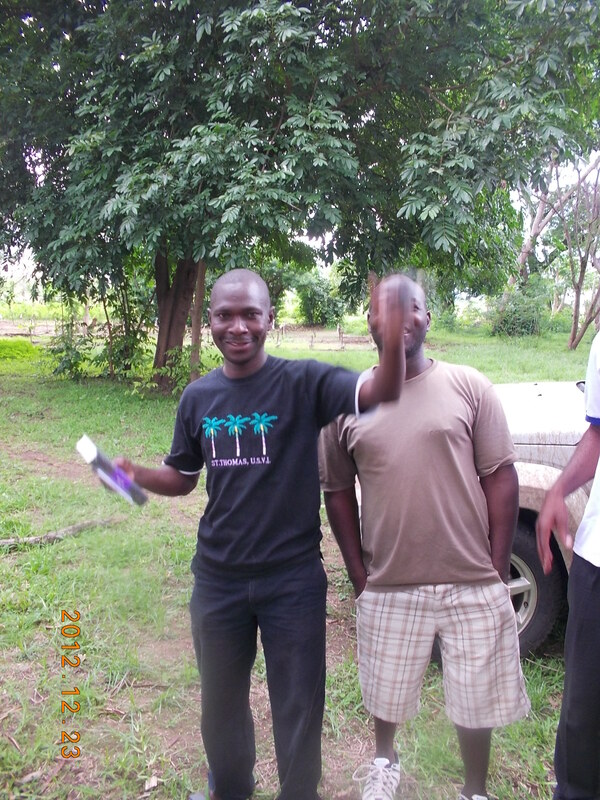 what is happening?”. 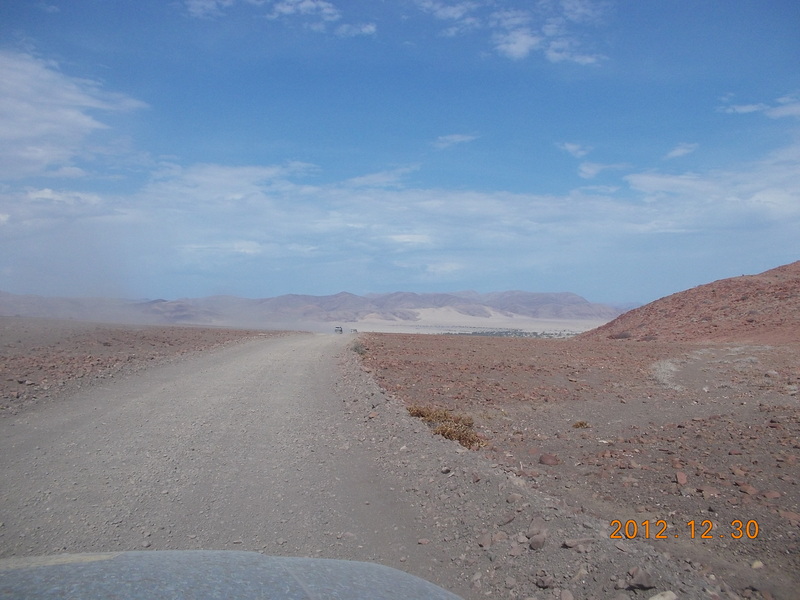 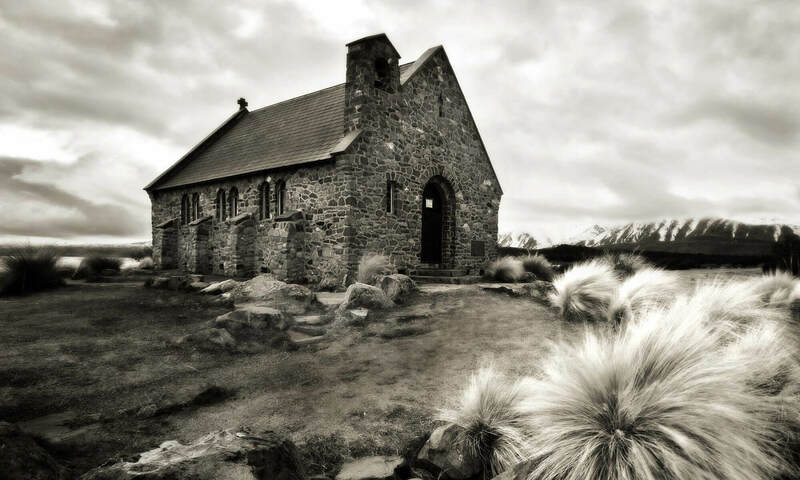 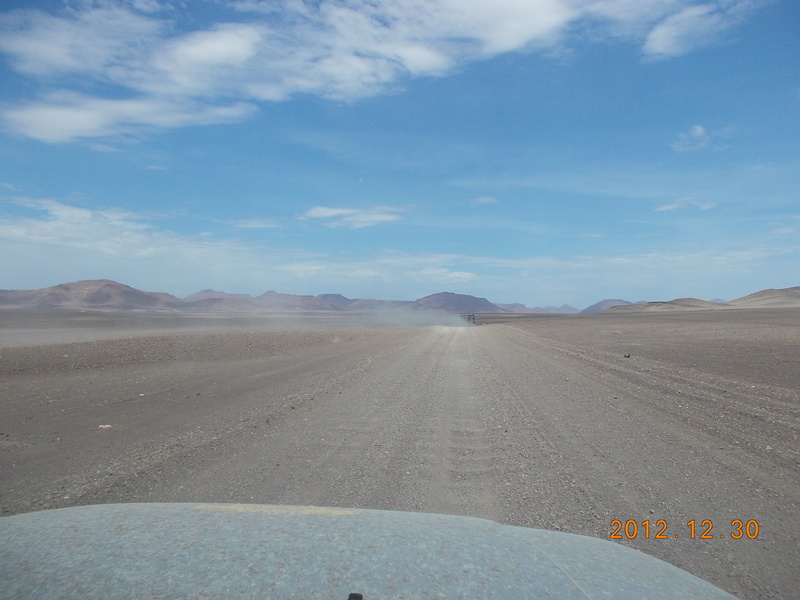 I took the radio and answered “Tim…… Do you want me to drive or talk?” With low range selected and a bit of rocking, I freed myself and was on the road again catching up to the four Land Rovers moving at a constant speed through a terrain that just showed blank on my GPS. 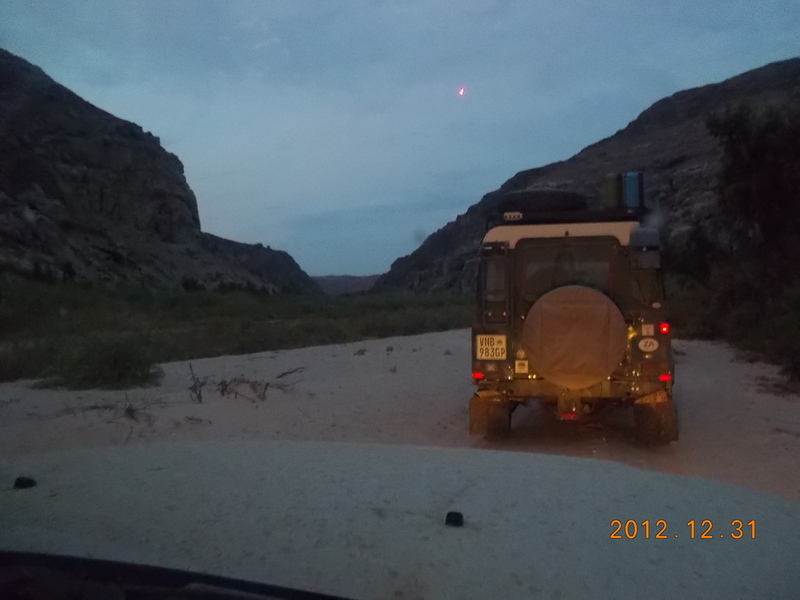 As it was getting dark we found a river crossing, not the first of the day, but one that Tim walked and was not comfortable with. 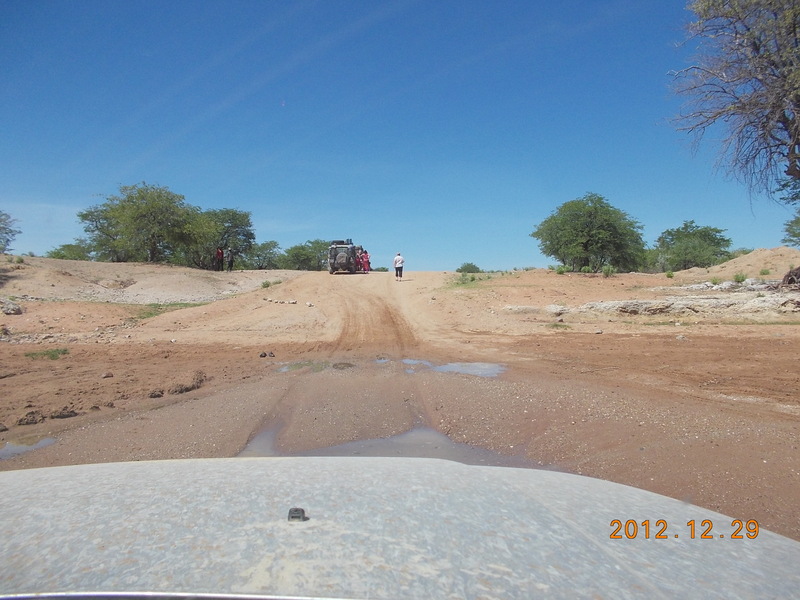 So we were forced to take an alternative route that was definitely not a standard route for a “City Slicker 4×4”. 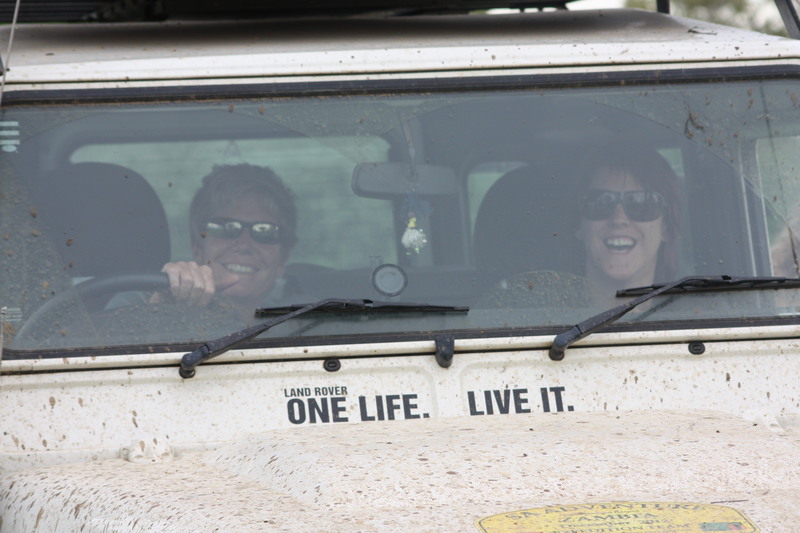 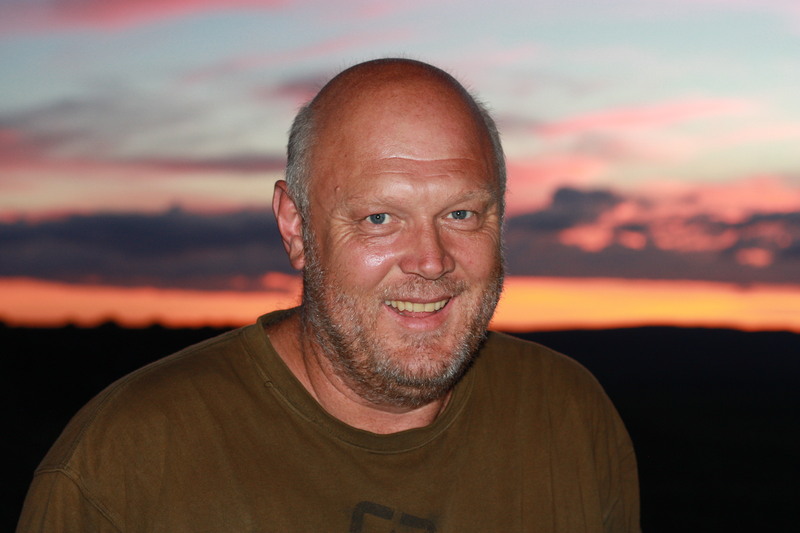 Tim was smiling, saying “Here is a new route for Tracks4Africa.” Pushing through mud holes, potholes and ditches I just focused on the two small red lights of the Landy in front of me. 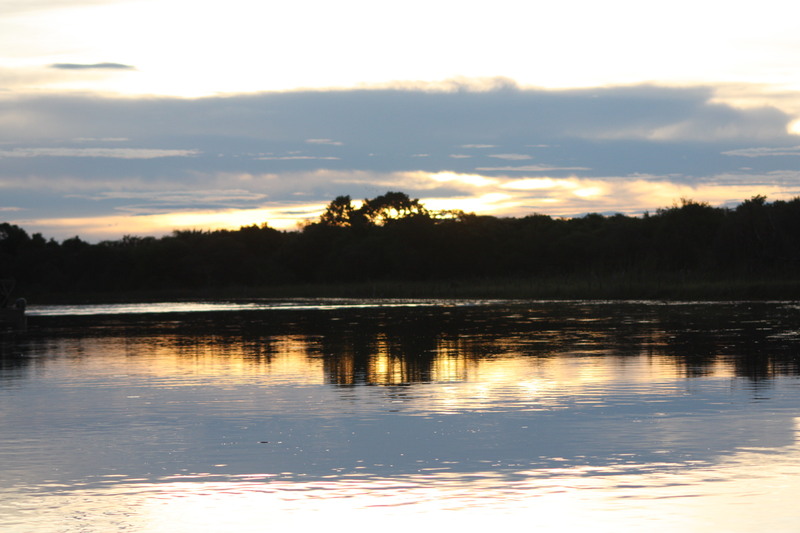 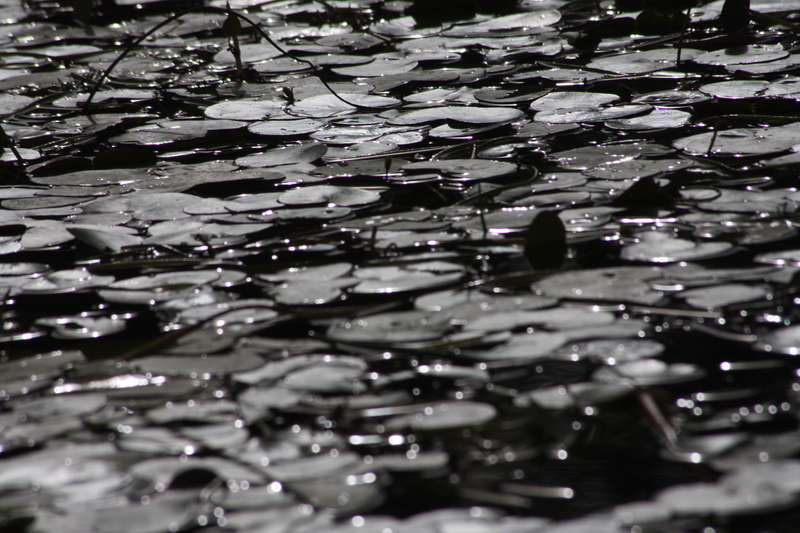 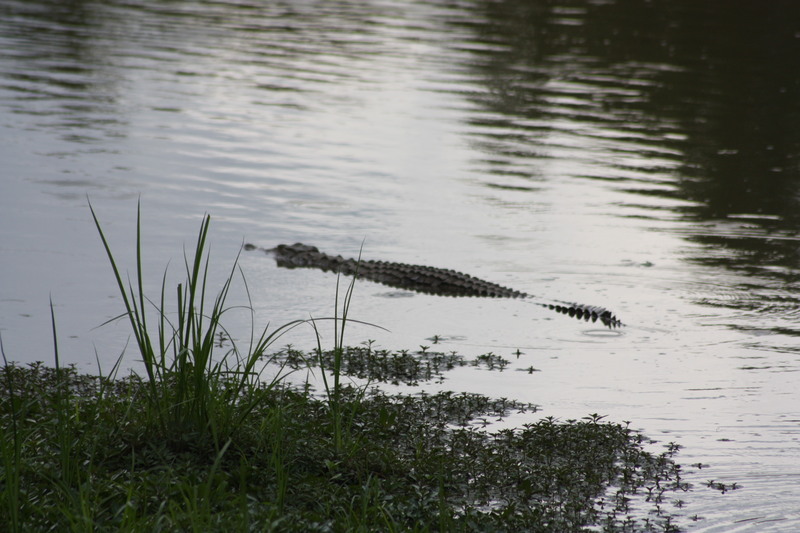 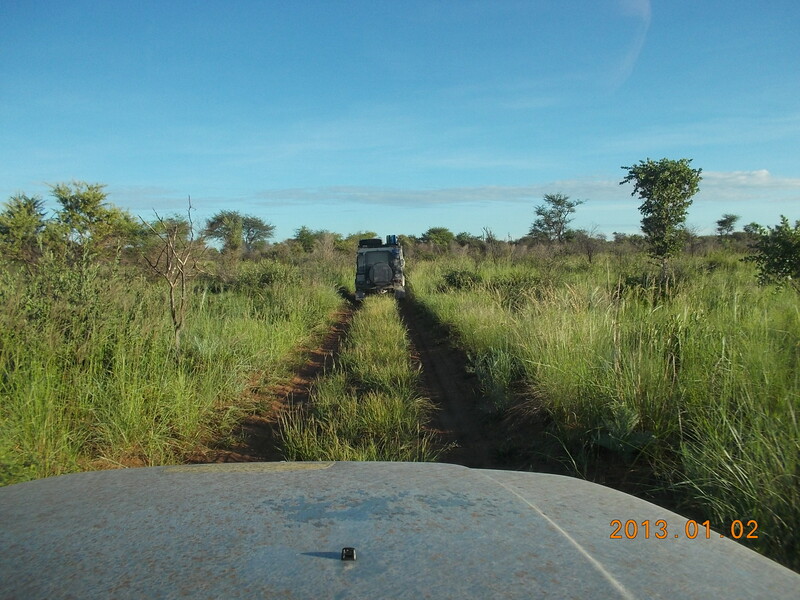 Eventually, we got to Croc Valley Camp. 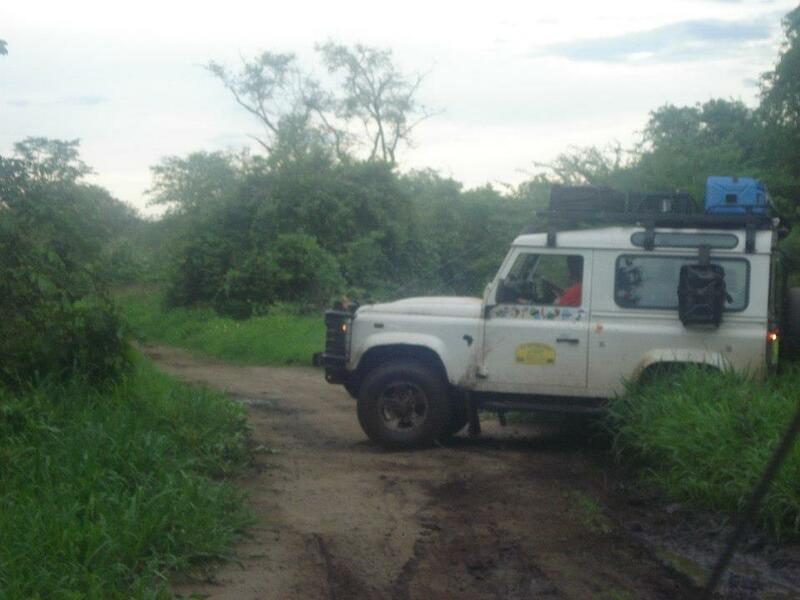 On arrival, the owner came out to greet us, and with shock on his face said “I can’t believe you came through that route! 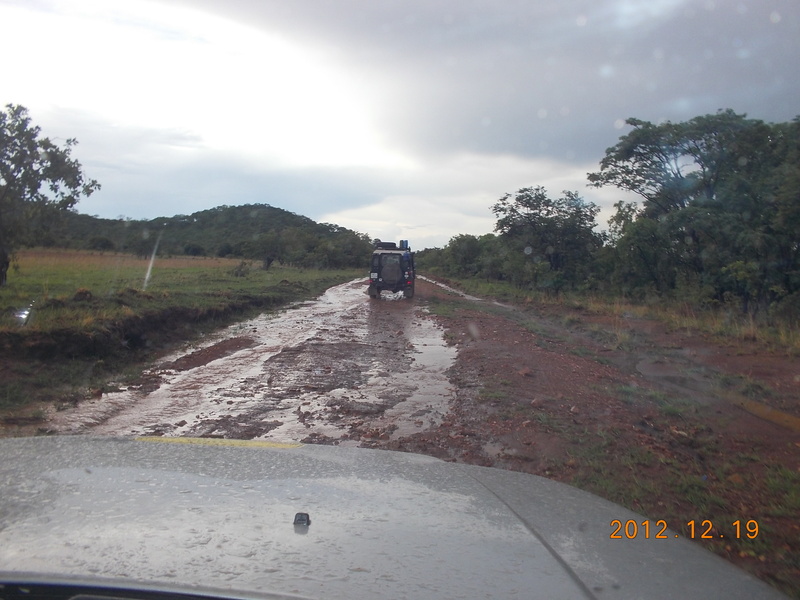 That road has been closed due to the rainy season”. 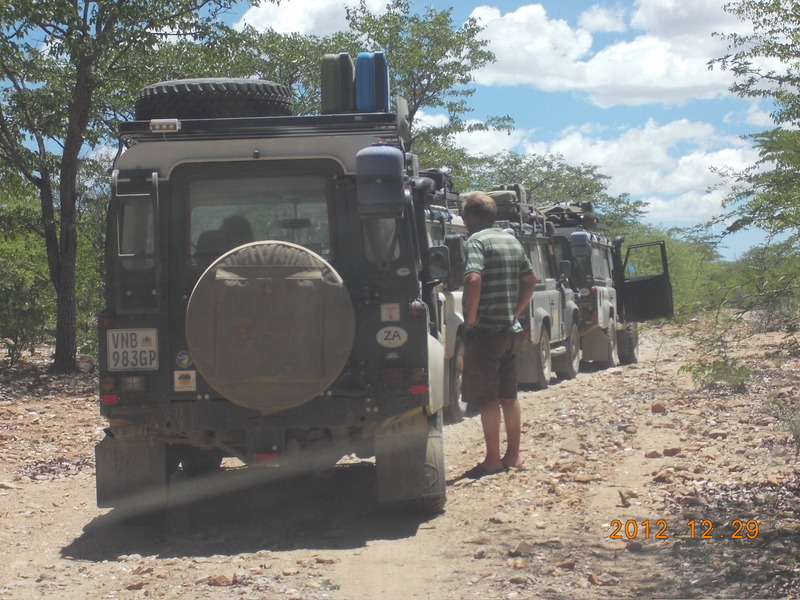 Thanks Tim we really saved some time…but it was a great ride, best ever, that you will not find on any standard 4×4 trail. 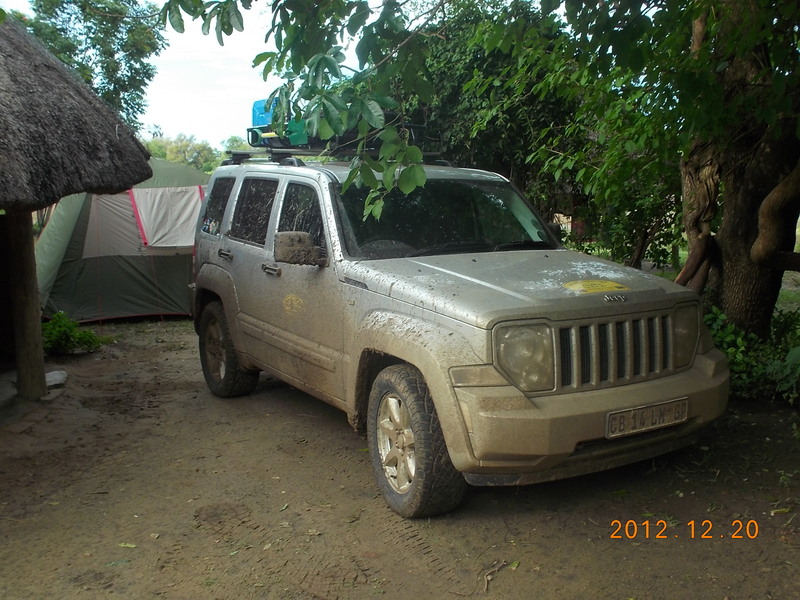 The next morning walking around the Jeep I was shell shocked to see the thick mud all over the body and under the car, understand, my car gets washed 3 times a week! 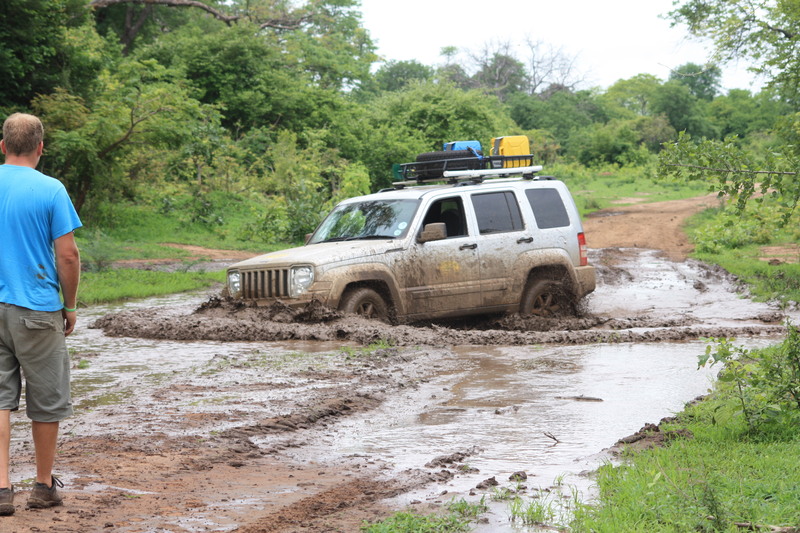 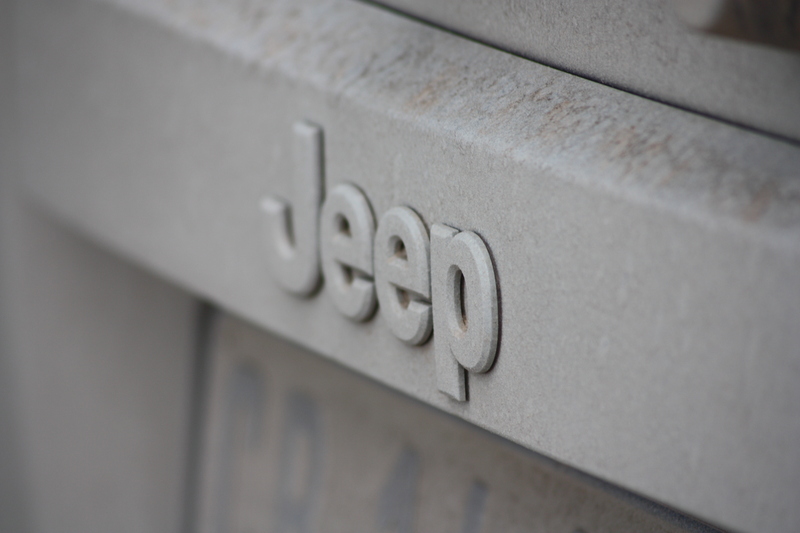 Tim just kept on saying; “This is now a proper 4×4.” Michele decided to give the Jeep an official name “ WILSON.” The meaning…………..the son of Willys. 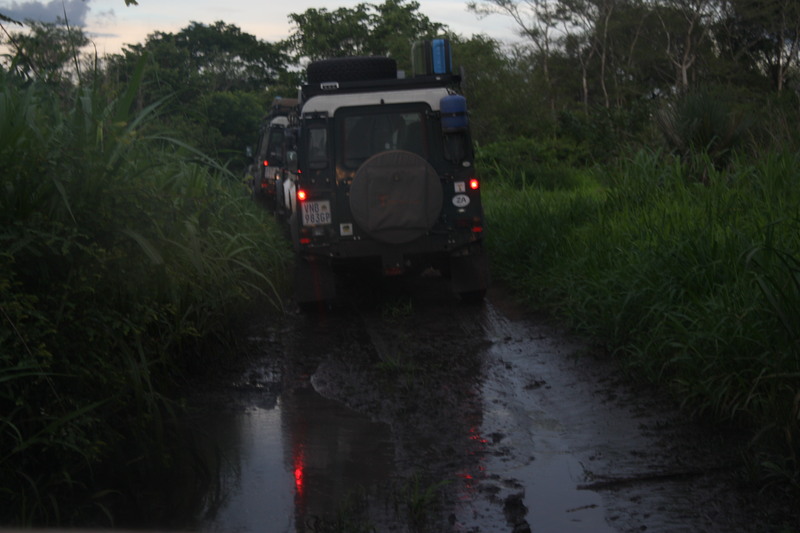 This made my stomach turn a few knots with concern, but off we drove to the park, I could not believe what Tim was doing when he took the first mud road off the main gravel road………… Proudly, after 4 hours of tough going we eventually got back to the camp, and after seeing some beautiful game, “Wilson” did not even get stuck once while watching the Land Rovers pulling and winching each other through the mud. 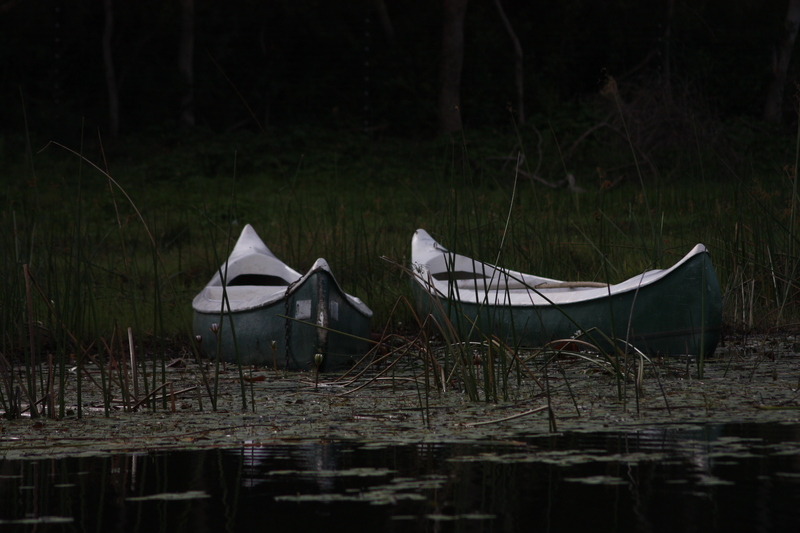 Sure they were much heavier than “Willson” I agreed sitting at the camp fire that night. 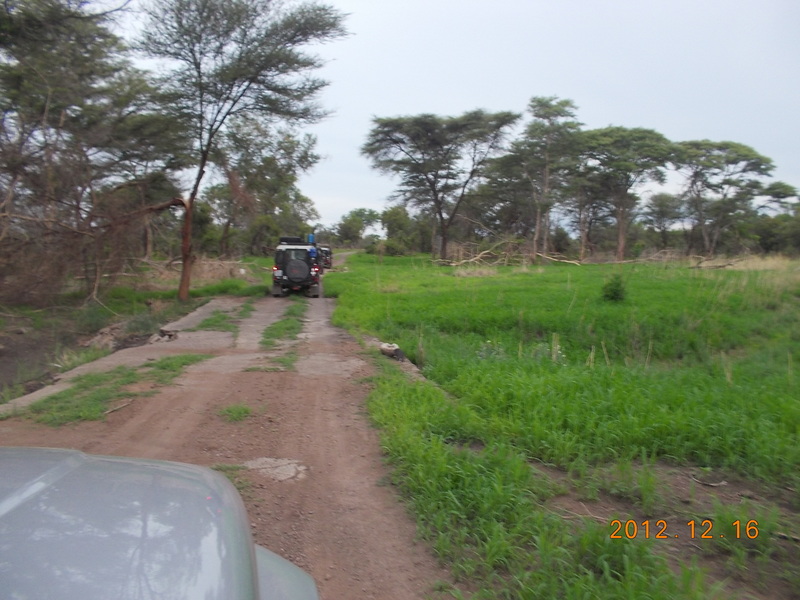 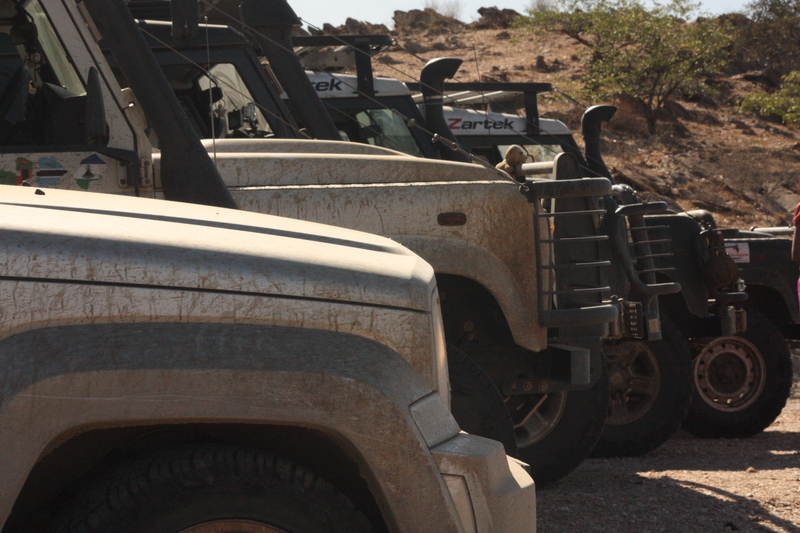 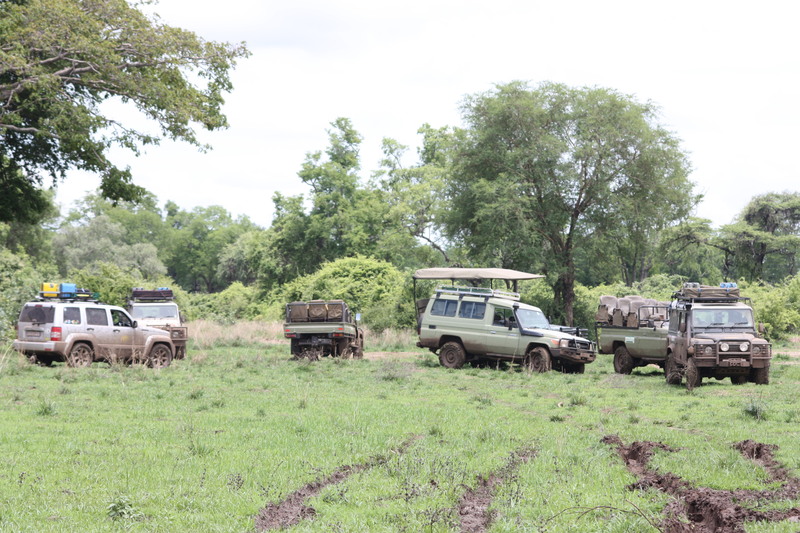 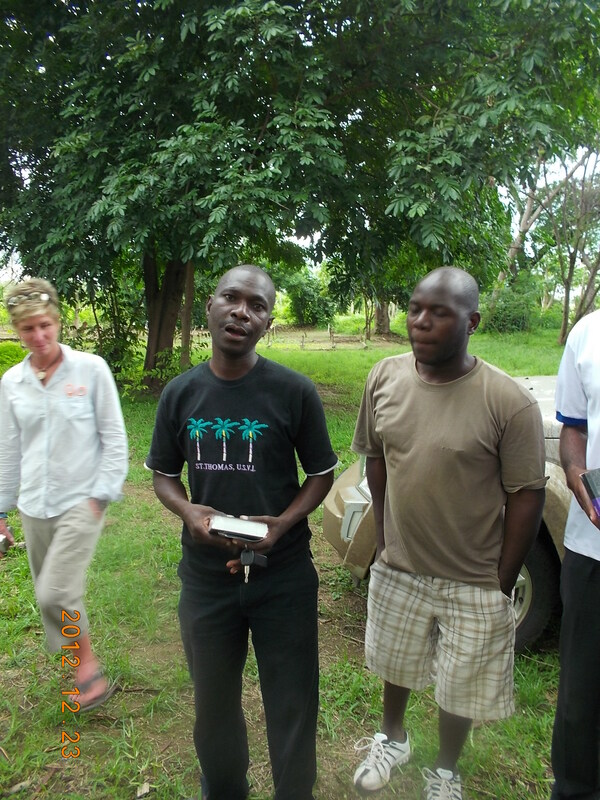 Tim was asked to give 4×4 training to some of the local Game Rangers in the area. 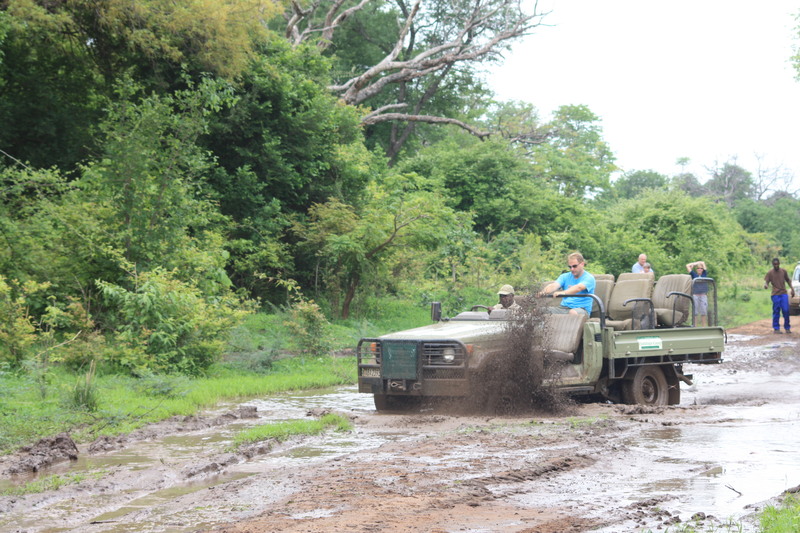 So off we went looking for the mud hole where an elephant got stuck in, the drive looking for this mud hole was an awesome experience on its own. 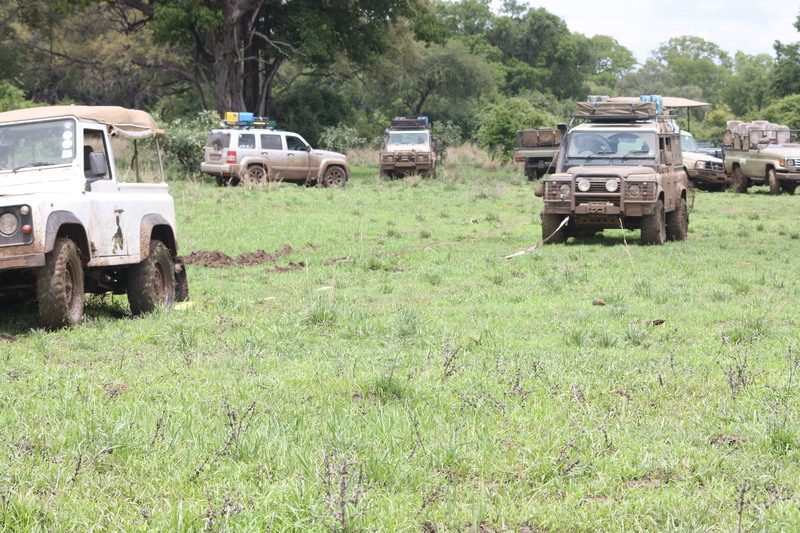 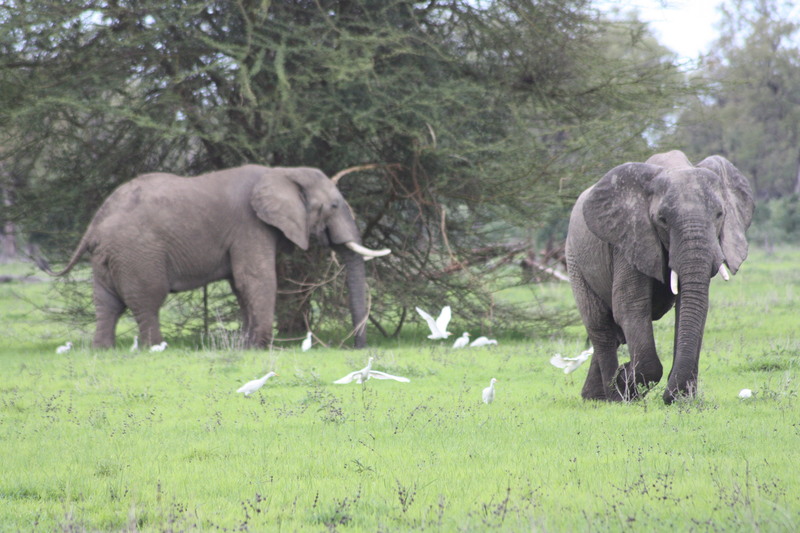 We stopped at a water hole, not the one the elephant got stuck in, but one… that the track around the hole clearly stats that everyone is trying to avoid this mud hole. 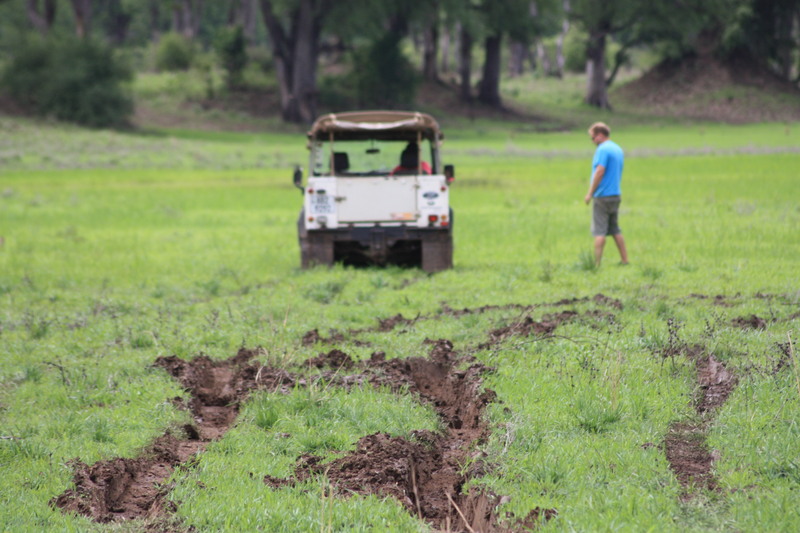 Tim got all the Game Rangers together and did his thing, explaining the basics of 4×4 driving and off we went one by one through the mud holes. 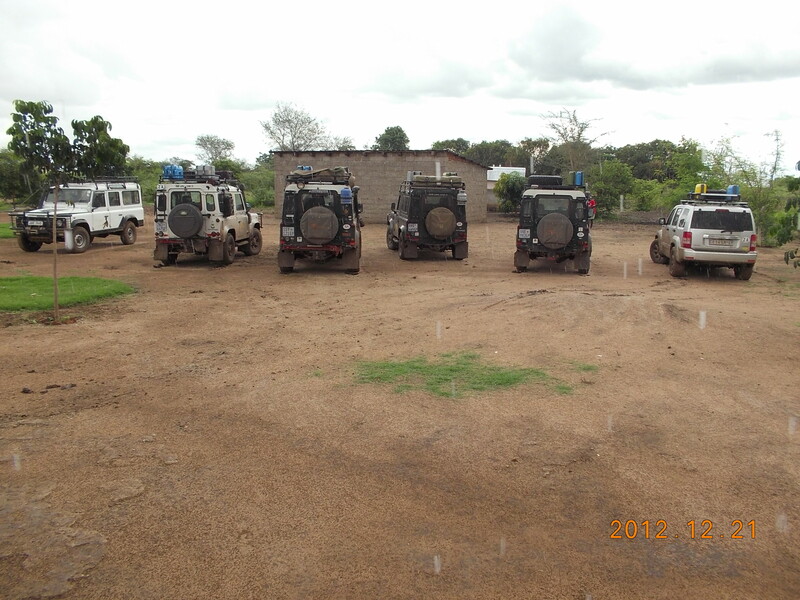 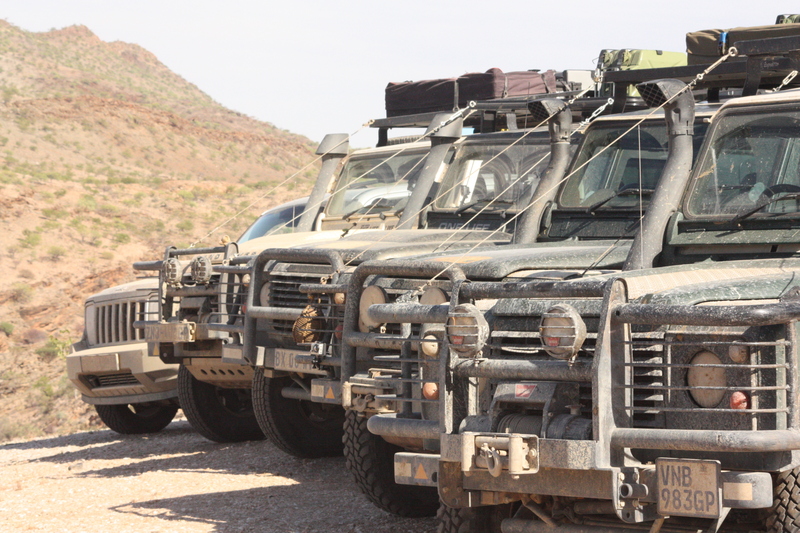 Land Rover, Land Rover, Land Rover, Land Cruiser, Land Cruiser, Land Rover, Land Cruiser, Land Cruiser and the JEEP. 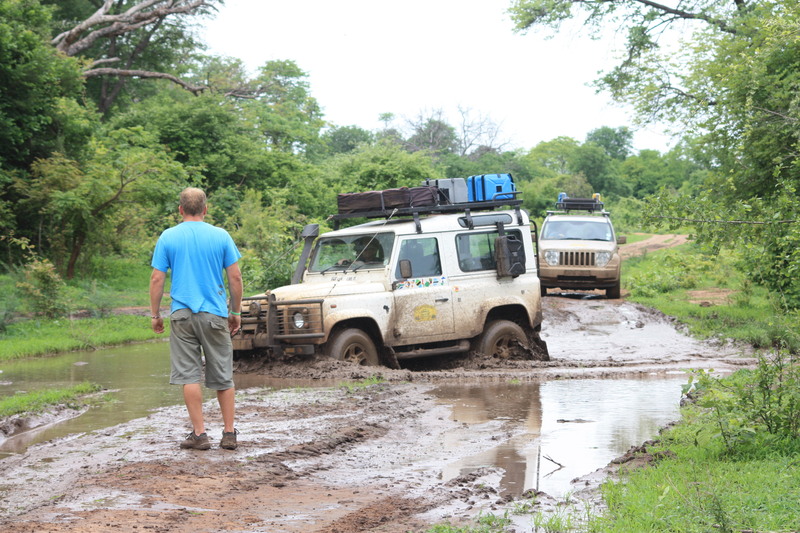 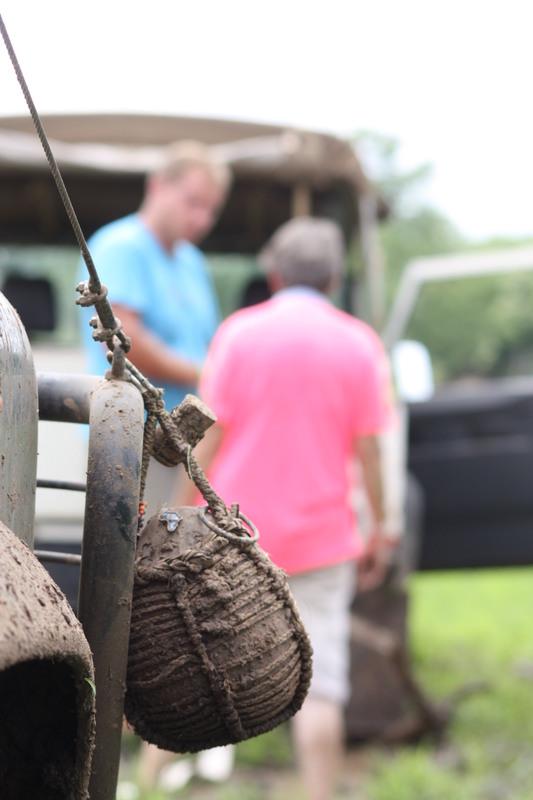 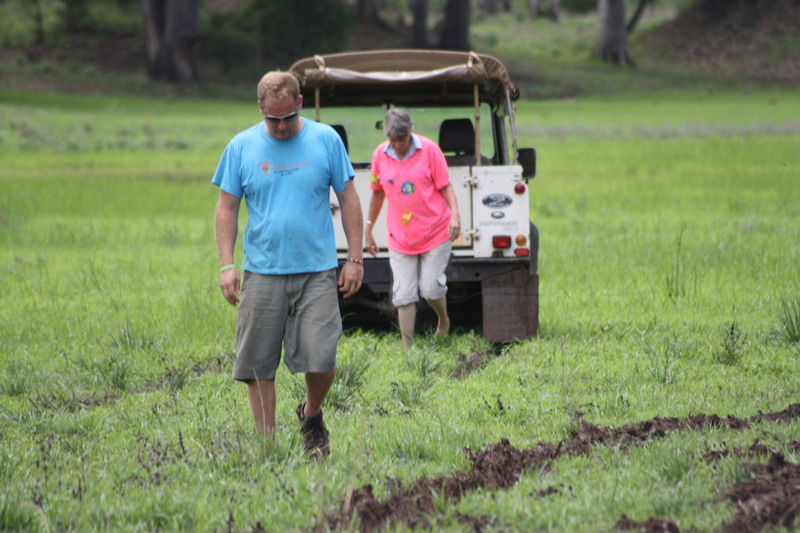 Once Tim felt we all conquered the mud hole and that the Game Rangers, after all these years, knew what a Diff-Lock was, we were off again to find the elephant mud hole. 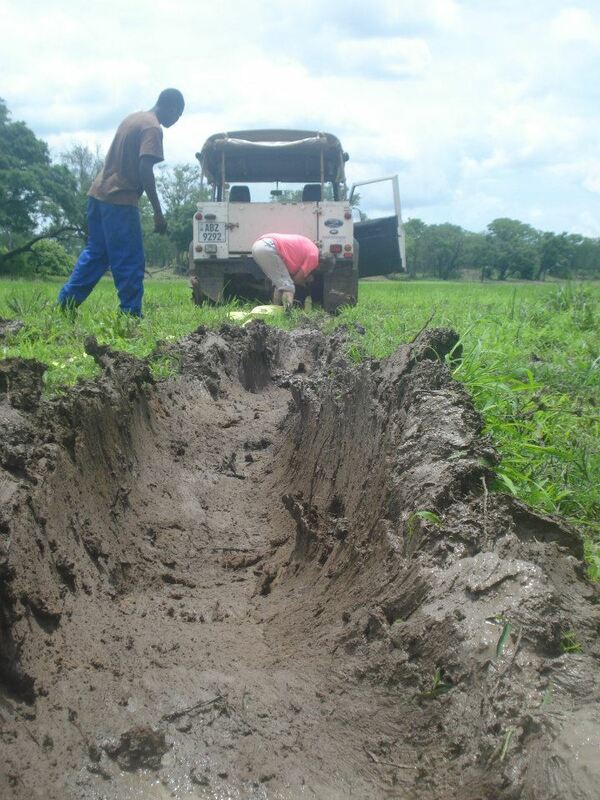 Then we found some serious mud, I was not sure if this is where the elephant got stuck but this is where the playing started. 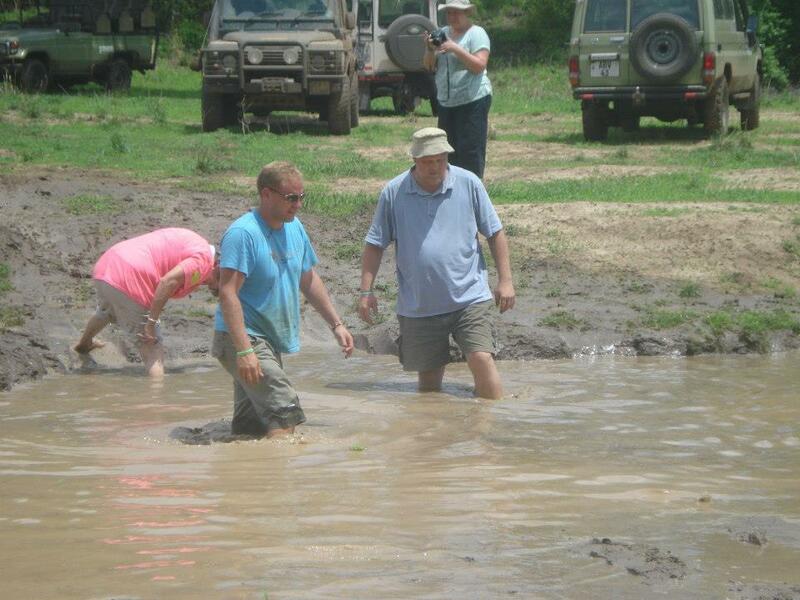 Once again “Wilson” did me proud and did not get stuck. 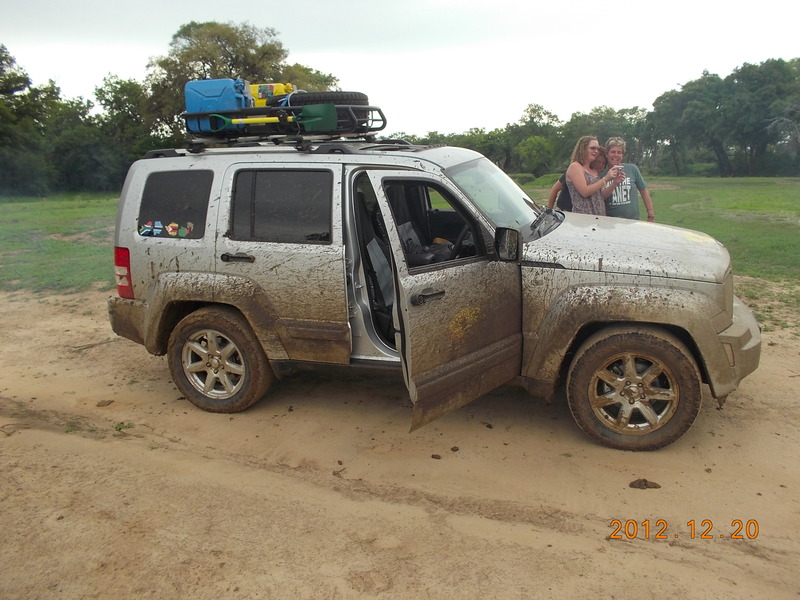 The only problem I experienced so far was the thick mud caught up under the Jeeps plastic protection covers. 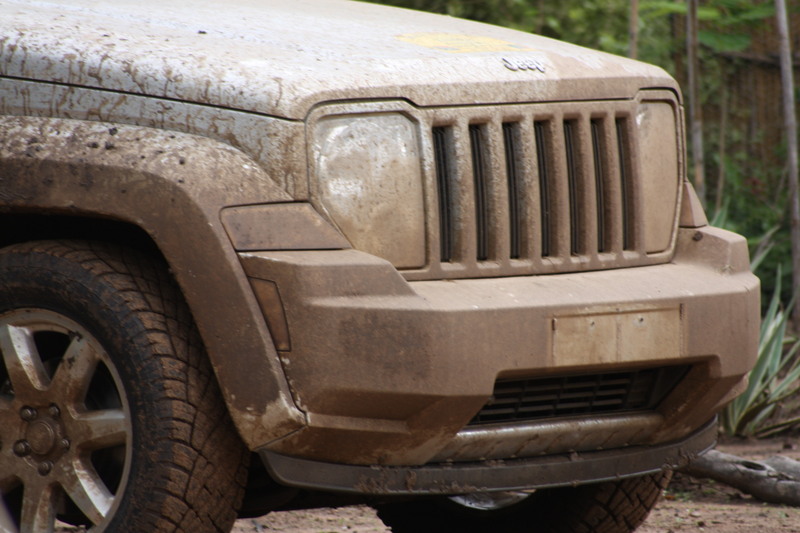 The steel covers was fine but there was a huge plastic cover that gathers so much mud that the plastic clips were pulling out and the plastic cover was hanging a few inches from the ground. 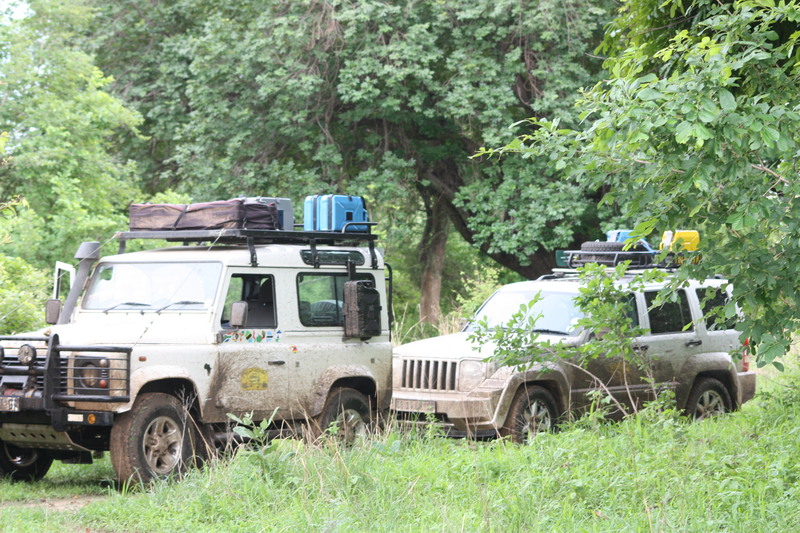 We reached a watery mud hole that took most vehicles two to three attempts to get out of, but they all made it. 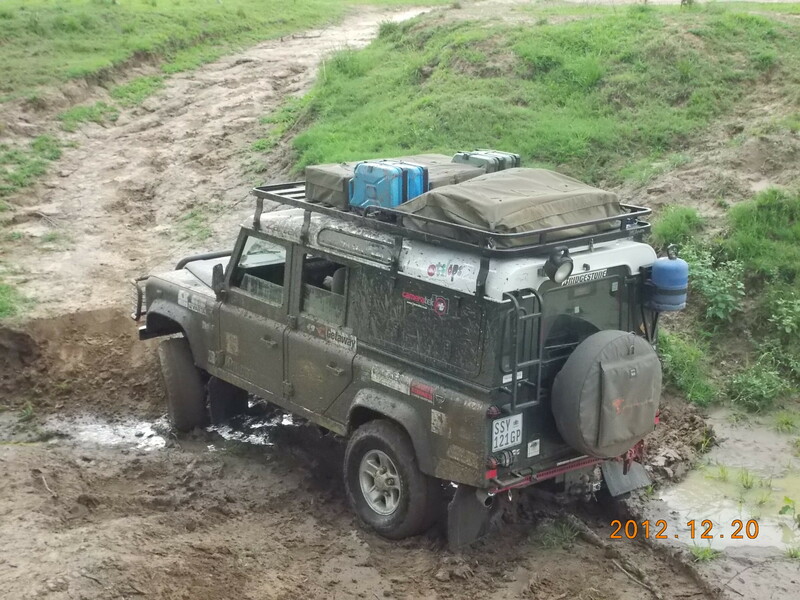 “Wilson” had to abandon the effort after the second attempt due to the water pressing against the huge plastic bumper and the force of the water started to unclip the bumper and in the process the number plate was pulled off by the force of the water. 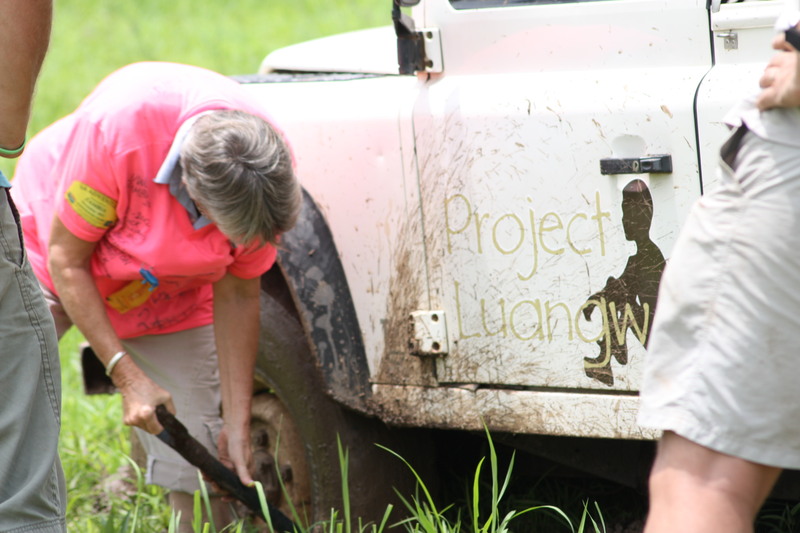 When we were back on dry ground, we all jumped into the mud looking for the number plate. 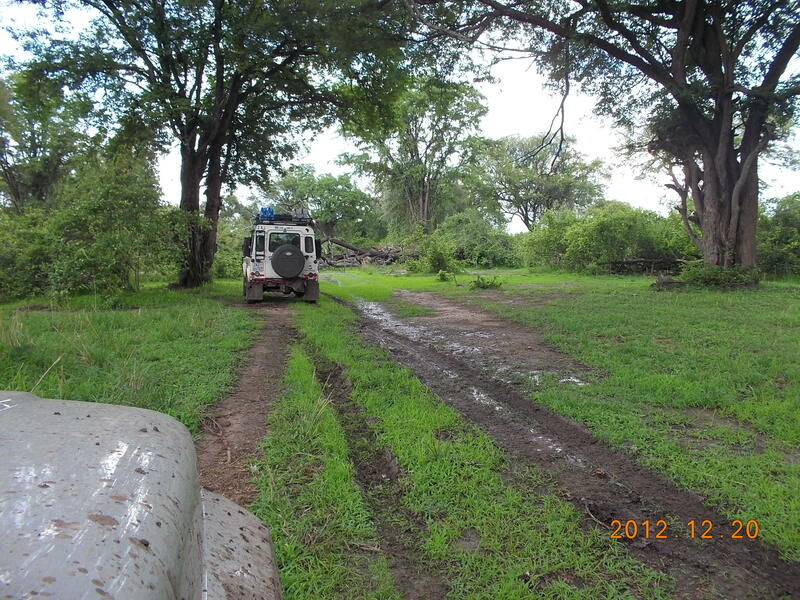 Once we found it, it was clear the last Land Cruiser drove over it. 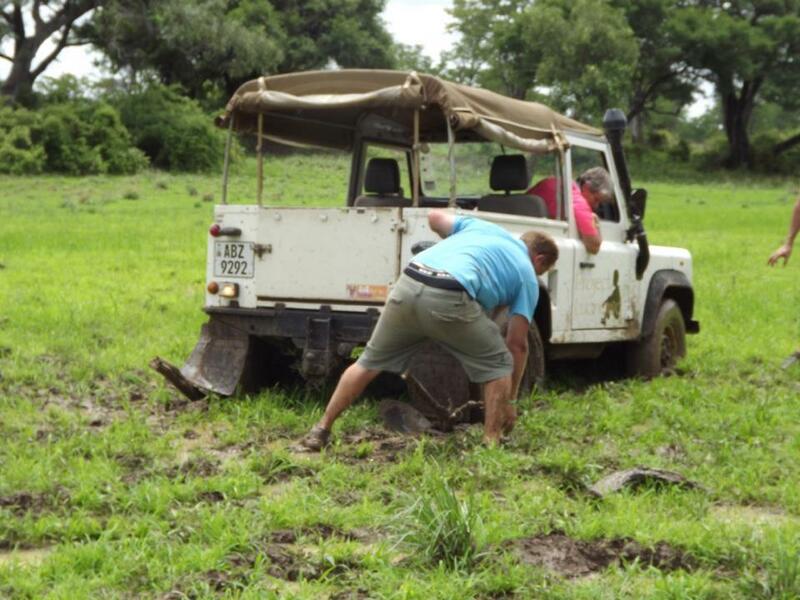 We clipped the bottom part of the bumper back on and off we were to the next challenge. 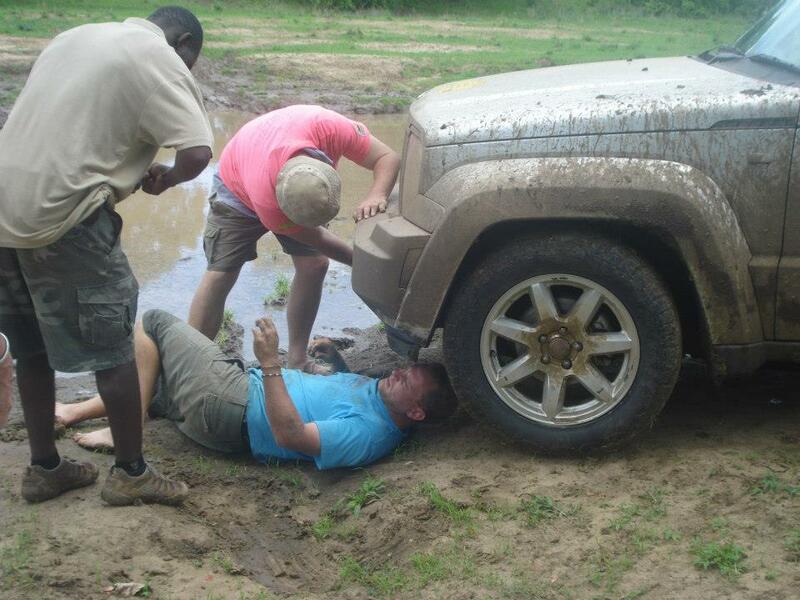 All was well but somewhere in the process, “I lost a toenail!” The next day I found a washing bay with a pit and a high pressure washer (“if you can call that high pressure”) and sprayed off most of the mud that was stuck in the plastic cover. 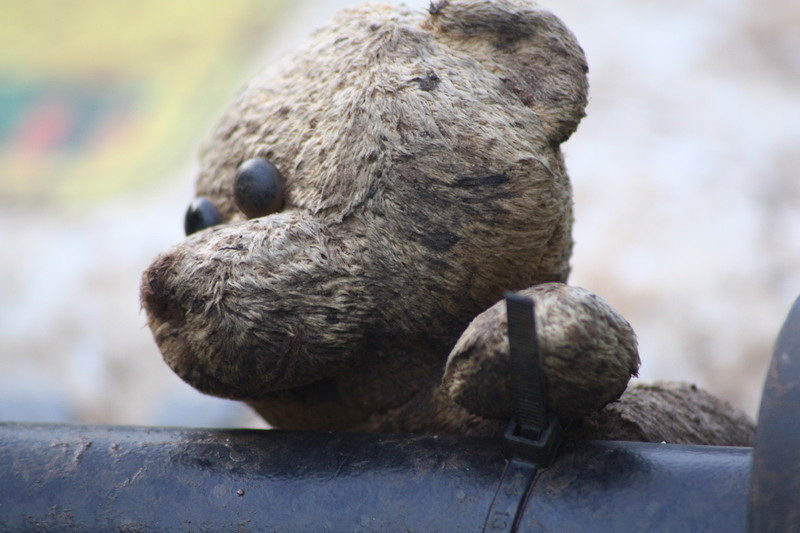 The cover was hanging; clearly the plastic brackets were stretched from all the mud. 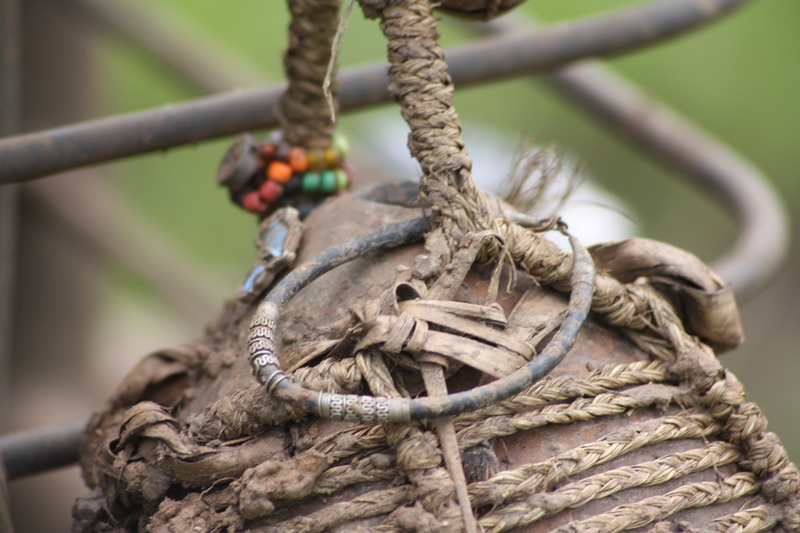 I added a few cable ties to make sure it did not come off totally. 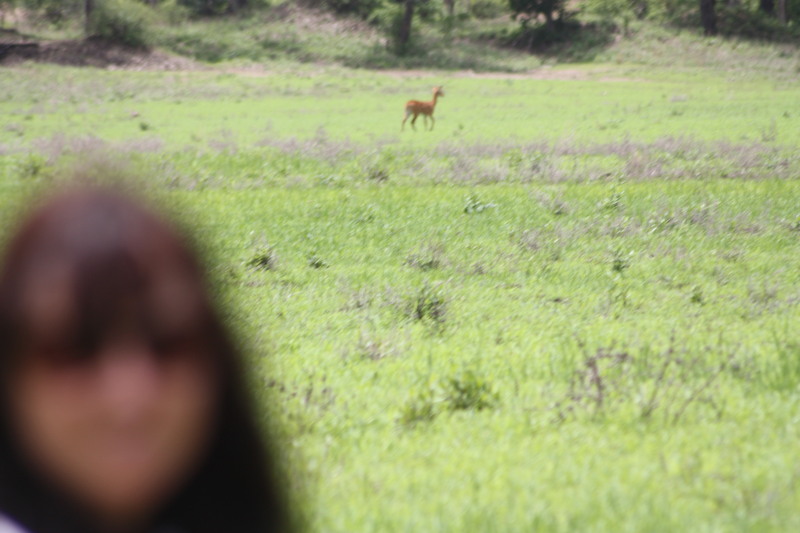 Maby. 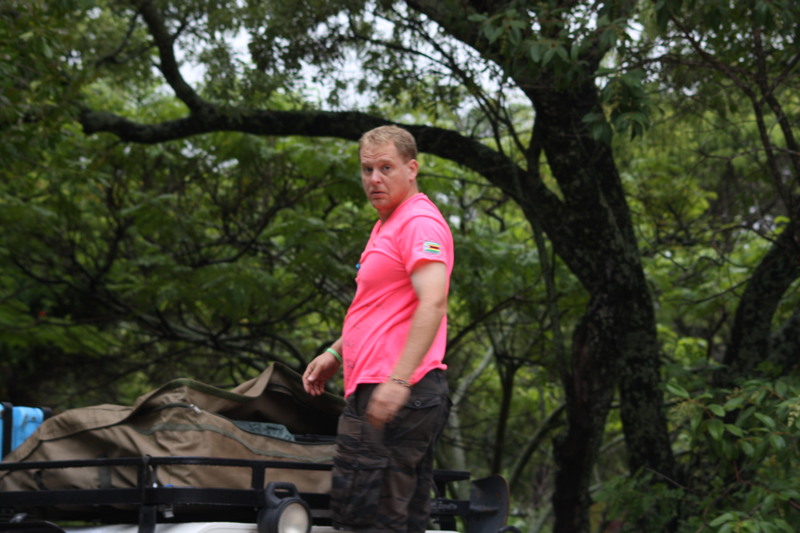 maby one day i will tell you the story of the pink shirt! 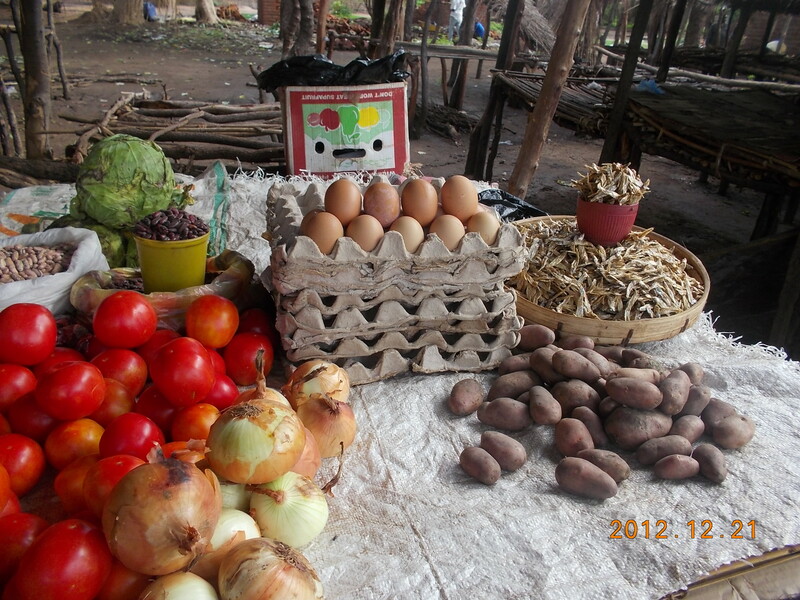 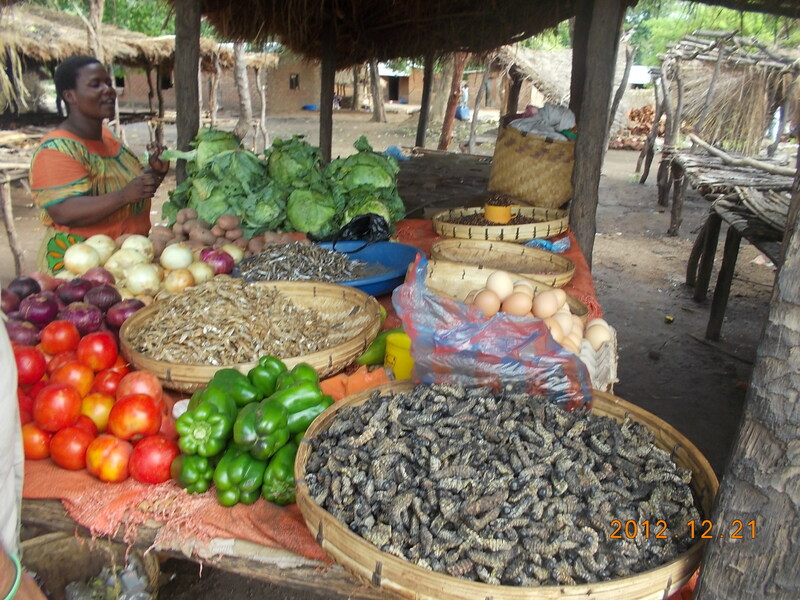 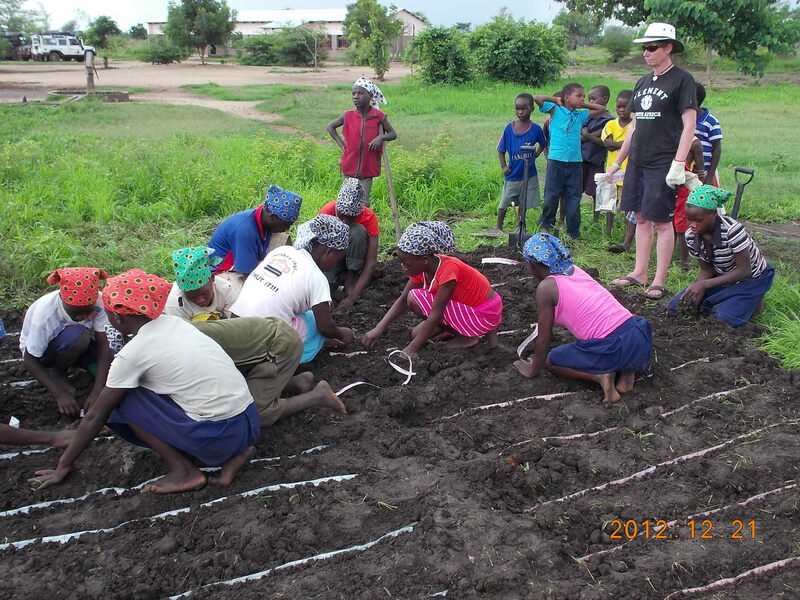 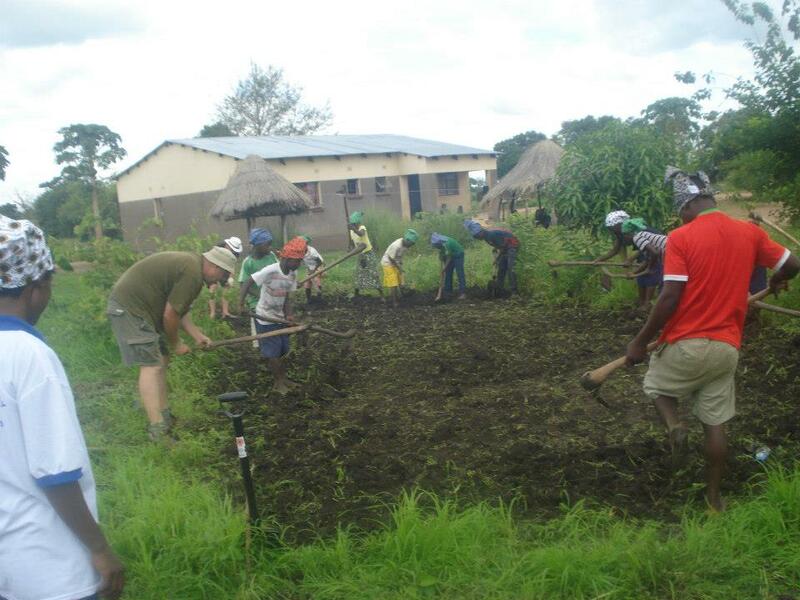 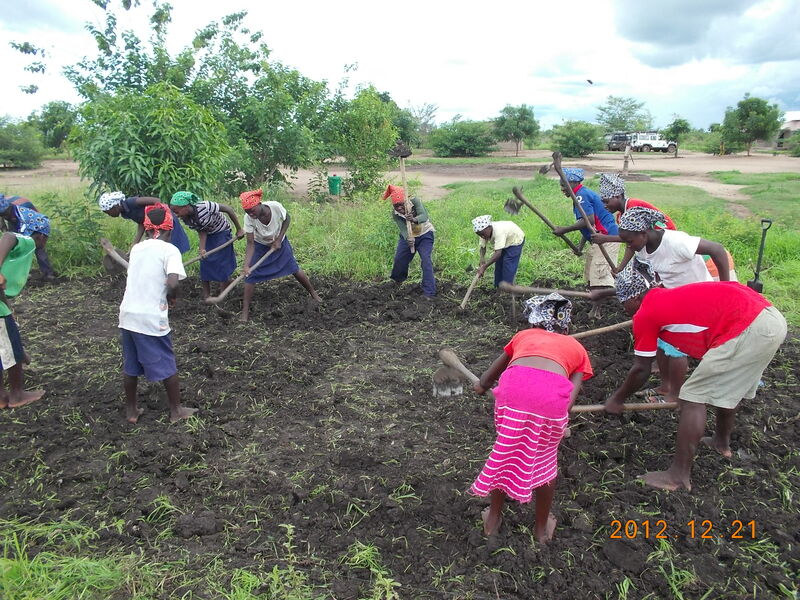 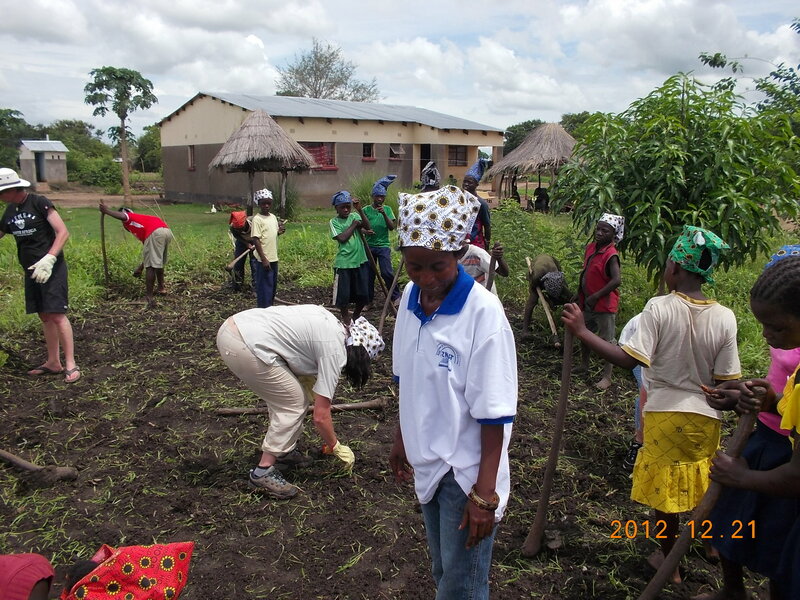 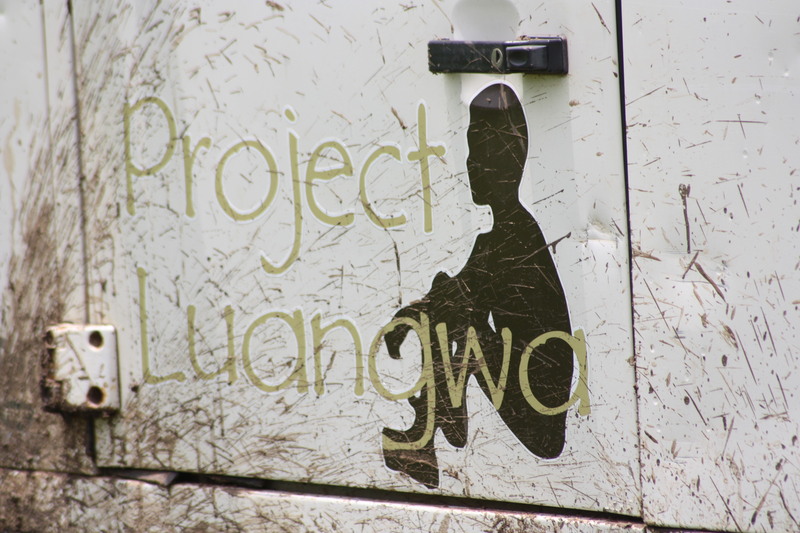 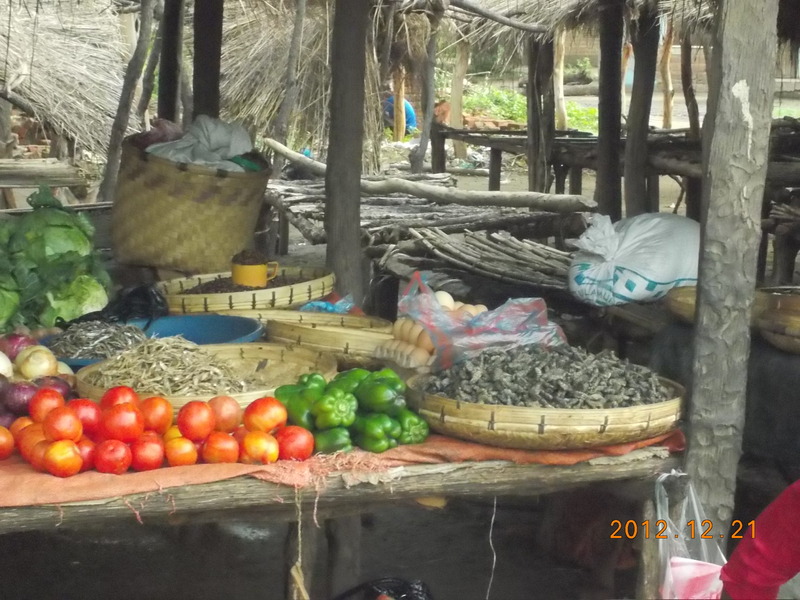 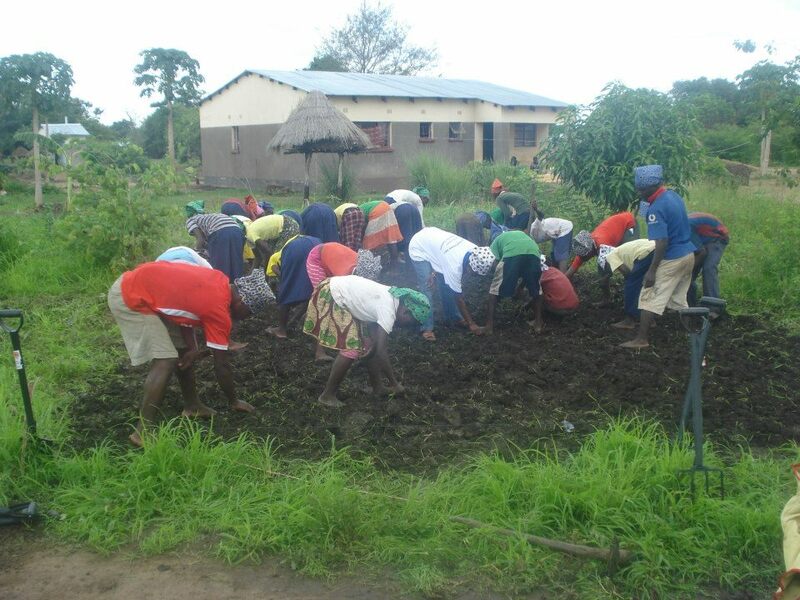 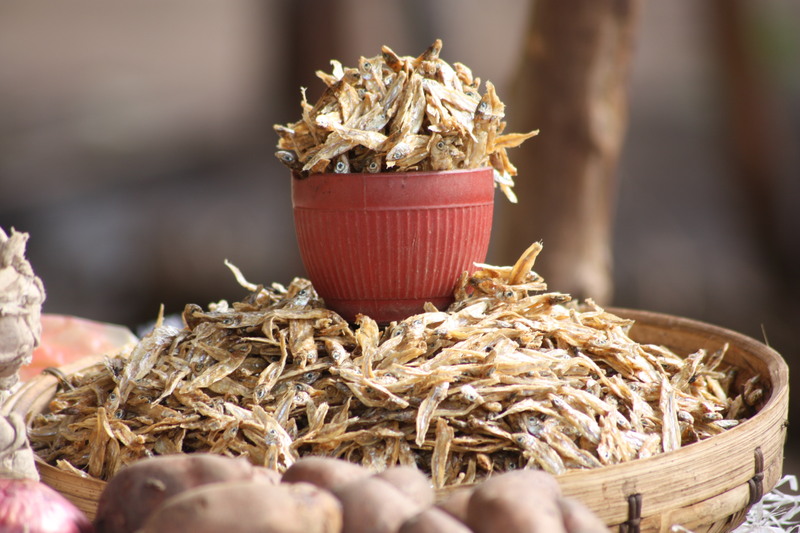 The goal of the expedition was to plant a vegetable garden at one of the schools of Project Luangwa in Zambia. 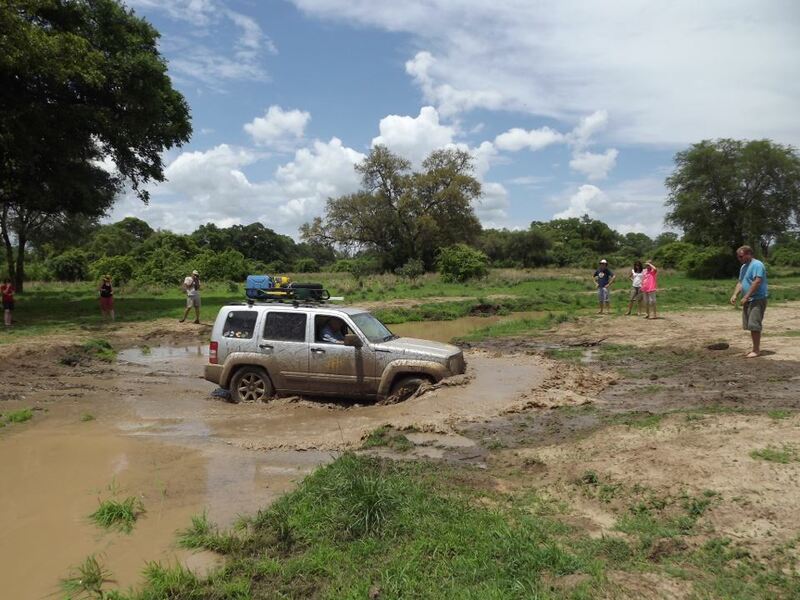 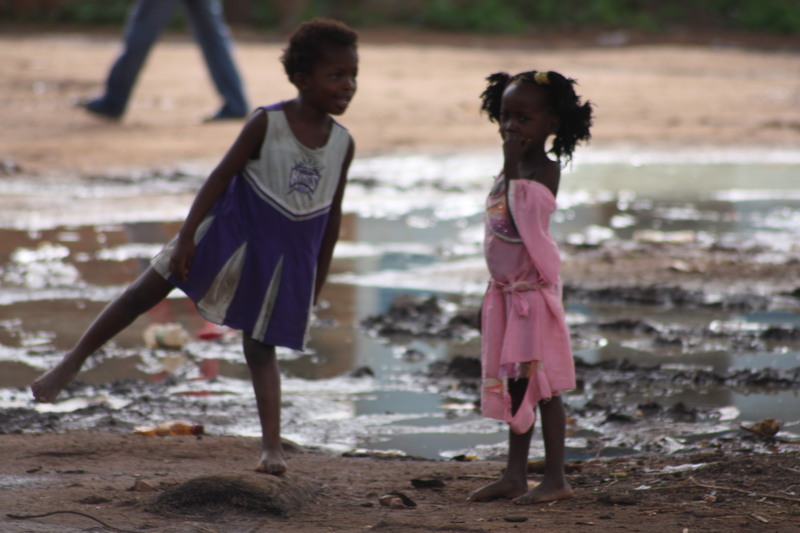 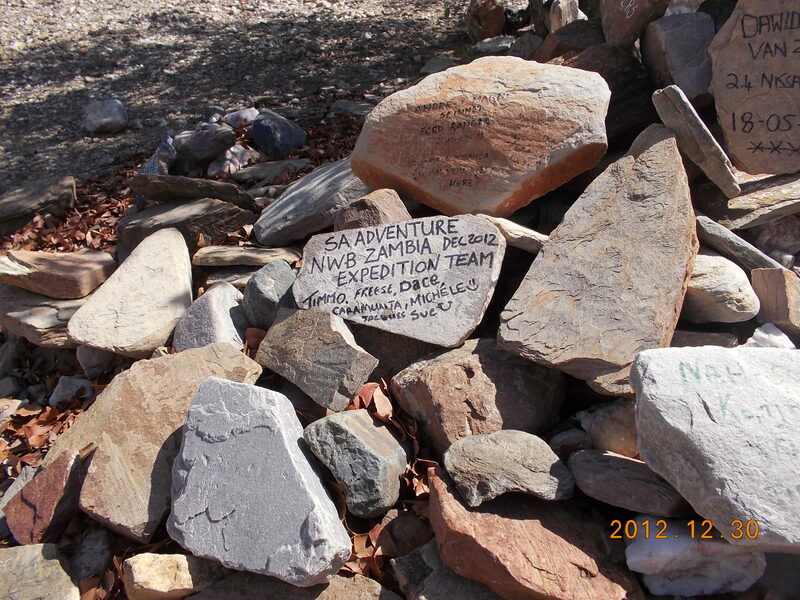 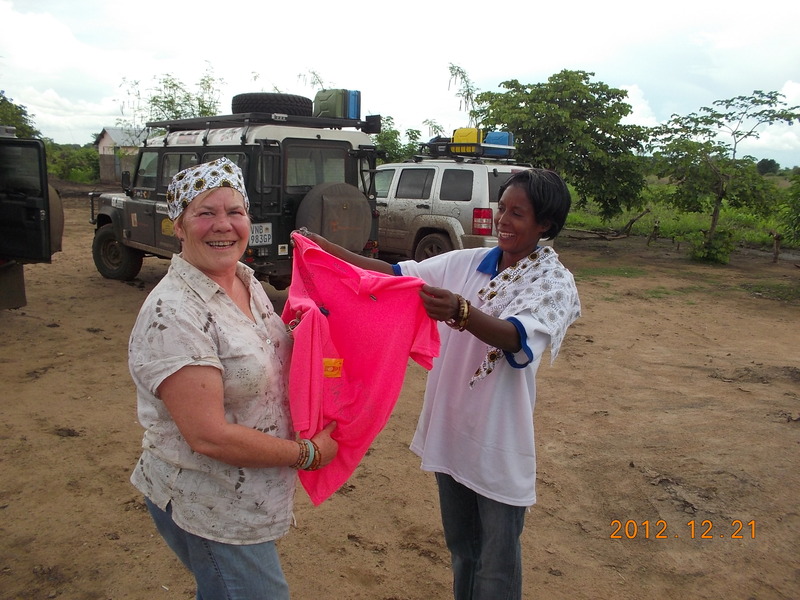 SA Adventures commits themselfs to participate in such humanitarian projects. 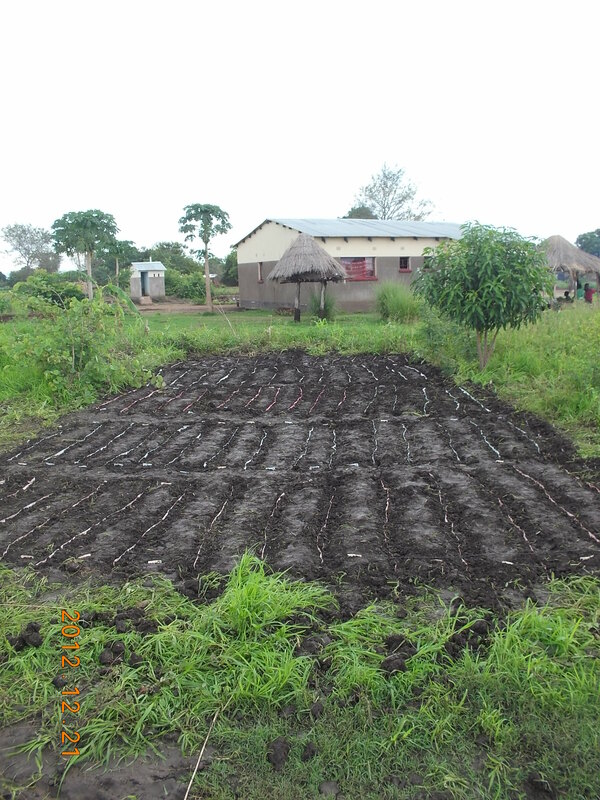 The minute the garden was completed the rain started falling, someone commented “this always happens after we do a garden” I could only sense that this was an approved blessing. 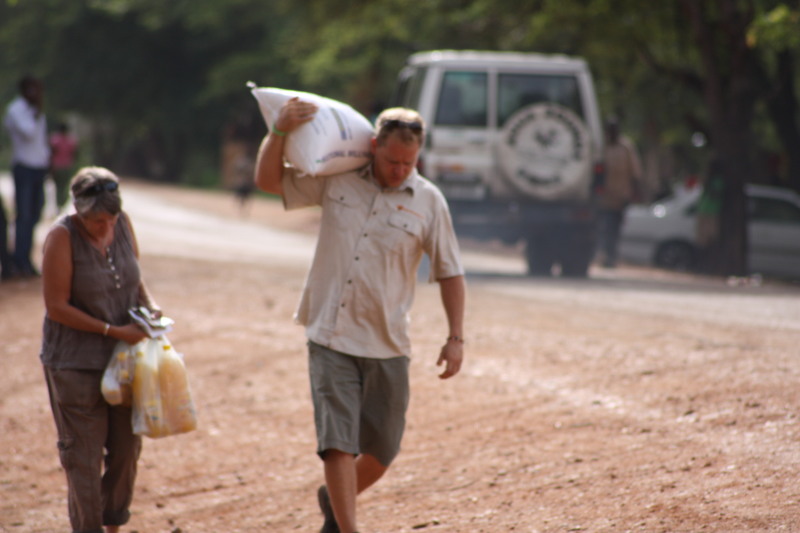 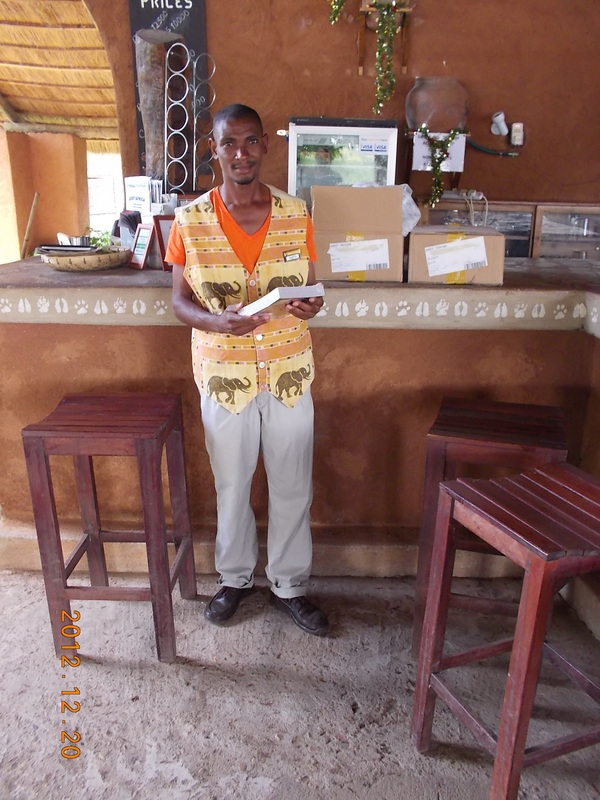 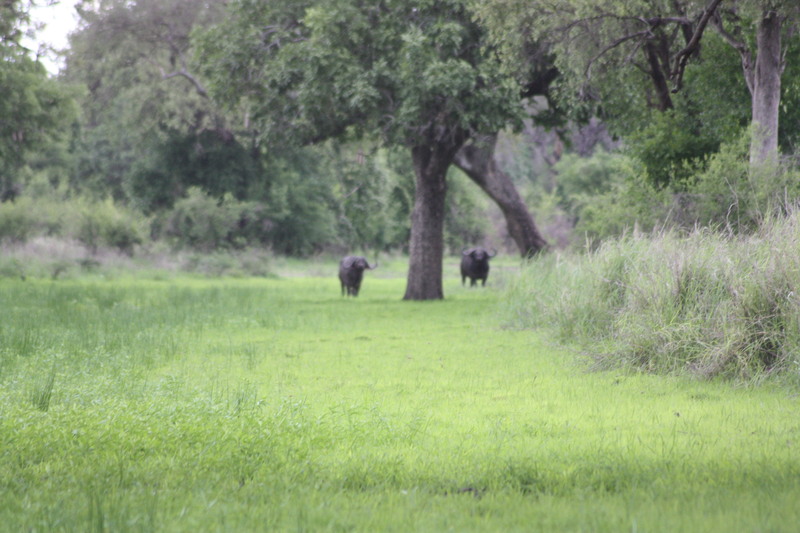 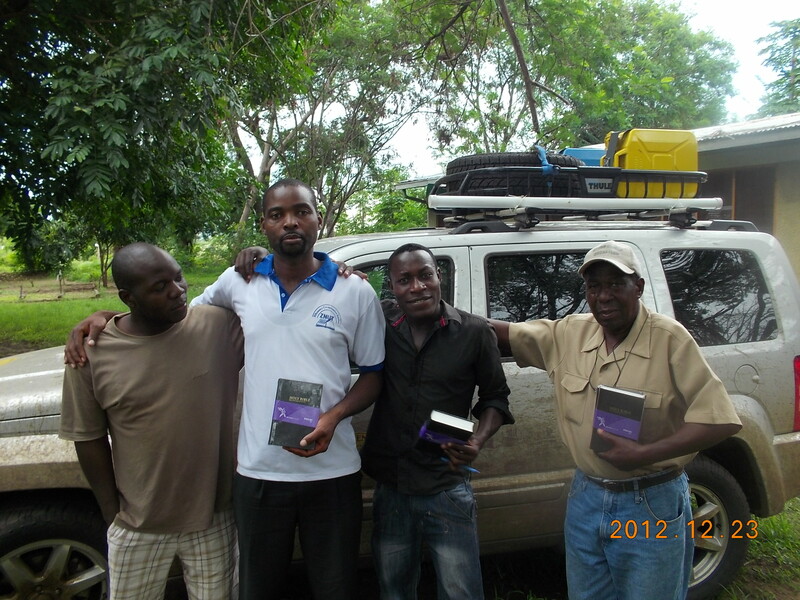 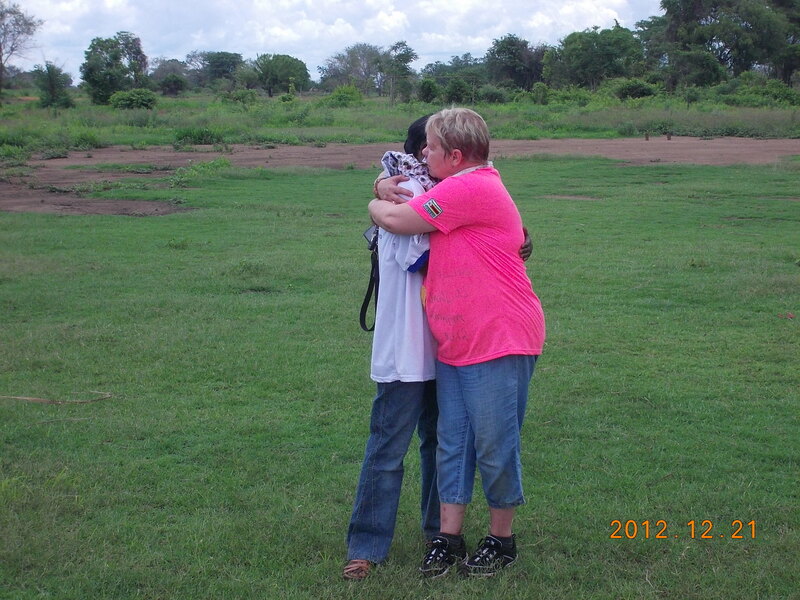 When Tim invited me I saw the opportunity to take some Bibles up to Luangwa. 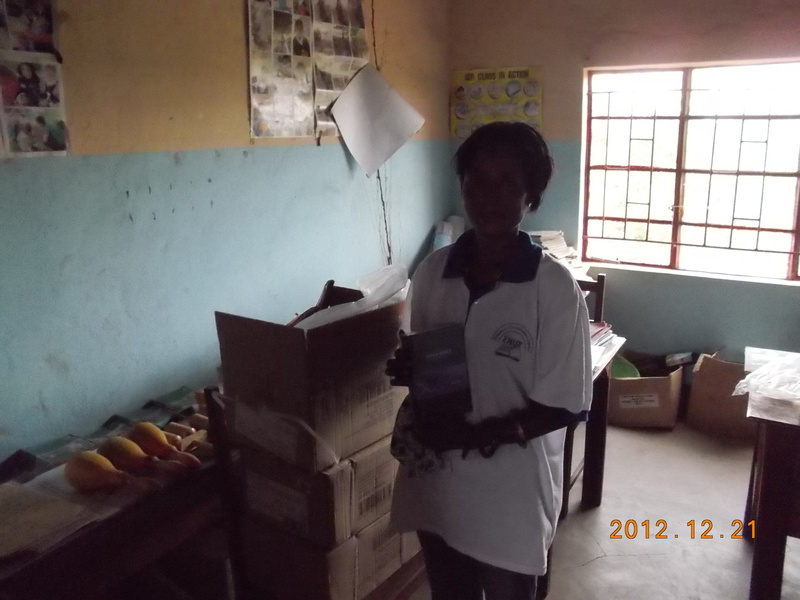 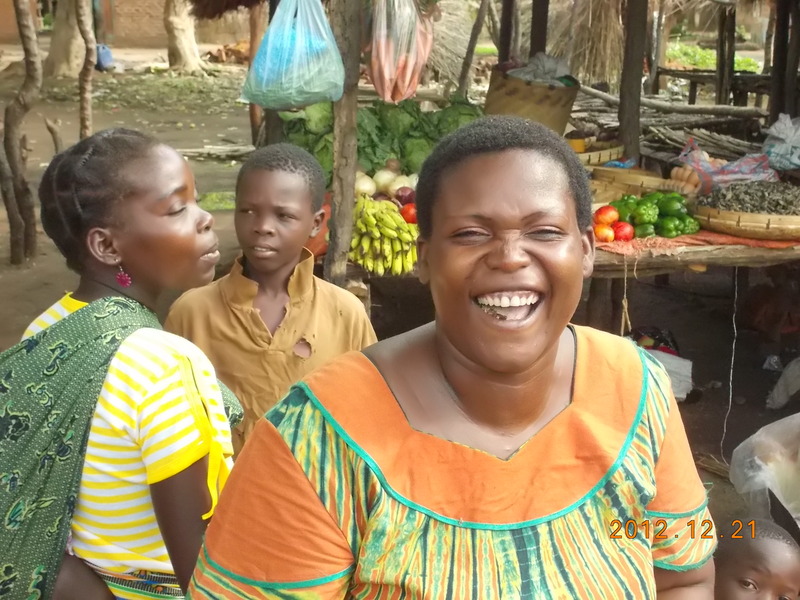 Irene the teacher at the school was very glad to recieve the Bibles. 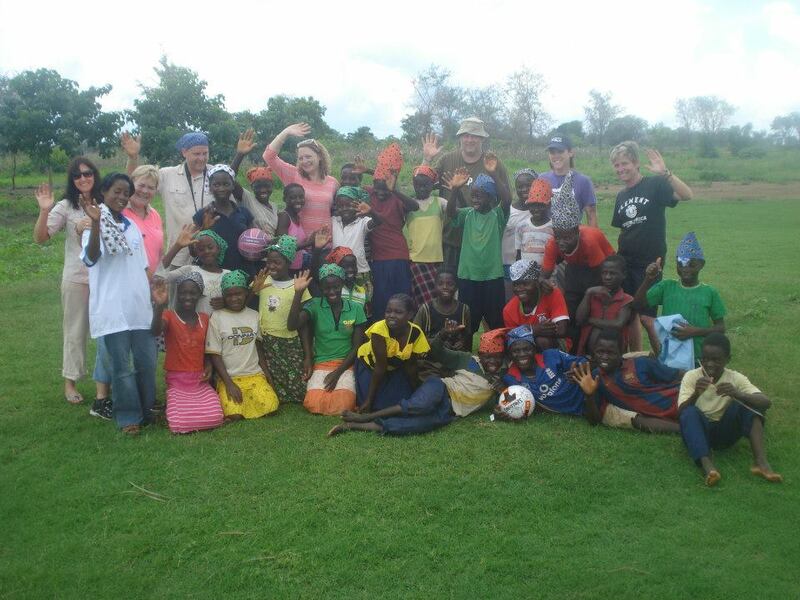 The school is also used as a local Church on Sundays. 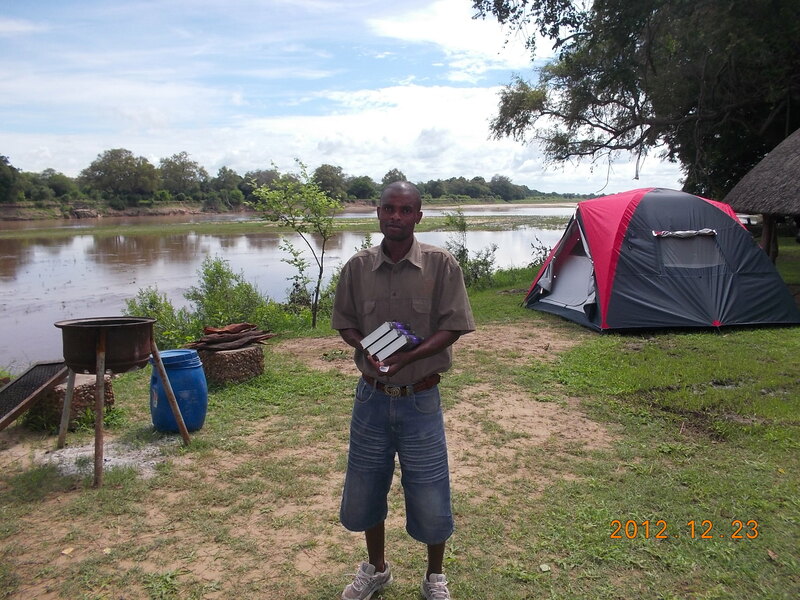 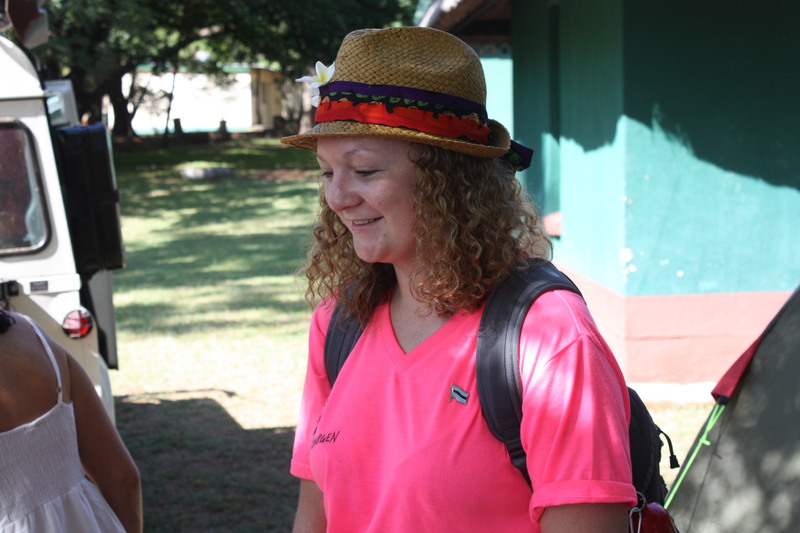 We also handed out some Bibles to locals in the little village as well as all the staff at Croc Valley camp. 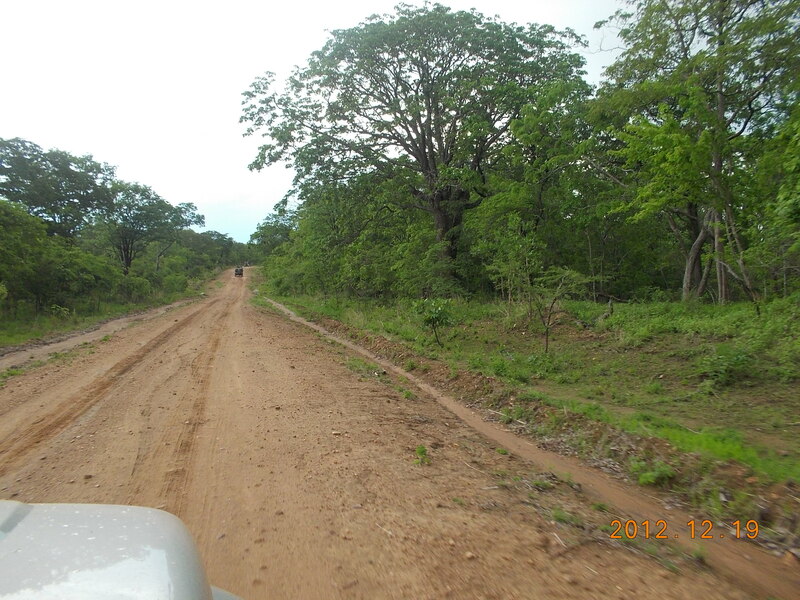 The next day we left for Lusaka, the road if you can call it a road, from Luangwa to Chipata was tough and I had to slack down a lot where the others could maintain a constant speed. 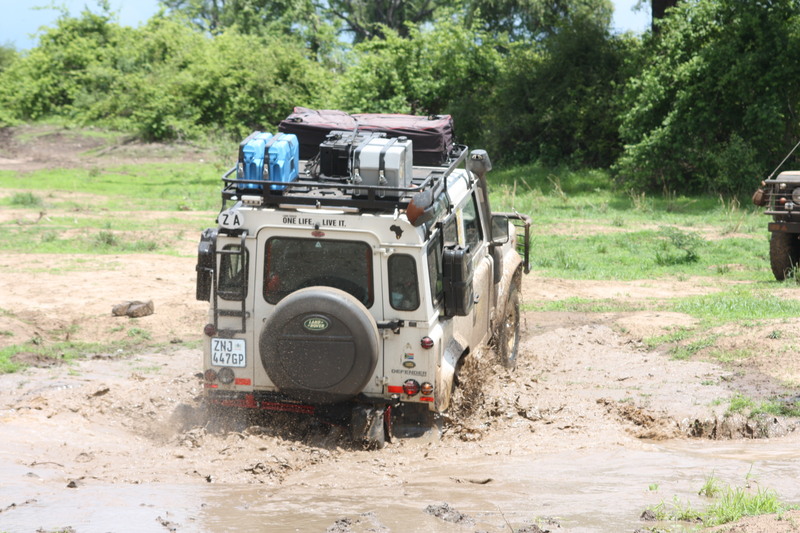 This was due to the fact that the standard shocks on the Jeep and the low profile tyres slowed me down a bit, but when we got to the tar road I was not far behind the Landy’s and what a great feeling it was to be on tar again! 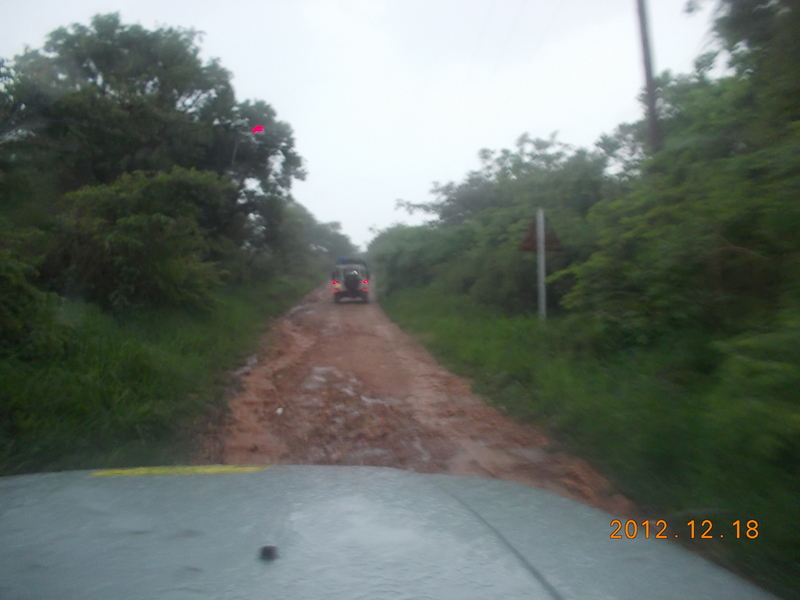 We drove into some heavy rain that helped to wash out more of the mud from under the Jeep. 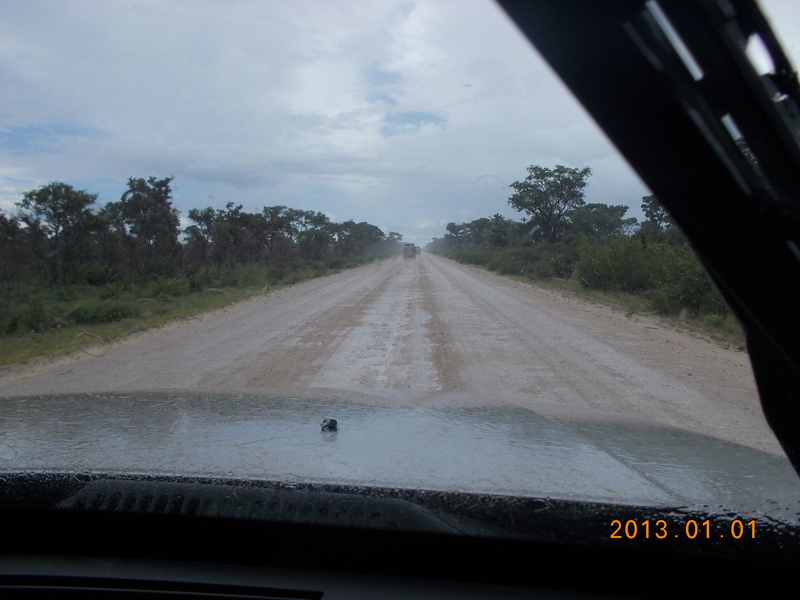 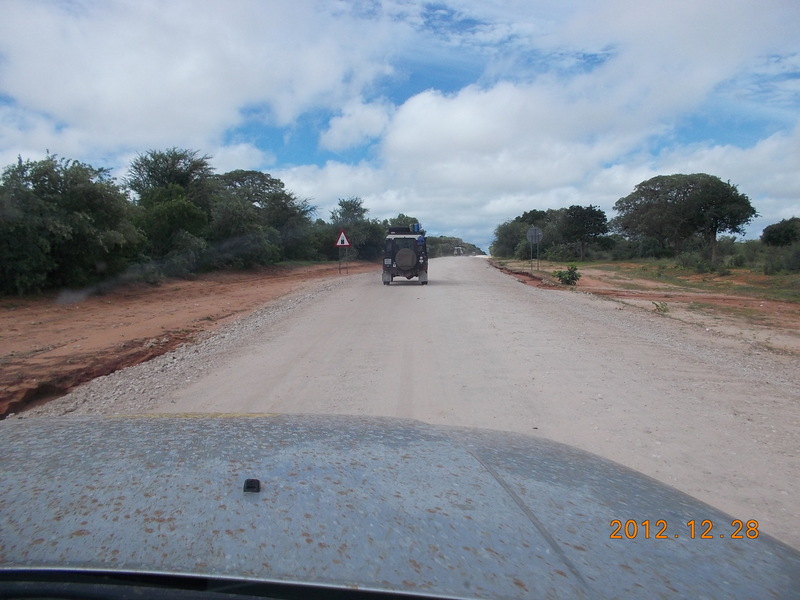 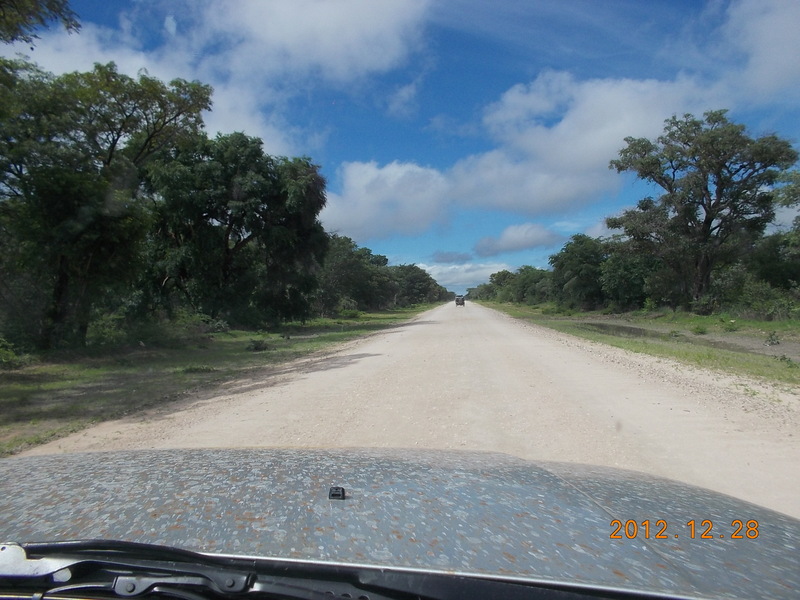 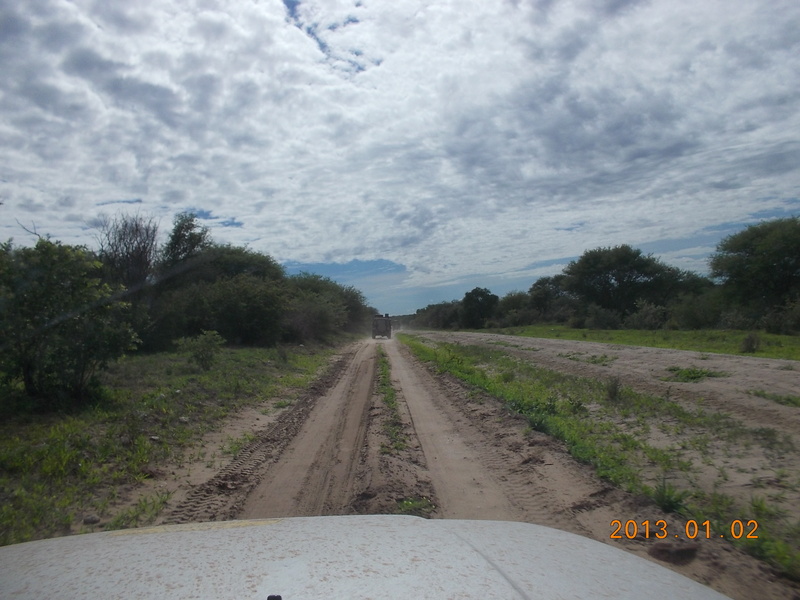 The tar road from Zambia through the Caprivi to Rundu was very comfortable to drive on. 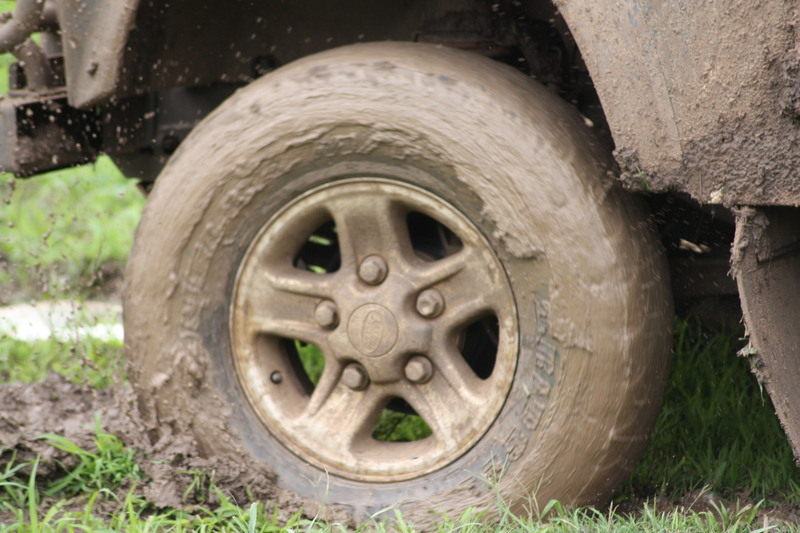 More rain along the way helped wash the remaining mud from undercarriage. 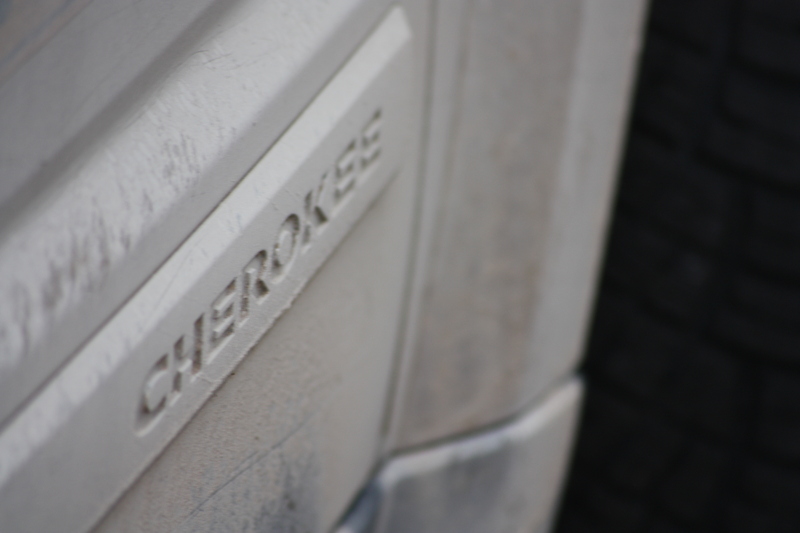 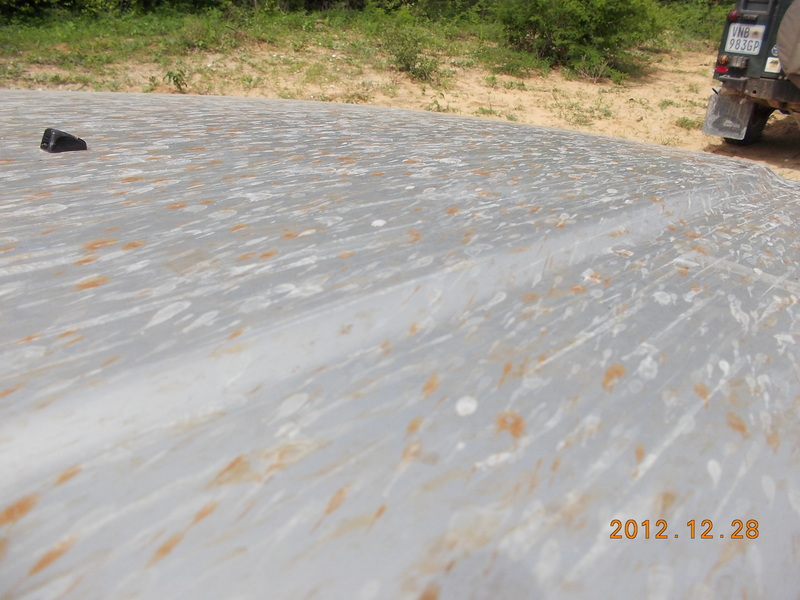 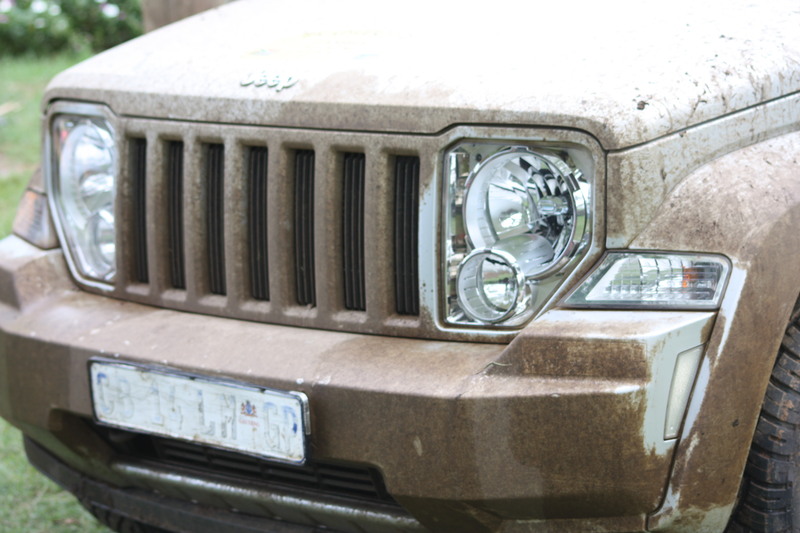 I was amazed at all the different colors of mud stains on my bonnet. 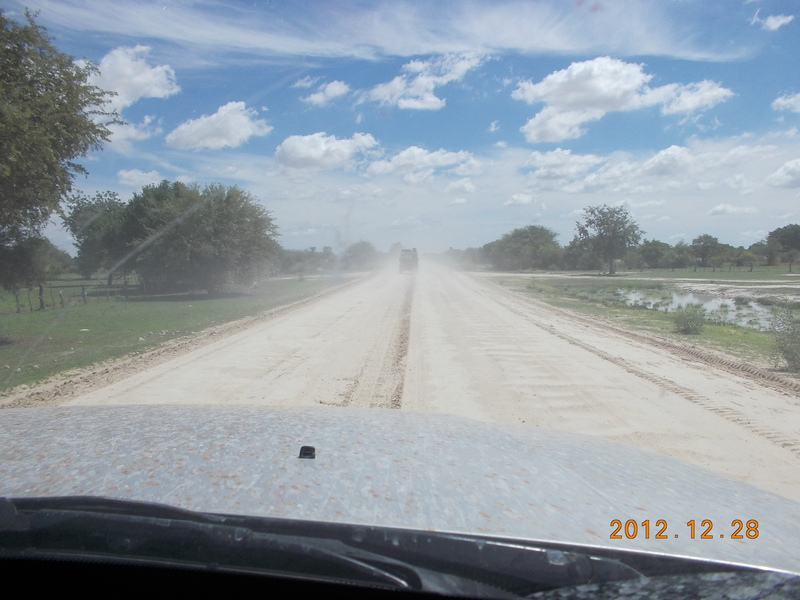 We ended up on a gravel road between Rundu and Rukana, which was so good, that I was sure you could safely travel at 160km/hr on it. 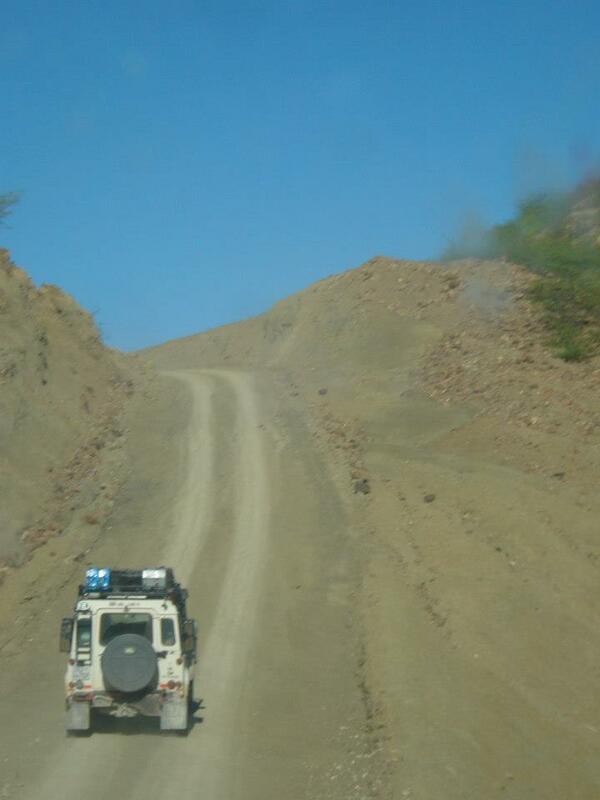 The road to Van Zyls Pass was probably the toughest road on this trip for the Jeep. 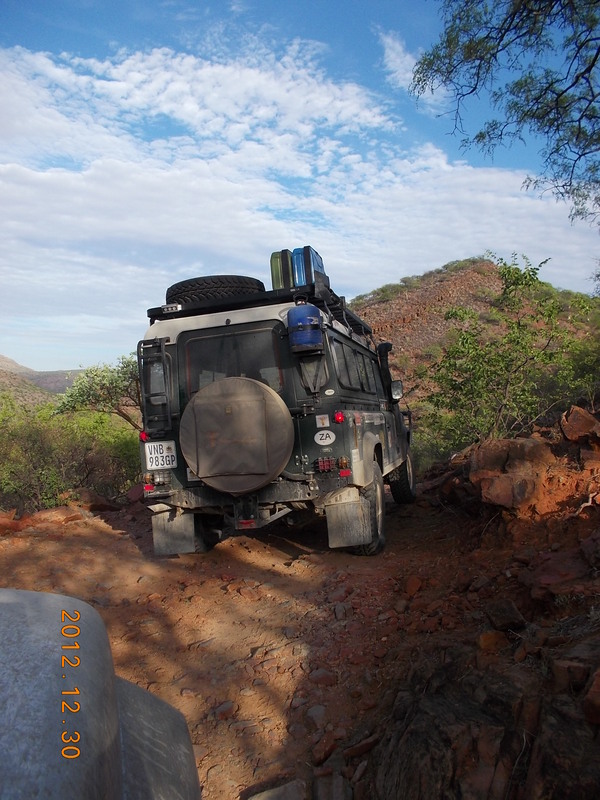 Once again the standard shocks and low profiles slowed me down and I had to do a lot of catching up once I spotted a good stretch of road. 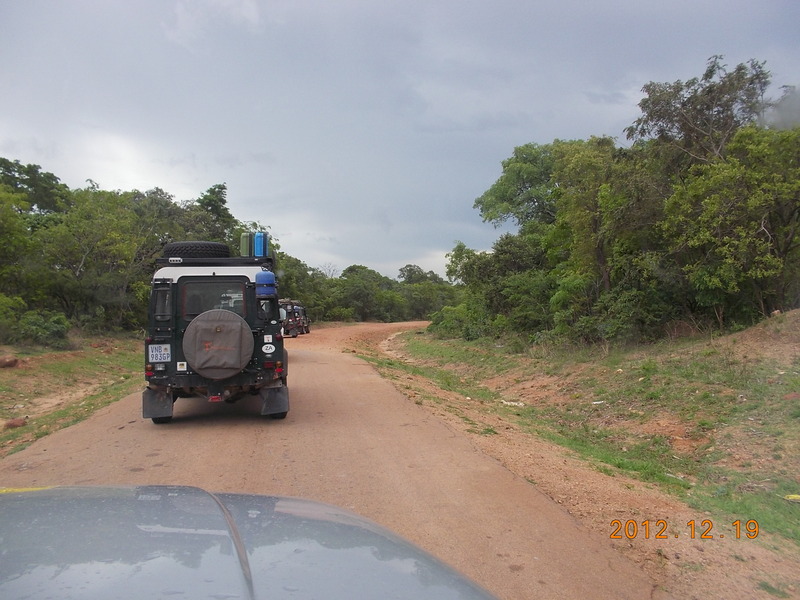 Then it happened … a beeping sound from the dash board… Left back tyre pressure low…a slow puncture a half a day before Van Zyls pass! 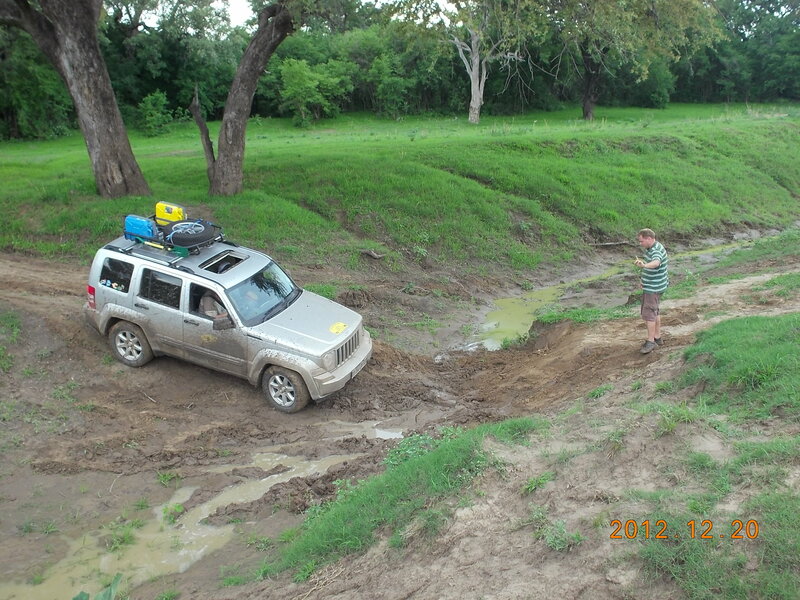 Tim spotted a river crossing and we stopped “Wilson” in the water and searched for the slow puncture. 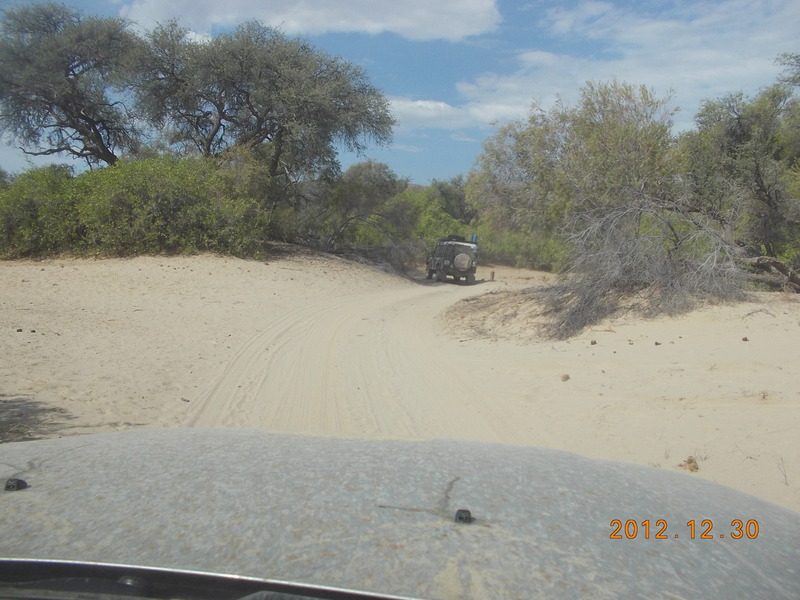 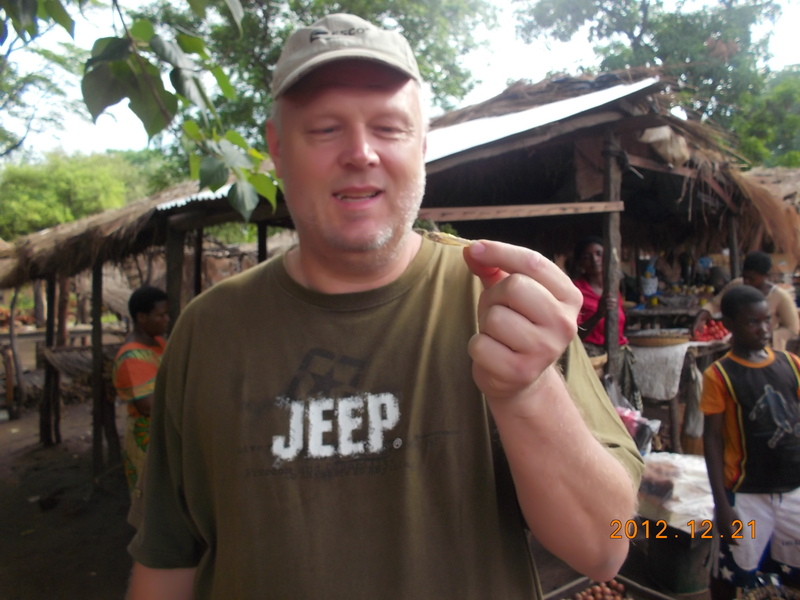 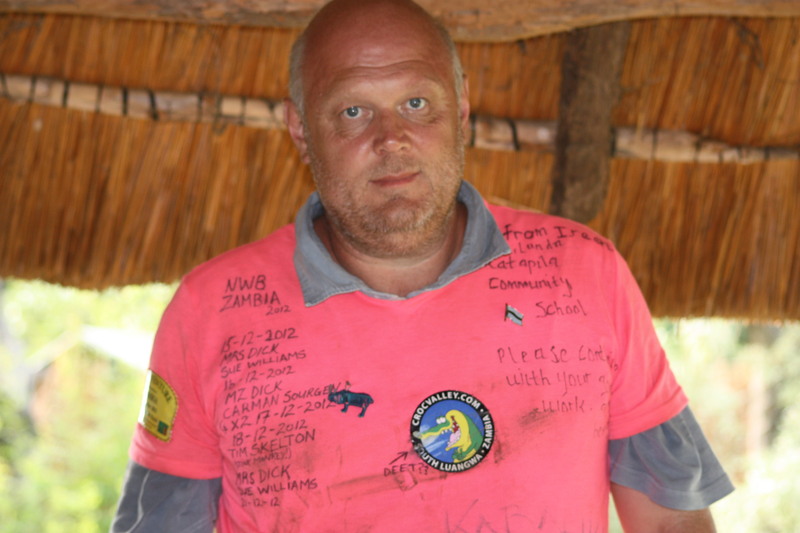 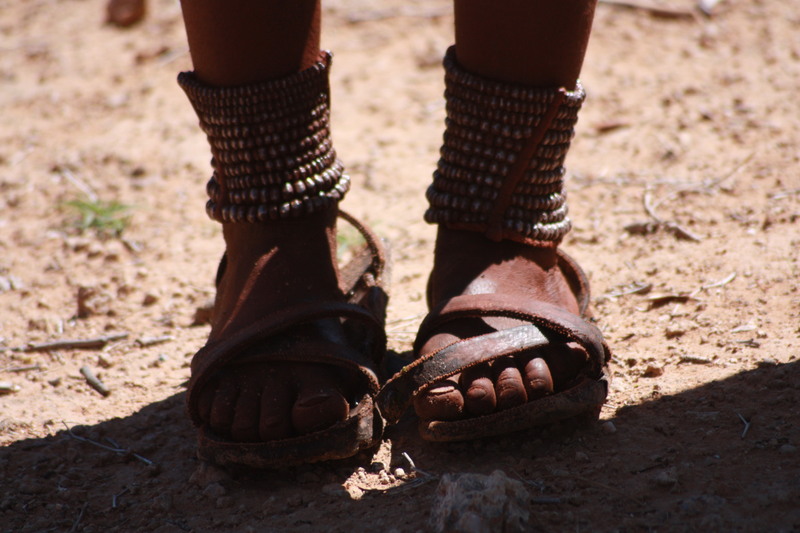 He marked it and I parked under a shaded tree surrounded by Himba people in their traditional clothing. 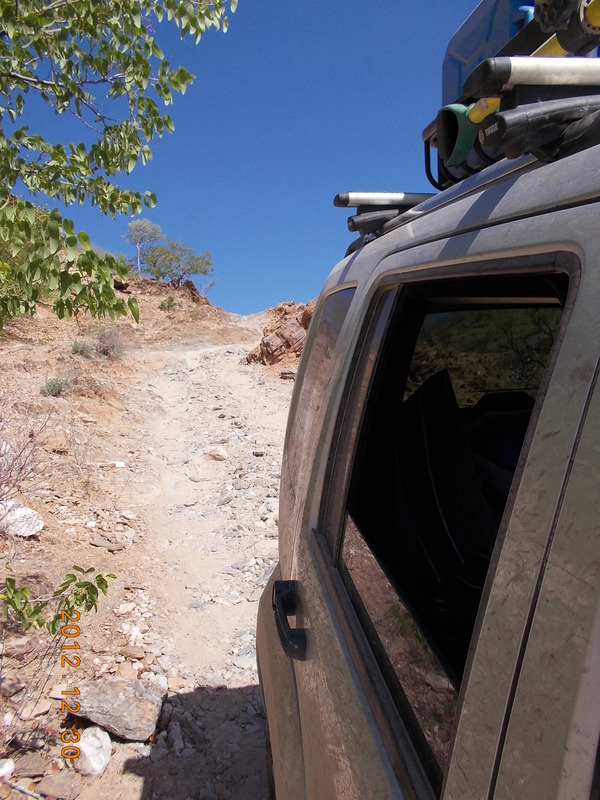 Tim poured some dishwashing soap over the marked area and a bubble appeared, once he spotted the hole he plugged it, and 20 min later we were off again. 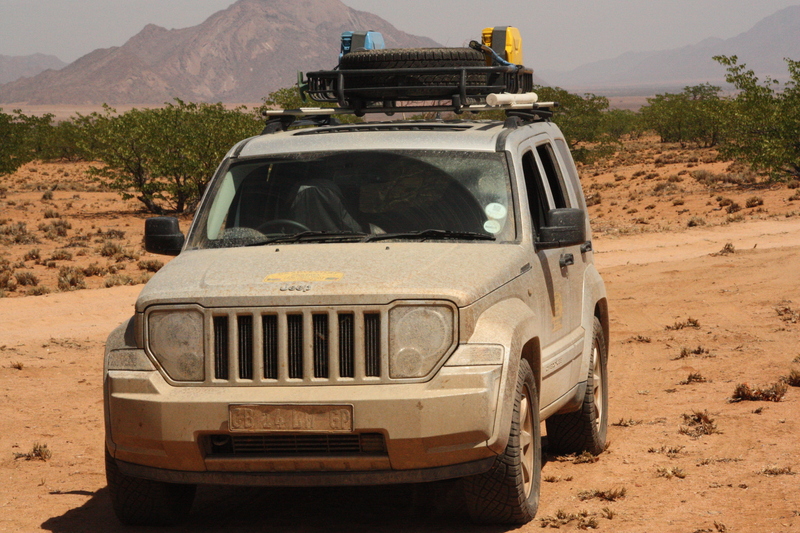 Thanks to the technology on the Jeep showing the tyre pressure on the dashboard, I comfortably monitored the tyre pressure from inside “Wilson”. 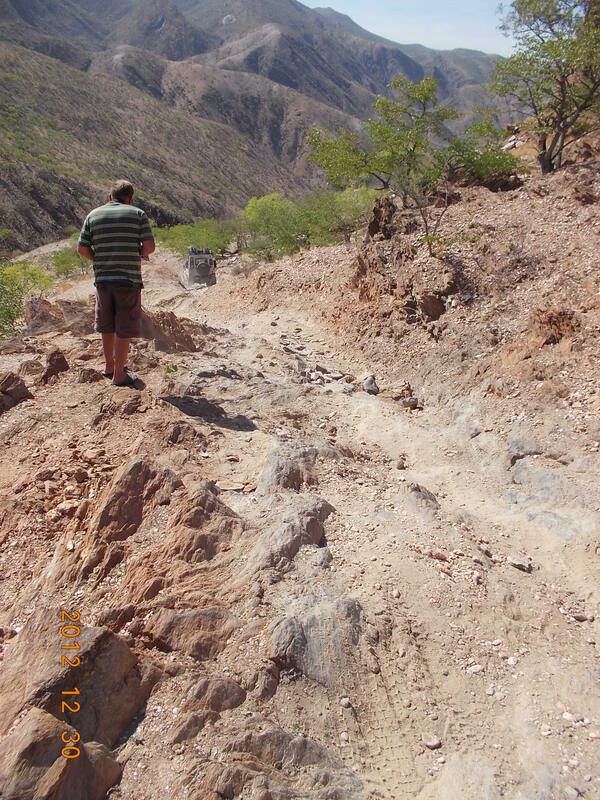 We endured a few good technical obstacles as we were approaching Van Zyls Pass and I was glad to see Tim standing and waiting to show me a line everytime. 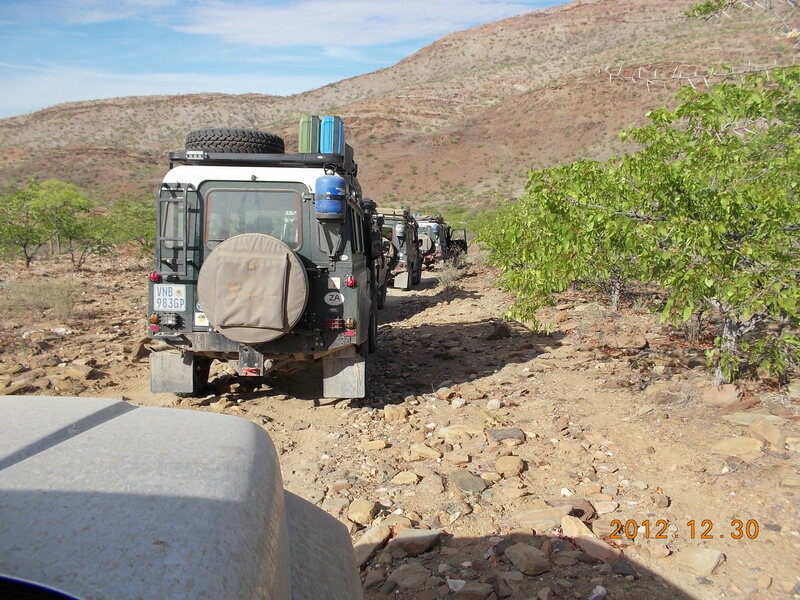 Once we got to Van Zyl’s Pass camp Tim and myself were a bit confused and not sure if we had already gone through the pass or not. 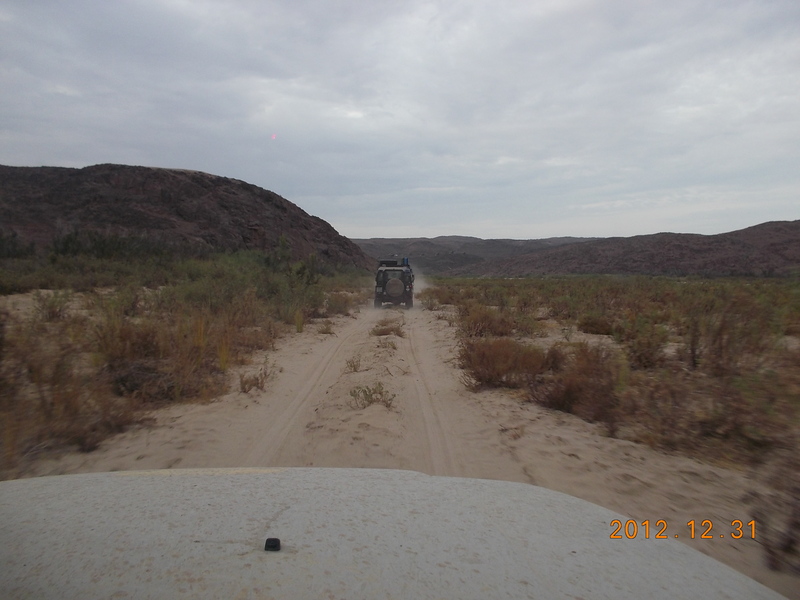 Later we were informed by someone that the pass was still lying ahead of us. 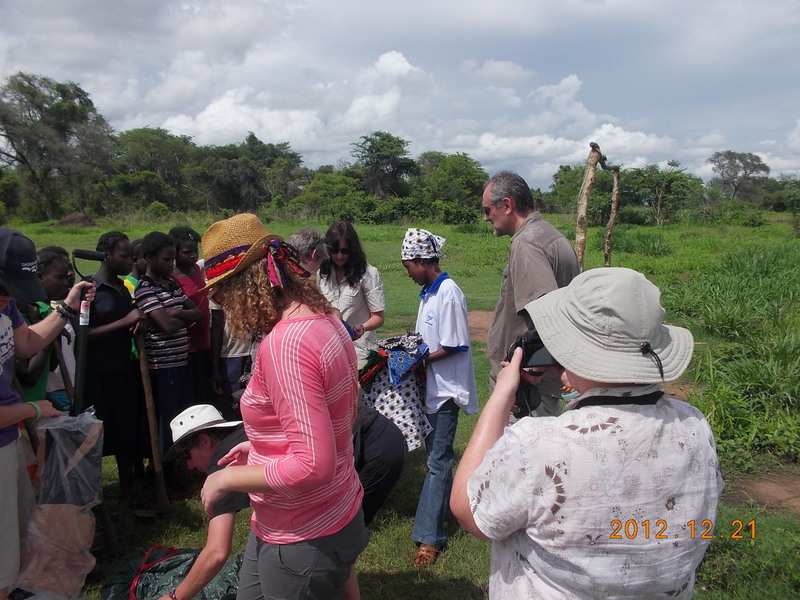 The next day the big Van Zyls was on the menu, I could sense everyone in the camp was eager to get going. 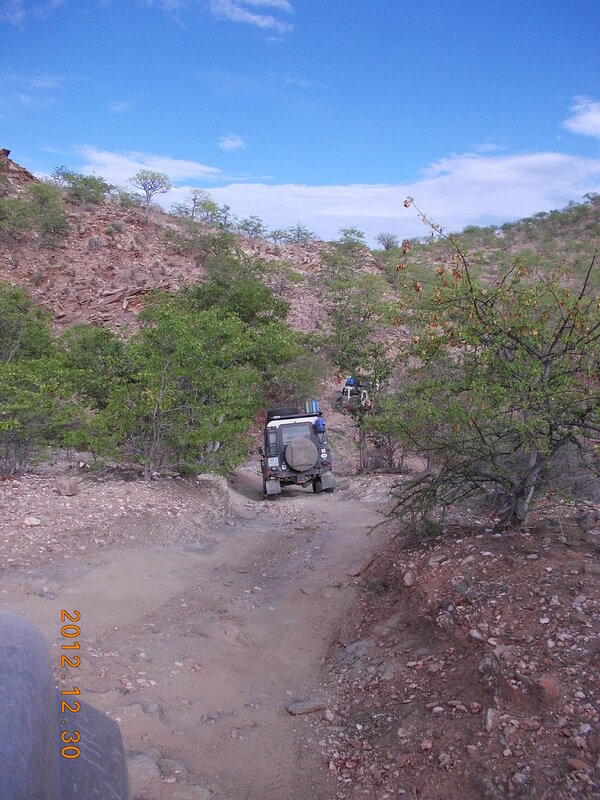 I really enjoyed the ride as we carved through the rocky pathways up and down and around the bends. 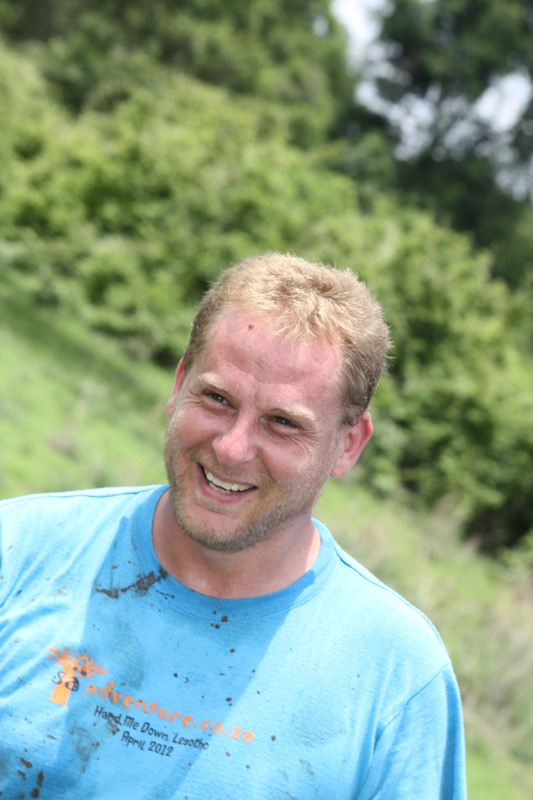 The pace was not too fast and “Wilson” was doing very well going through the obstacles. 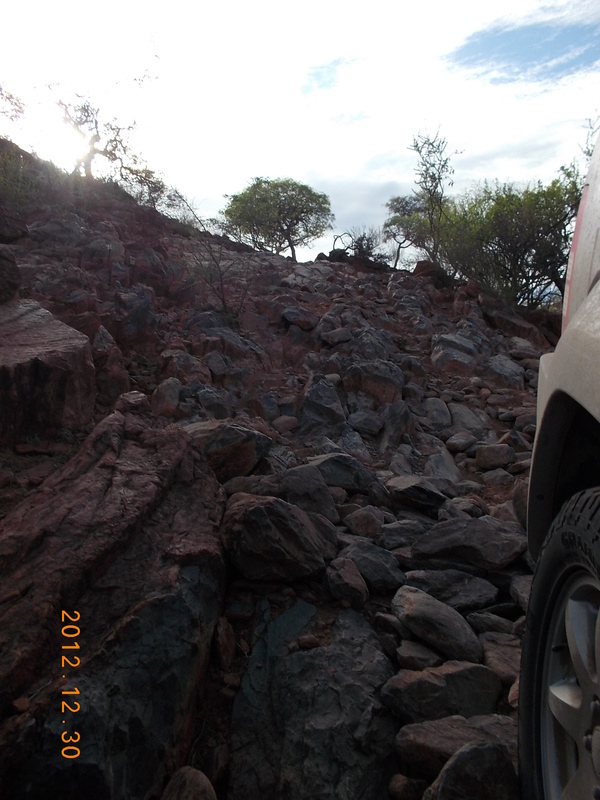 We then got to a section, definitely the most difficult obstacle the Jeep had ever come across in its short life. 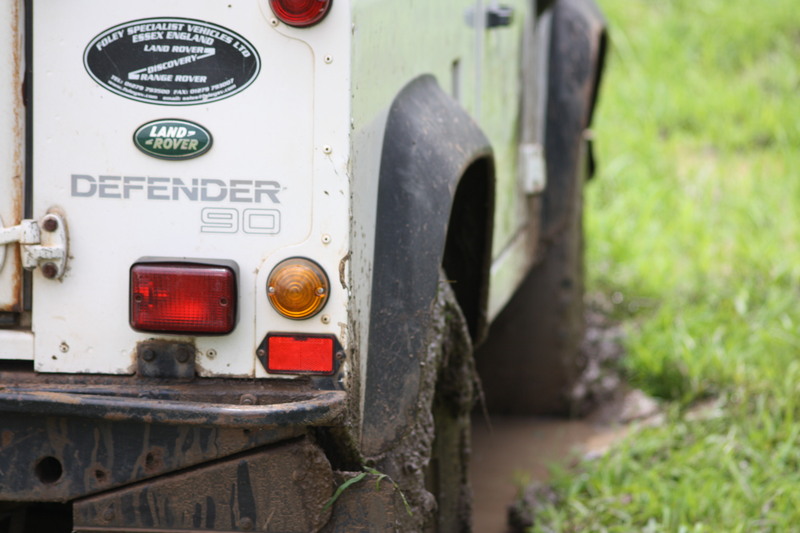 Patiently I watched the Landy’s go through one by one, the Landy before me took a bit of a risky line and we feared a roll over was imminent while watching it bounce through the obstacle. 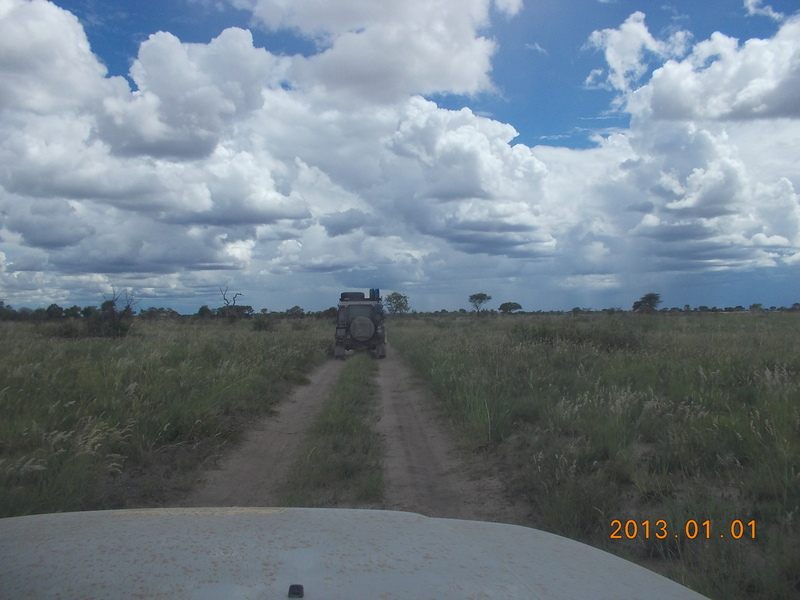 Off I went, following my line, not seeing much in front of me but trusting the line I had chosen. 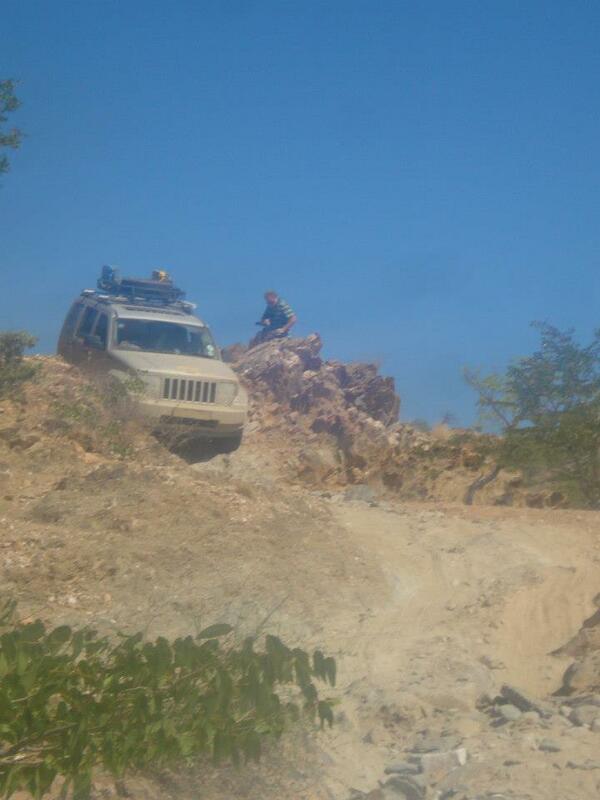 To my surprise “Willson” went through the obstacle with minor bumps. 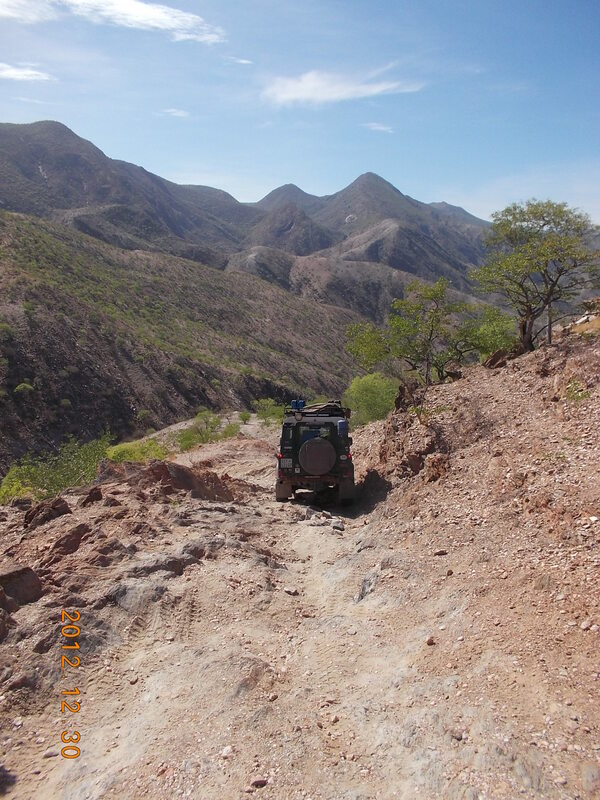 Then I looked up and saw the obstacle did not stop there; it carried on after the bend, and I realized I had not walked that part of the obstacle and only had to go down trusting my instincts. 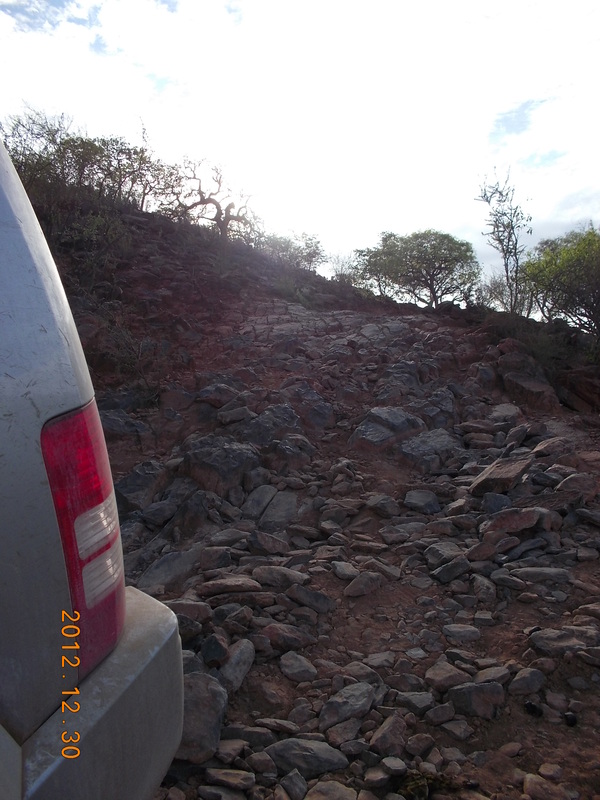 This made me realize there is always a higher ground no matter how difficult the obstacle is, “Just look for it and stick to it.” Driving down the rest of Van Zyls pass, on our way to go put a stone with our names on the heap at the bottom, I thought this is actually a good life lesson “there is always a higher ground no matter how difficult the obstacle”. 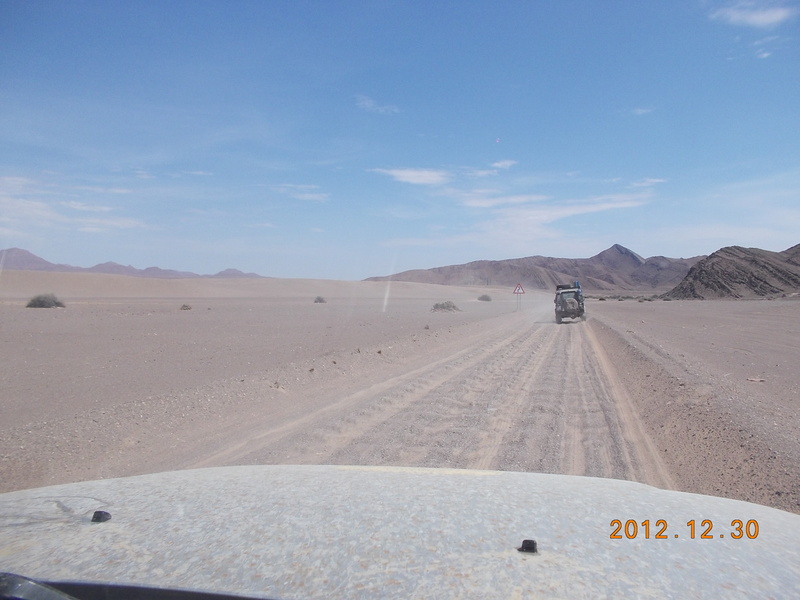 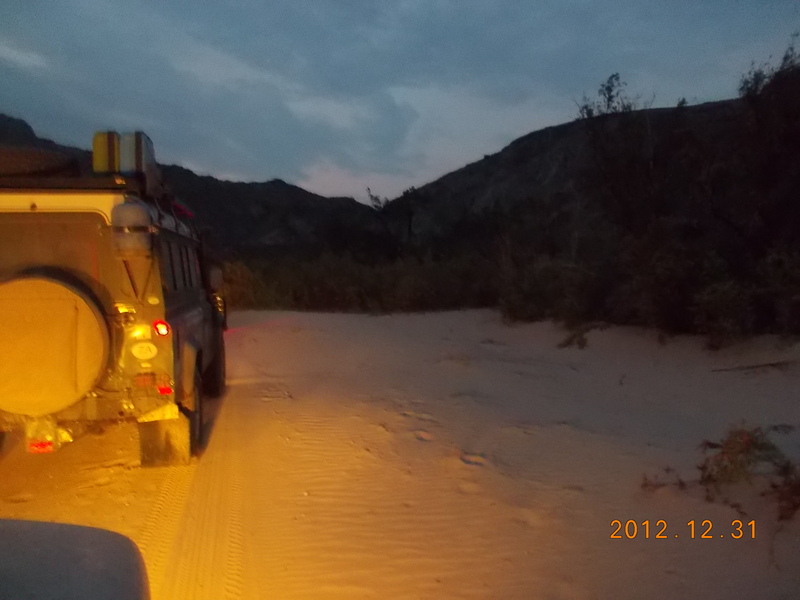 After the rock laying procedure, off we went to Purros desert camp. 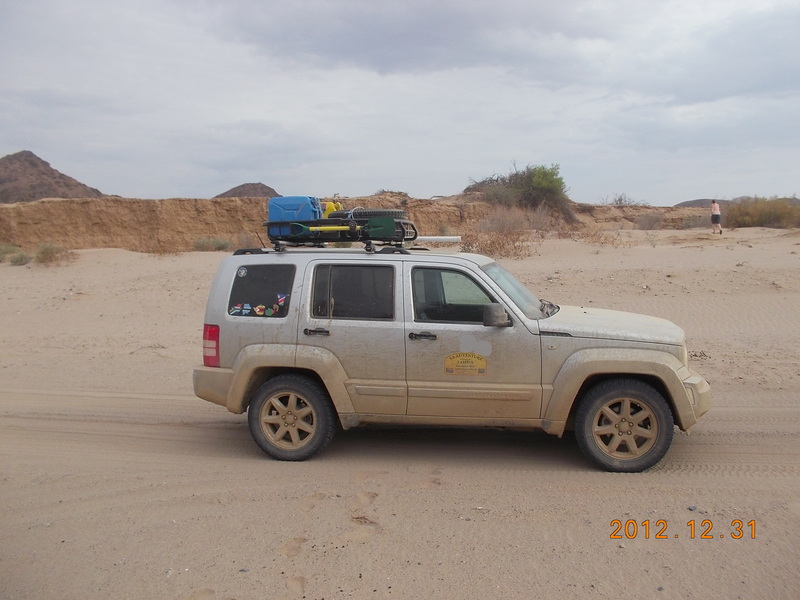 “Willson” did extremely well in the sand and it was an enjoyable ride. 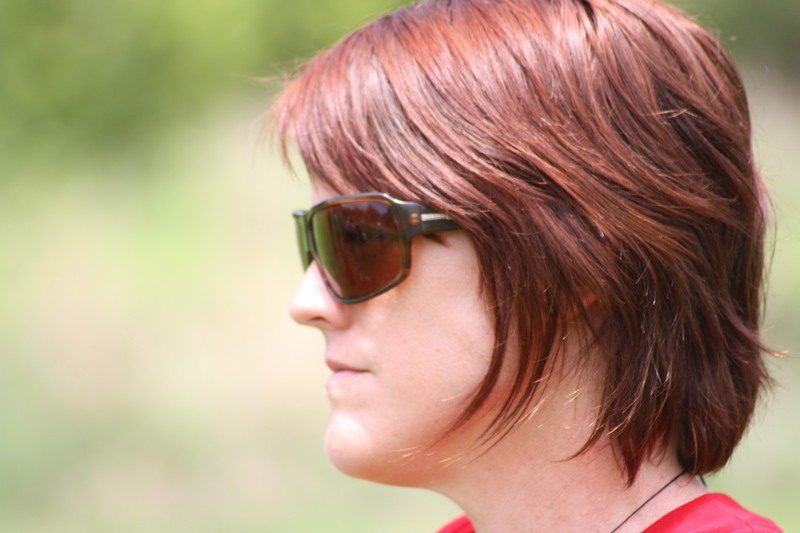 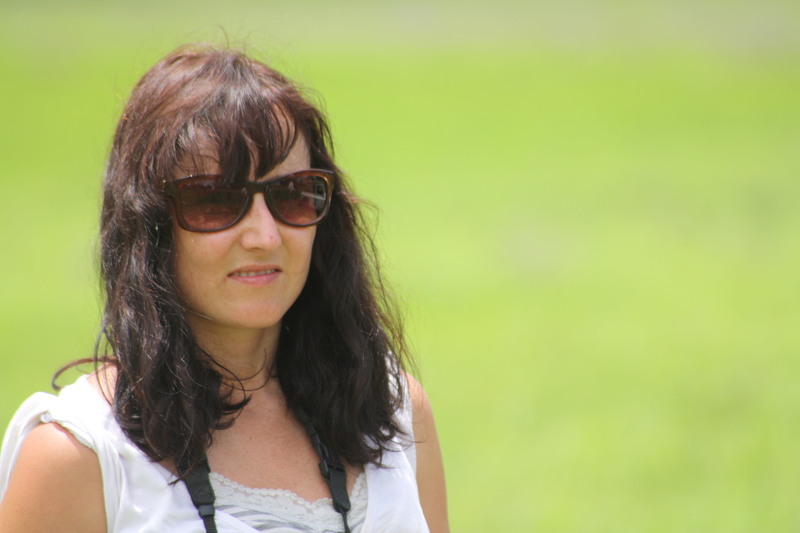 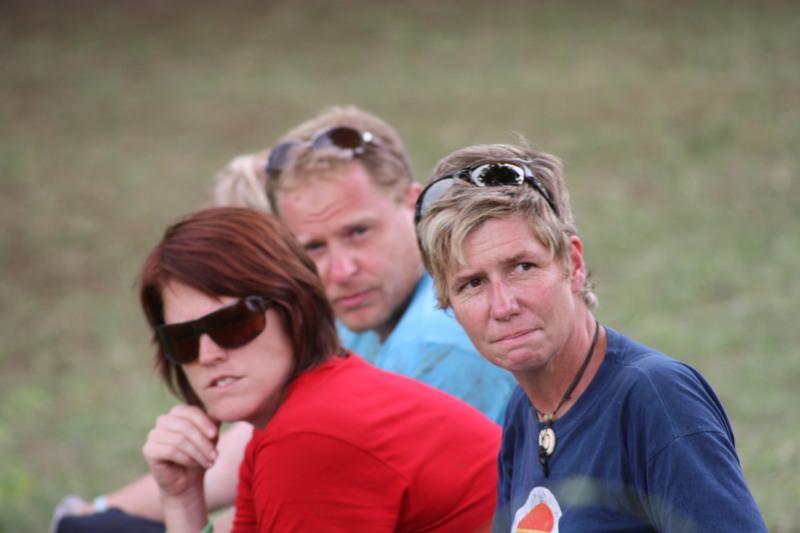 Thinking Van Zyl’s Pass…..”ag that was not that bad”. 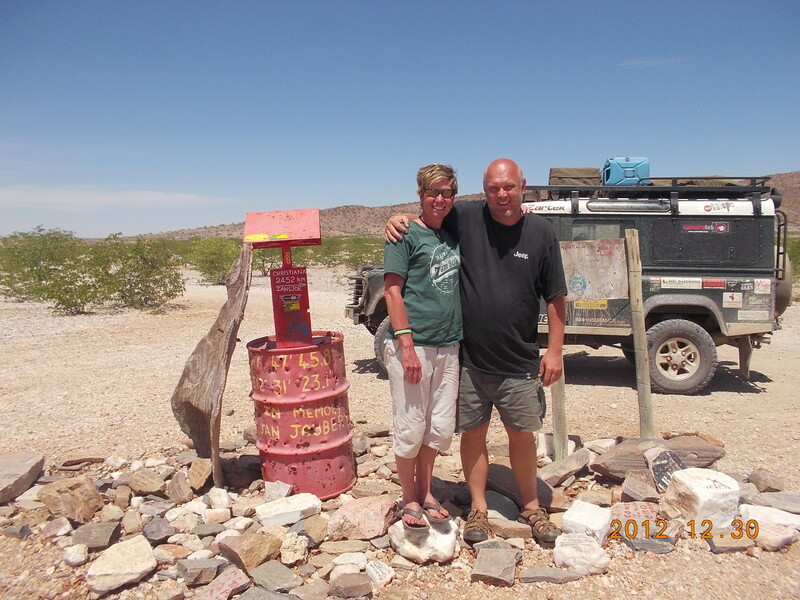 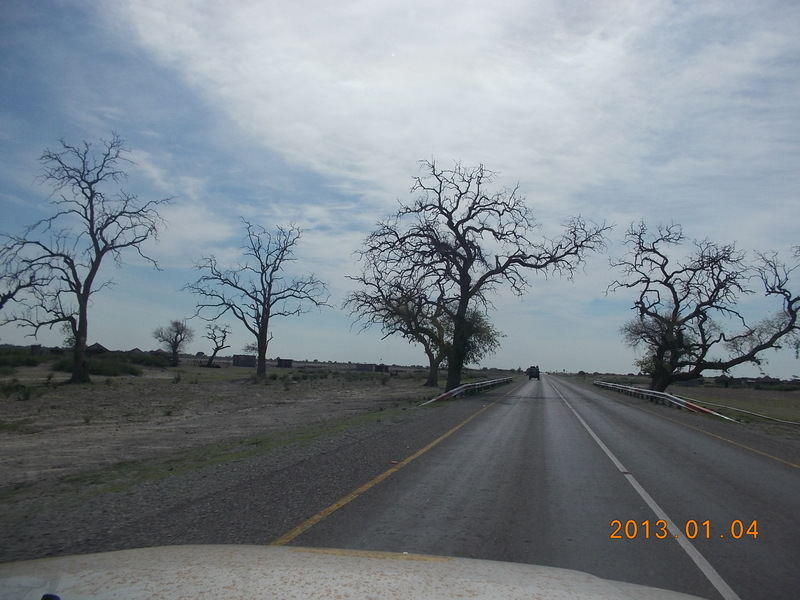 After Purros it was back through the dessert to Grootfontein. 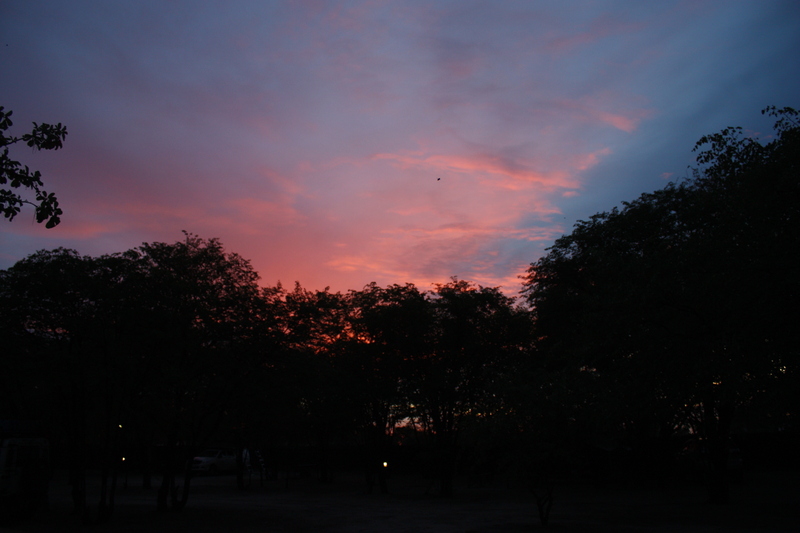 We left early in the morning and it was still dark outside. 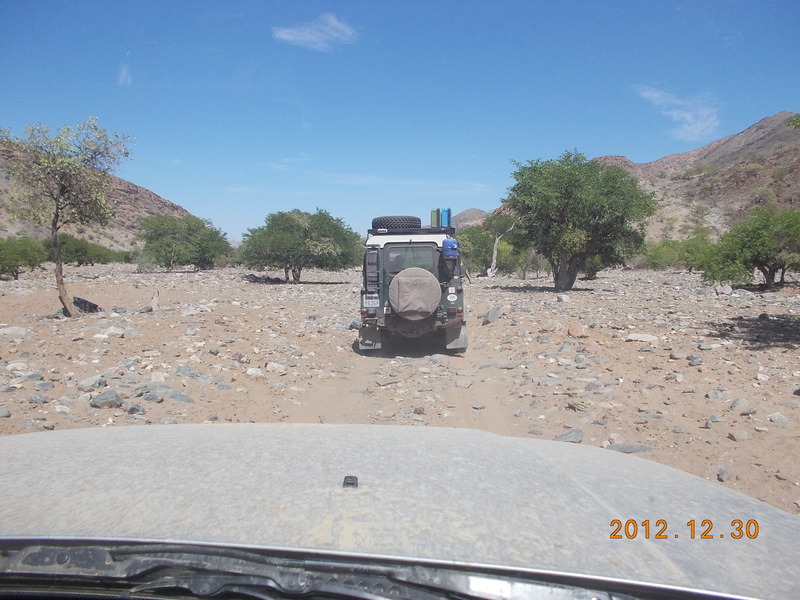 I noticed we were driving for quite I while in a dry river bed, then we started crossing a river once, twice, 10 times, 20 times I stopped counting I was just taken away by this 4×4 trail through a river bed, some people will be lucky if they even once in their life cross a river bed in a 4×4, I am doing 20 to 30 crossings in a hour. 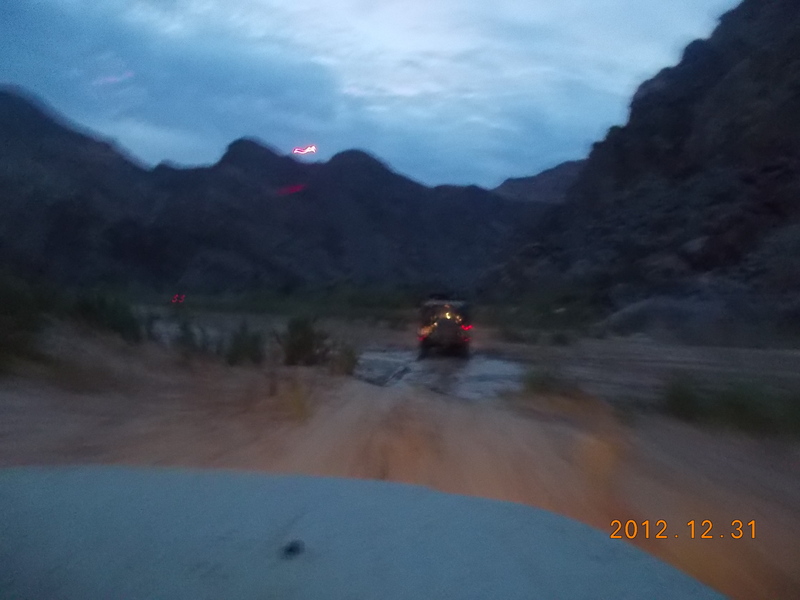 Then as the dawn broke we found ourselves driving in a gorge and I noticed we were driving in the river for about 50 to 100 meters, I am sure the sides of the mirrors of the Jeep was on some stage only about one meter from the sides of the gorge both sides. 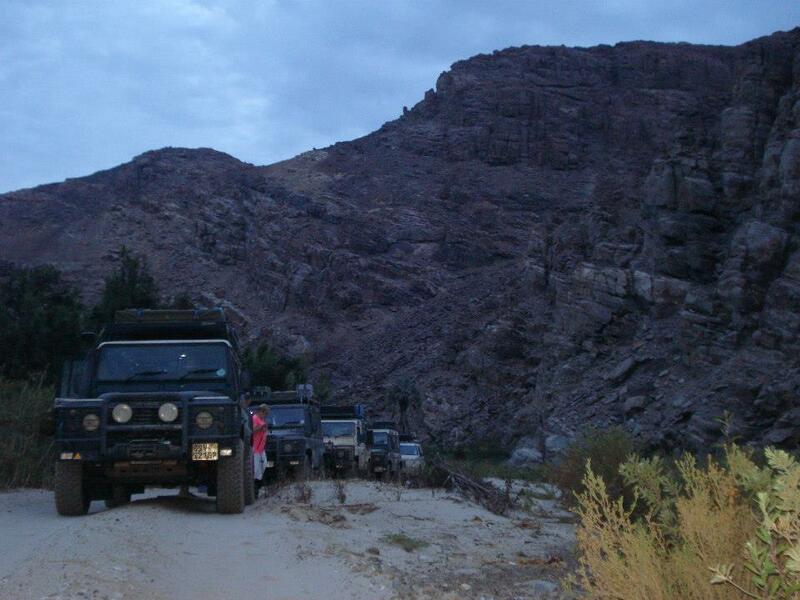 Once out of the river we stopped in the gorge and it was the right time to just take out the kettle and brew a strong cup of tea. 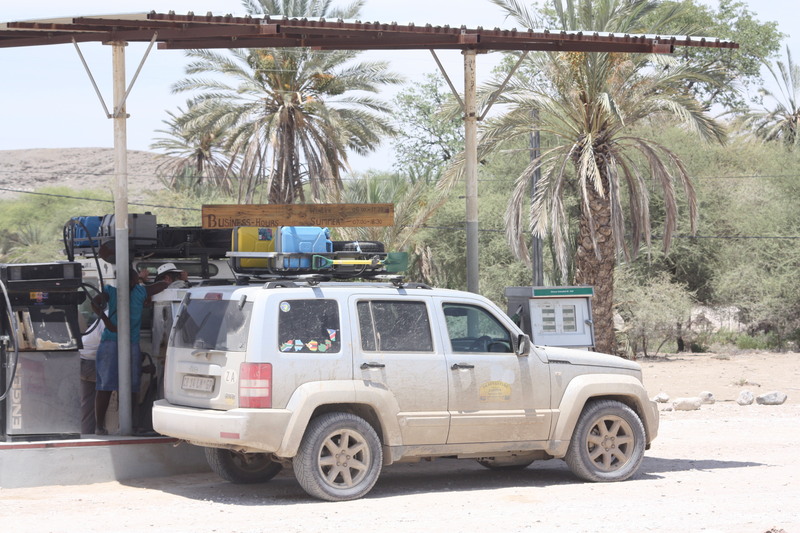 A quick stop in the desert under a tree to fill up from the jerry cans gave me a chance to blow the tyres down to 2 bar. 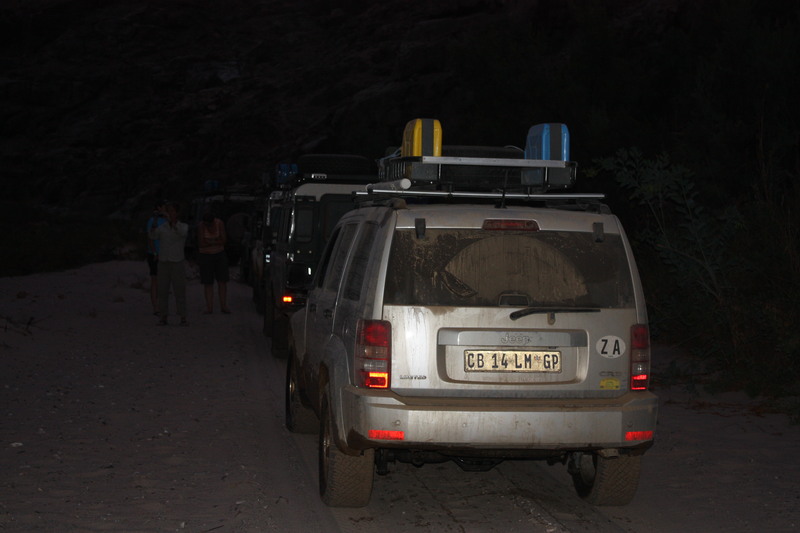 Off we went again pushing through the desert heading for Ses-Fontein. 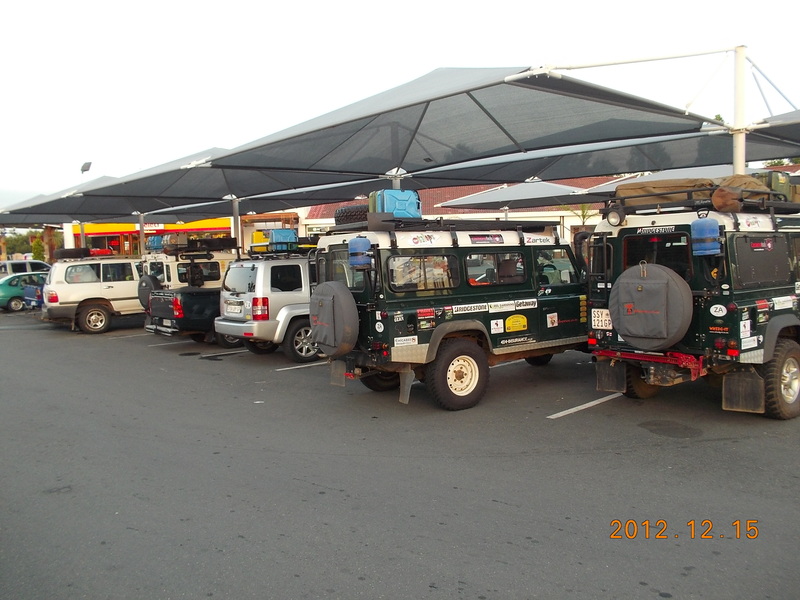 Once in Ses-Fontein we were all relieved to find a fuel station but ran them dry before the last Landy could fill up. 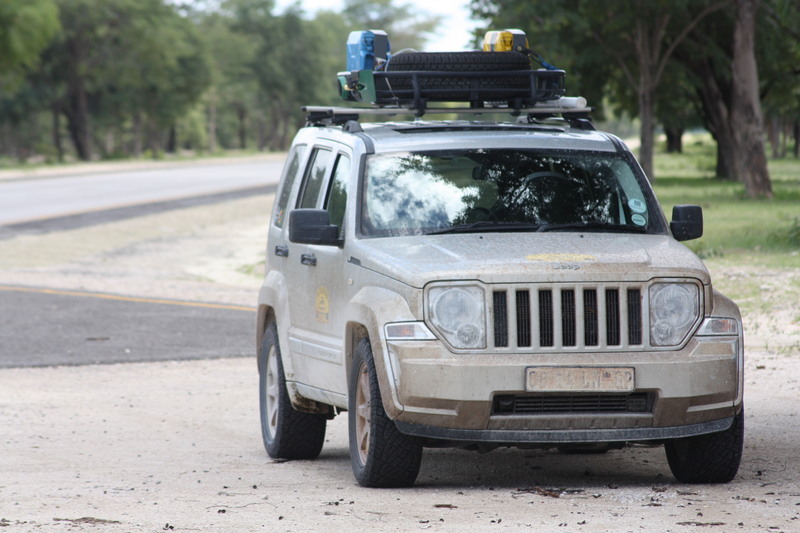 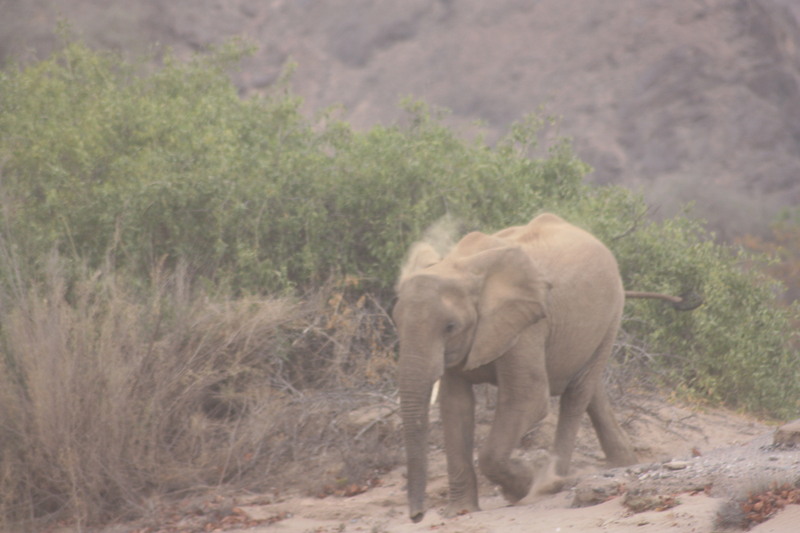 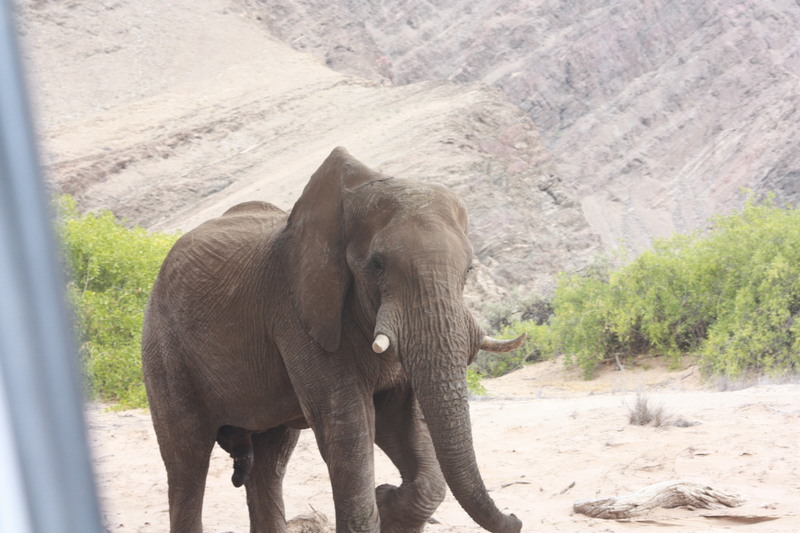 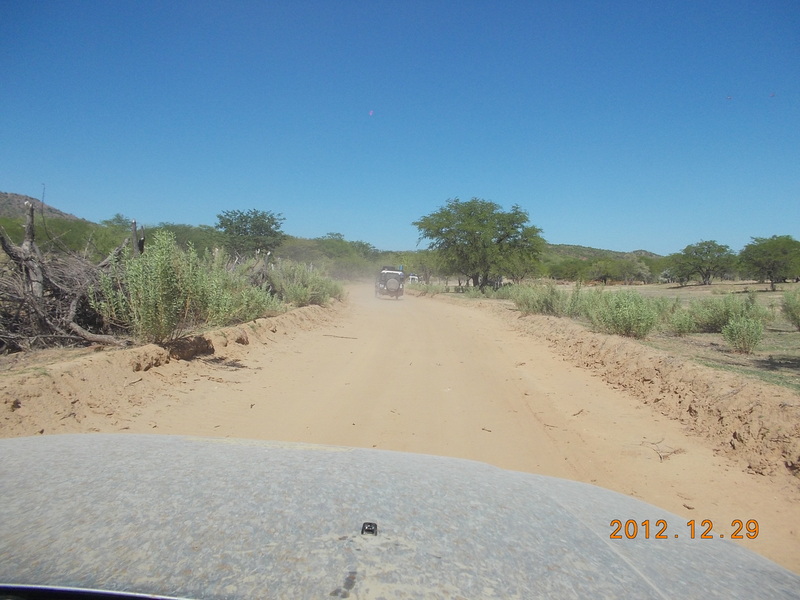 From there we headed to Grootfontein and “Wilson” was very happy to see some tar again. 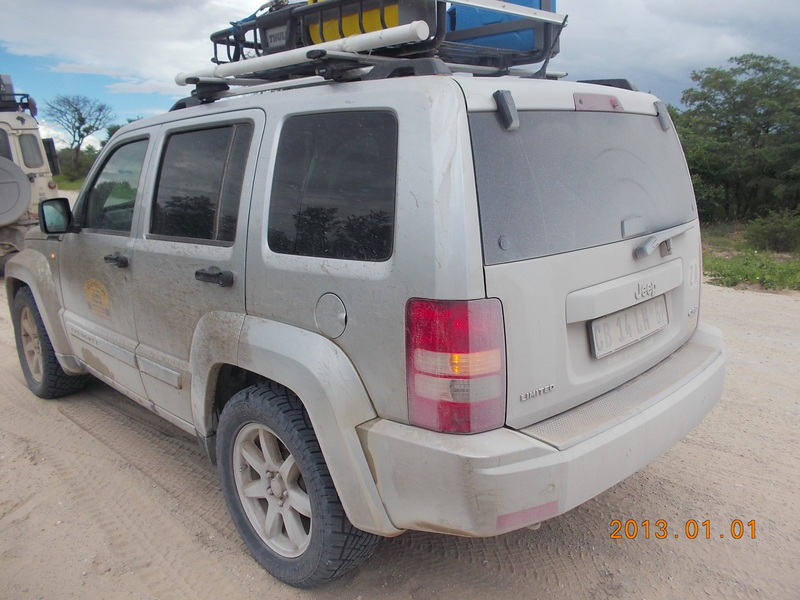 It did not take long to get the fuel consumption down to 9l/100km again. 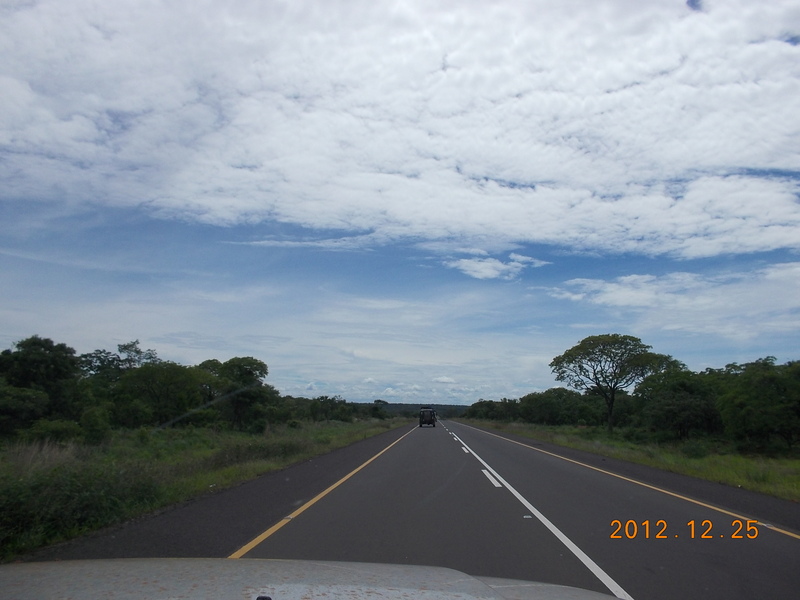 I was so amazed by the beautiful blue sky surrounding us. 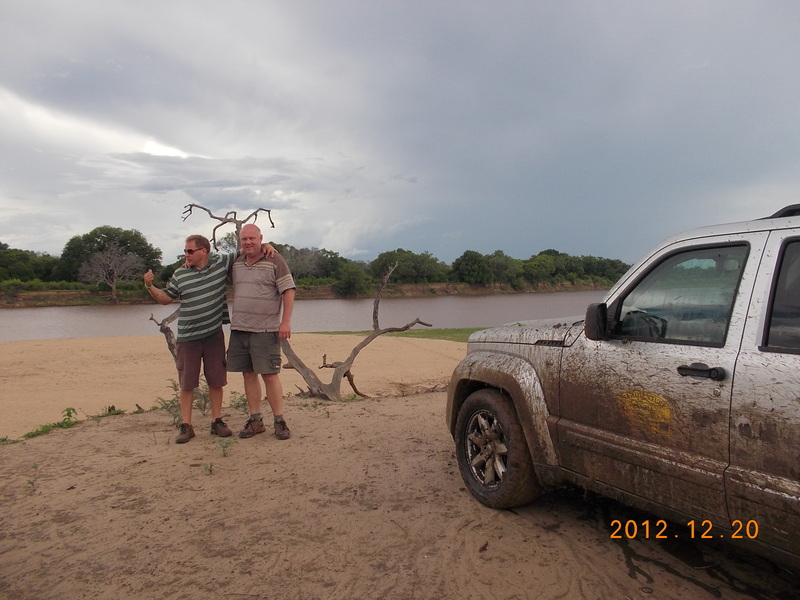 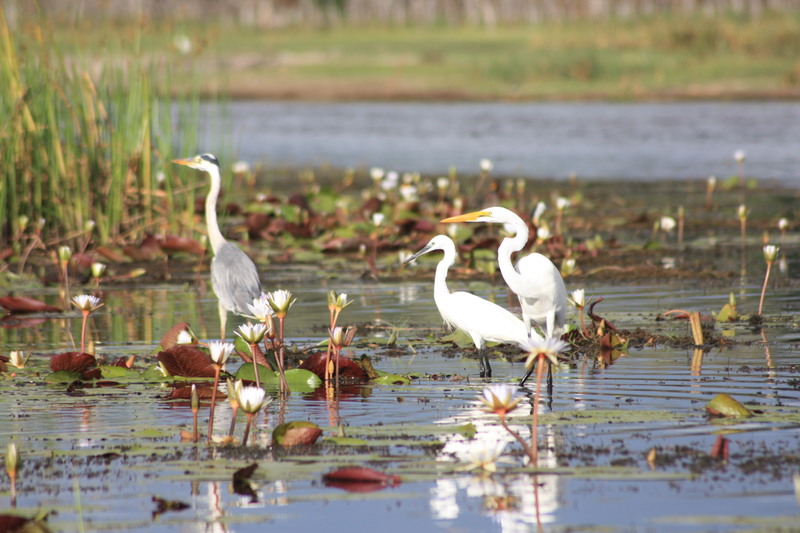 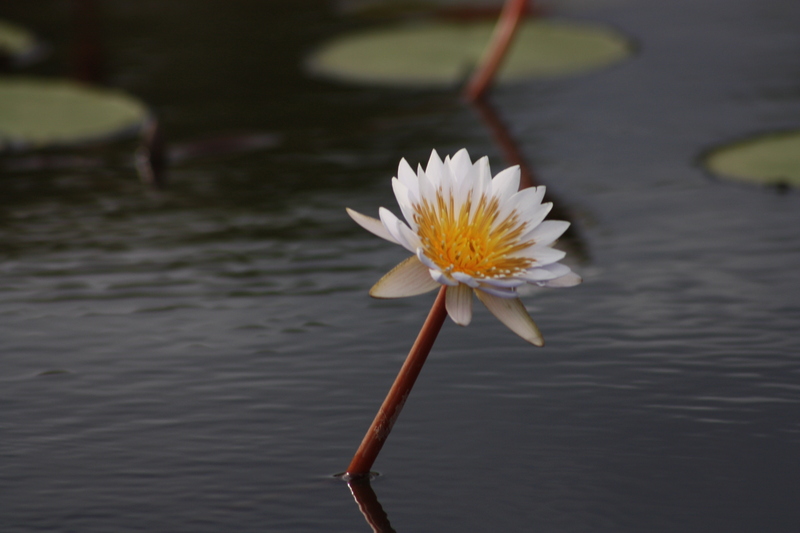 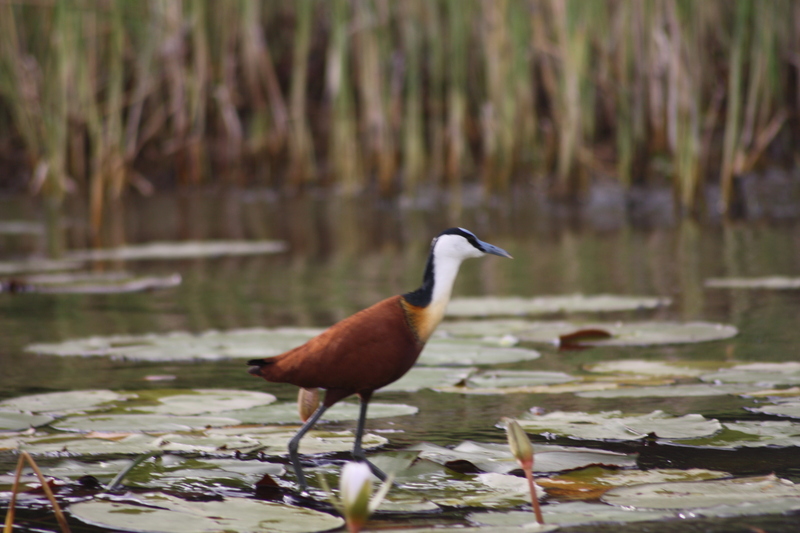 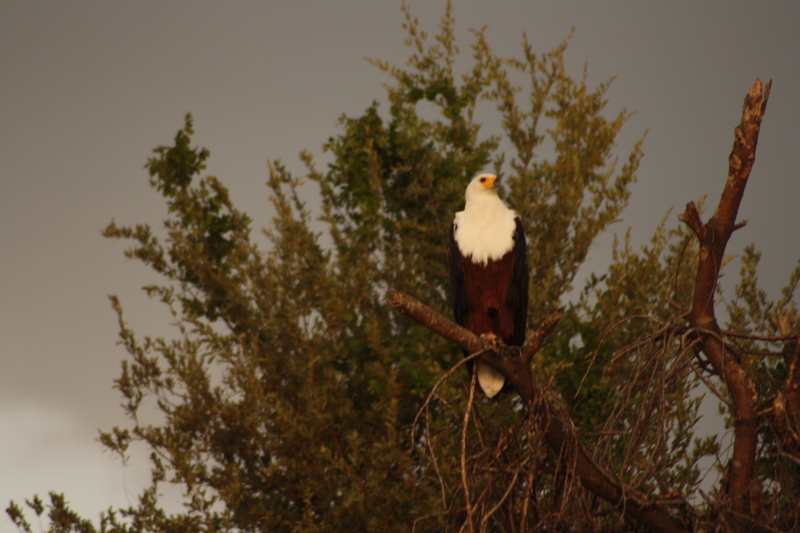 From there it was easy road through Botswana to Maun and a good two nights was spent on the Delta. 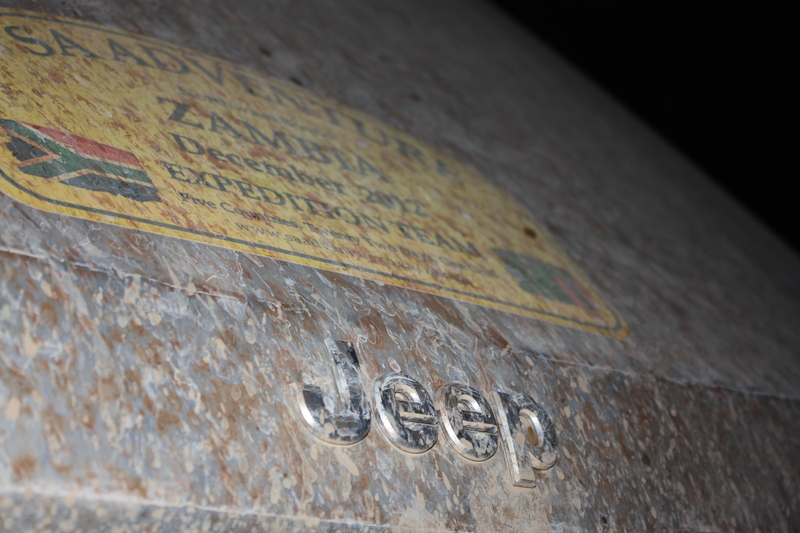 Tim and I decided to cut the plastic cover of the Jeep and bury it in Maun. 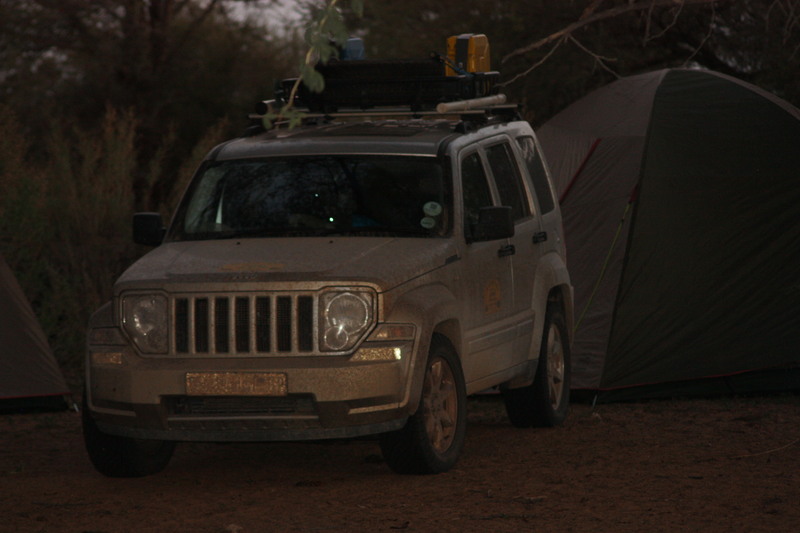 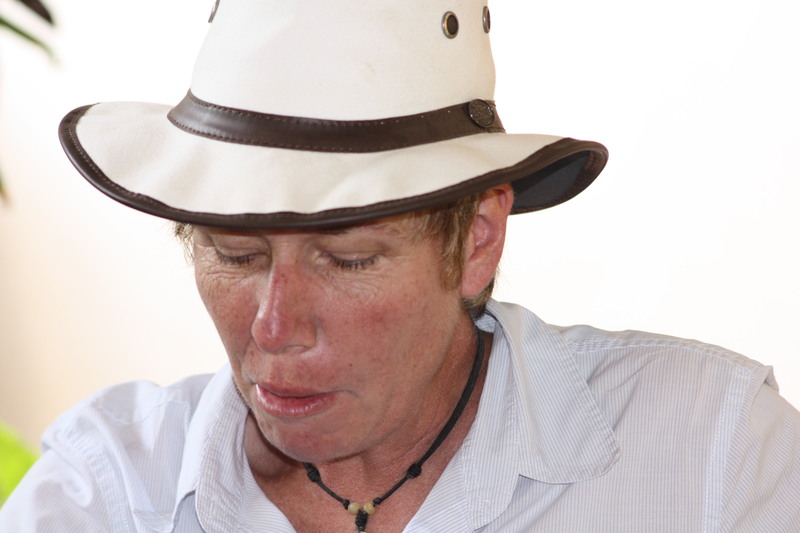 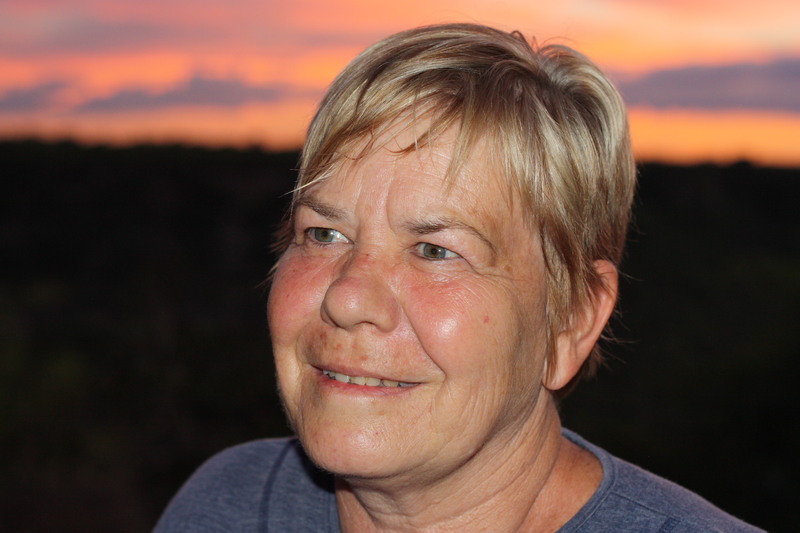 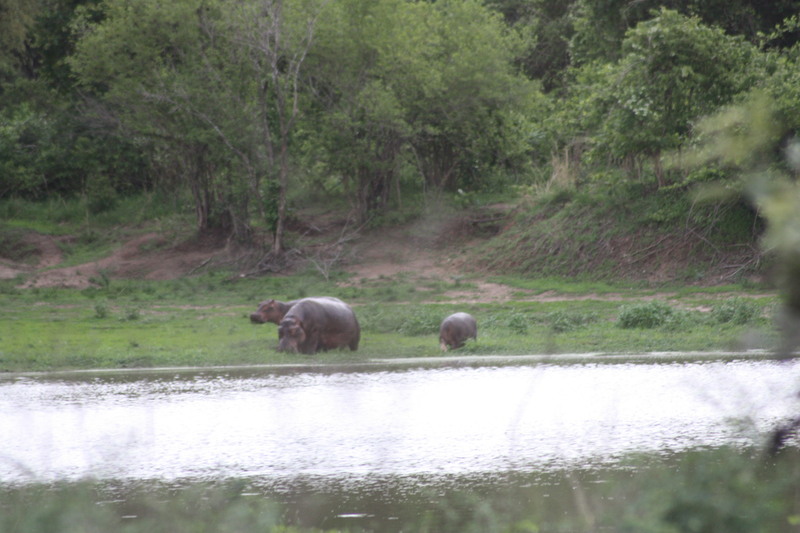 The next day was a short stretch to Botswana border and we stopped at the Rhino Sanitary for the night. 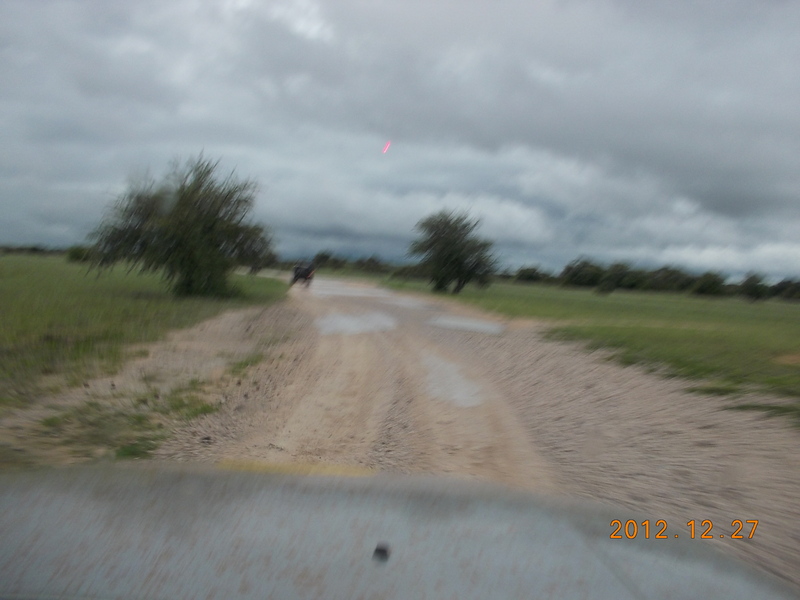 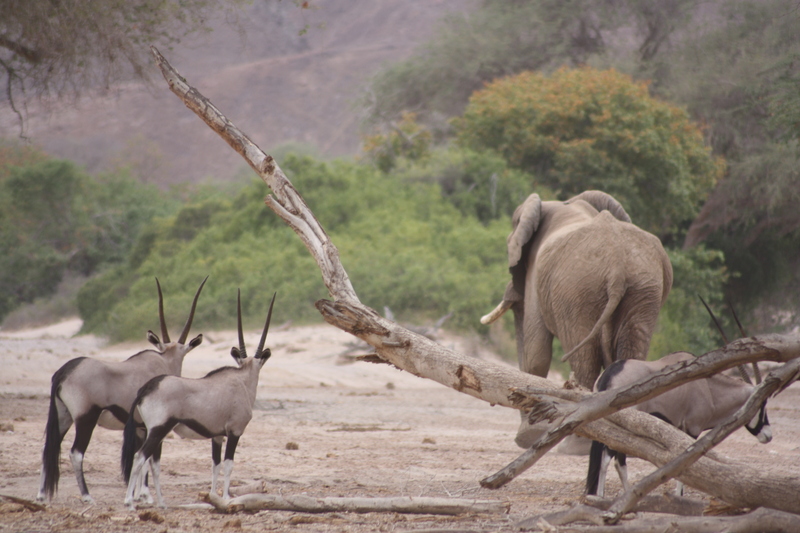 What a beautiful game drive we did to end the journey. 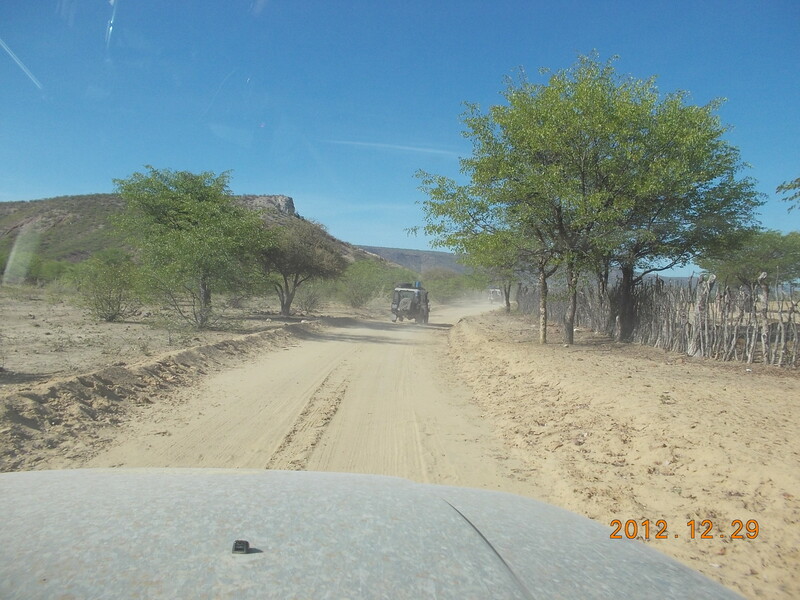 The next day we headed through the border back south, home bound. 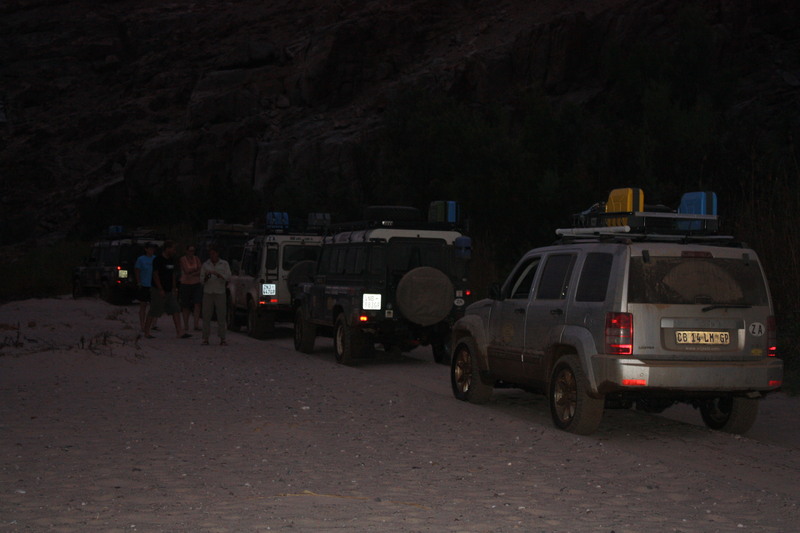 We soon found ourselves caught up in the rush traffic, every one trying to get back from their holidays. 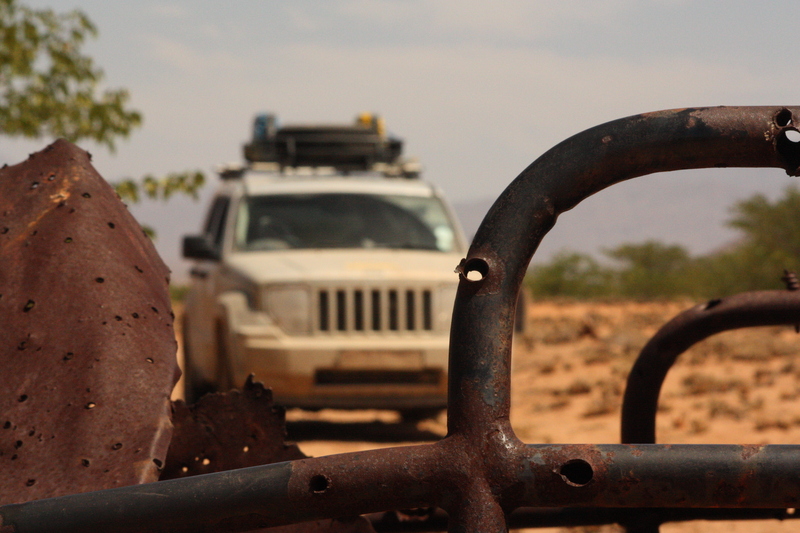 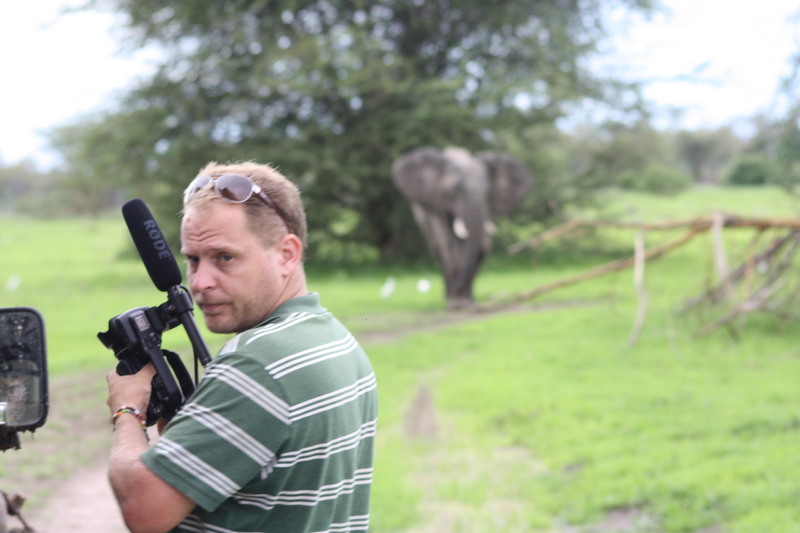 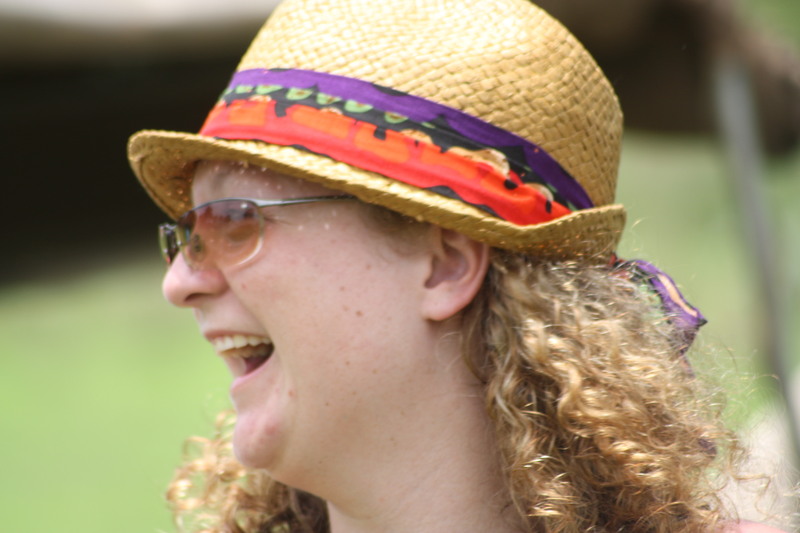 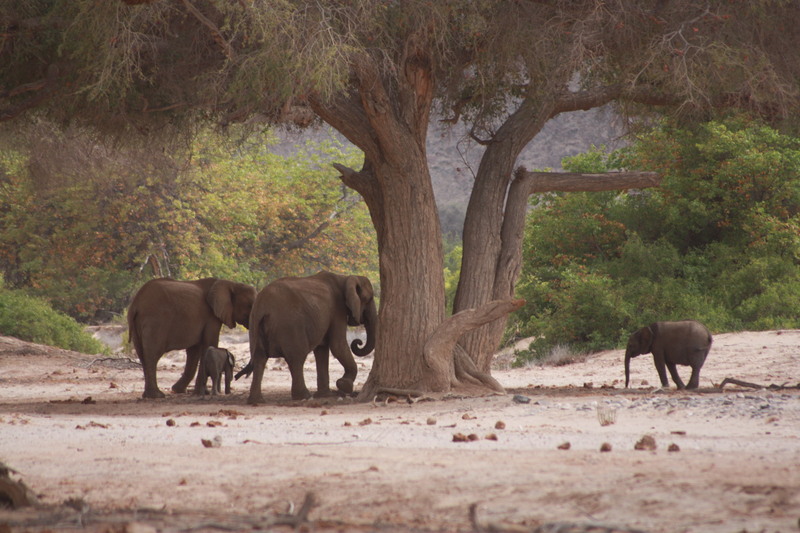 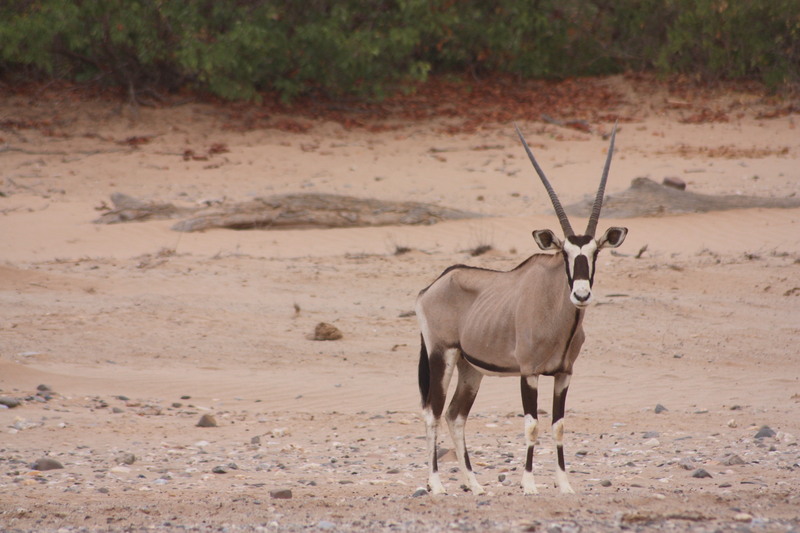 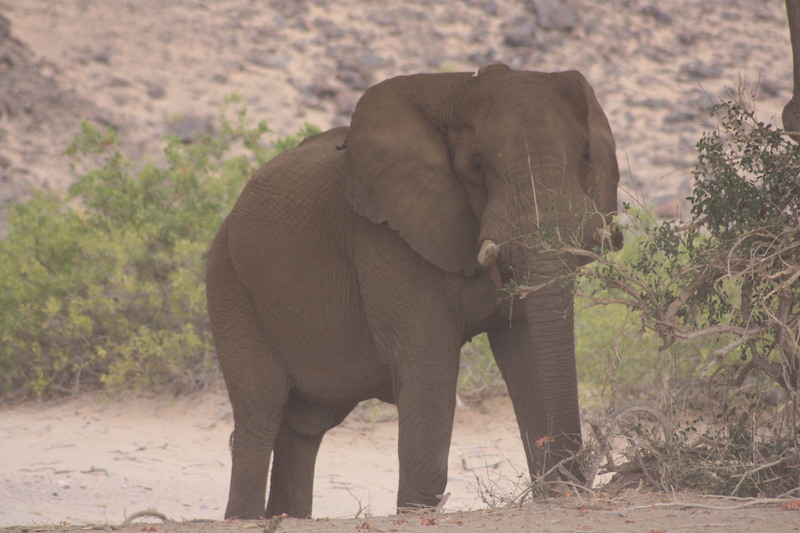 This quickly brought me back to reality from this awesome adventure through Southern Africa. 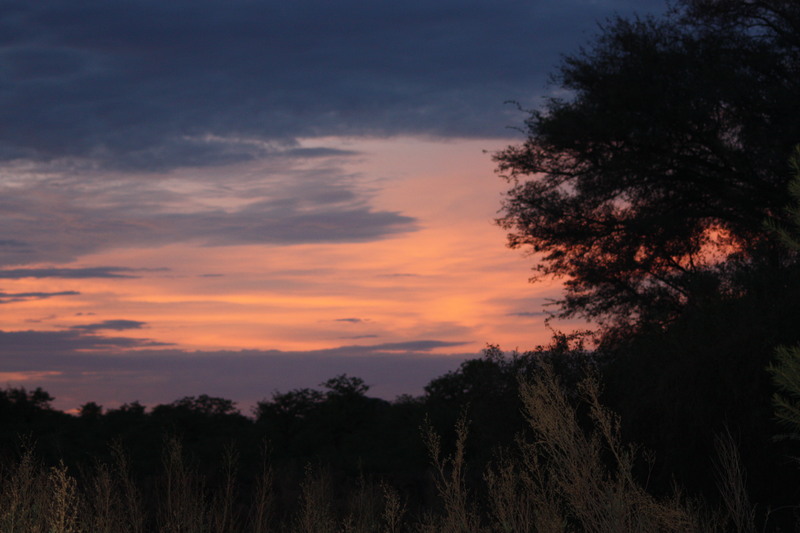 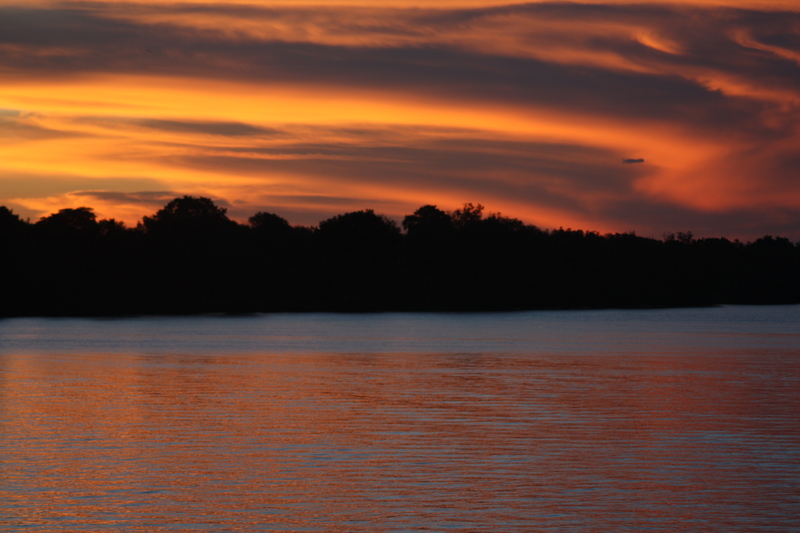 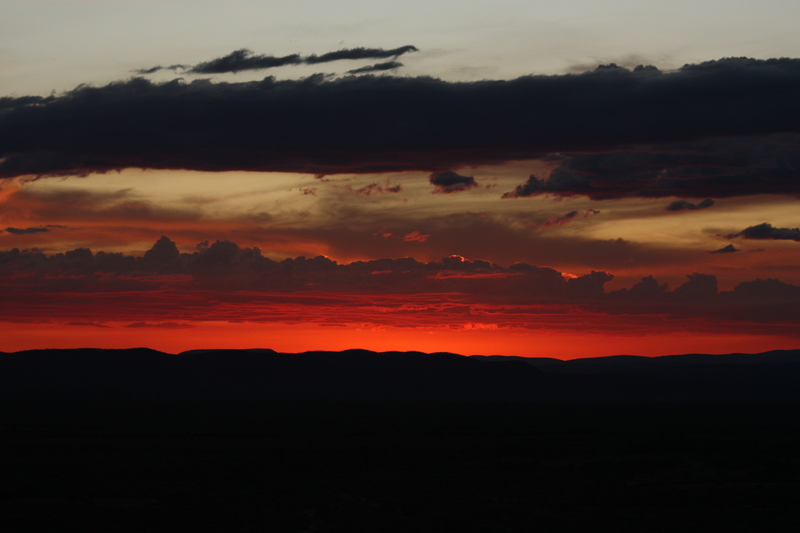 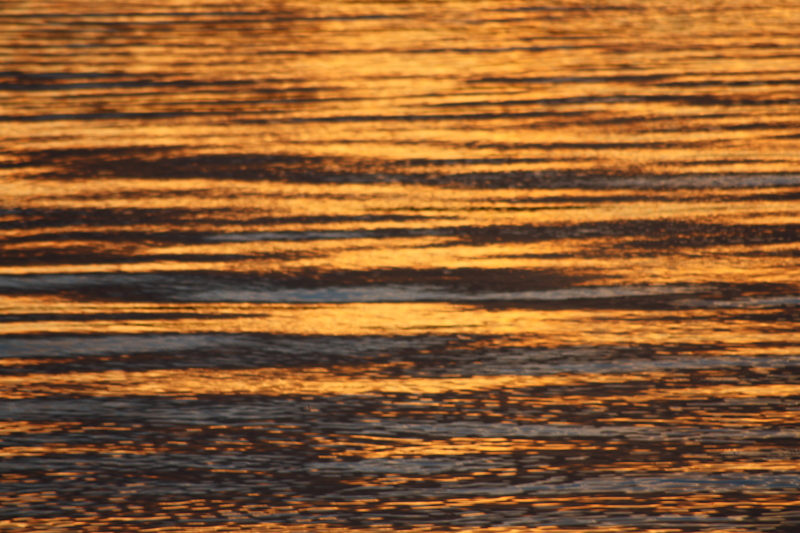 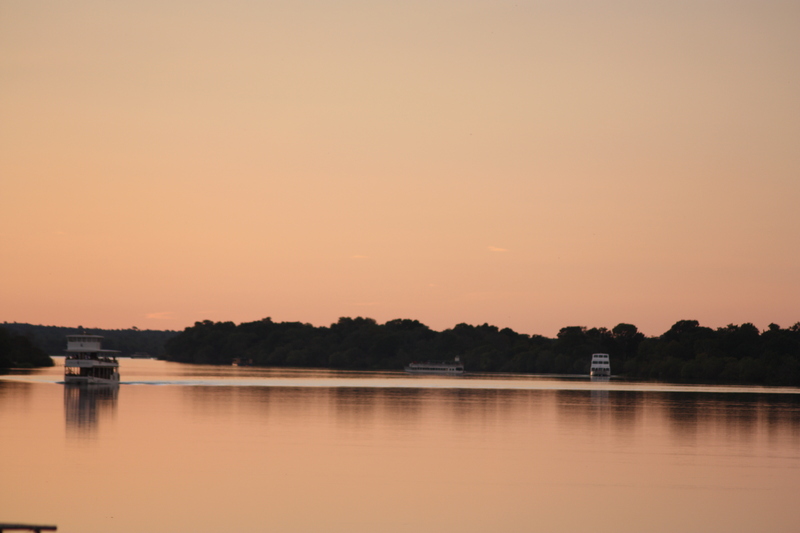 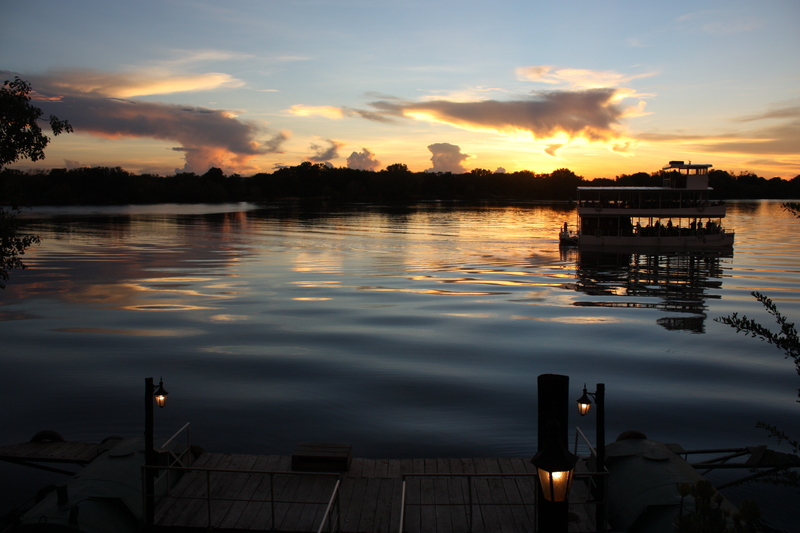 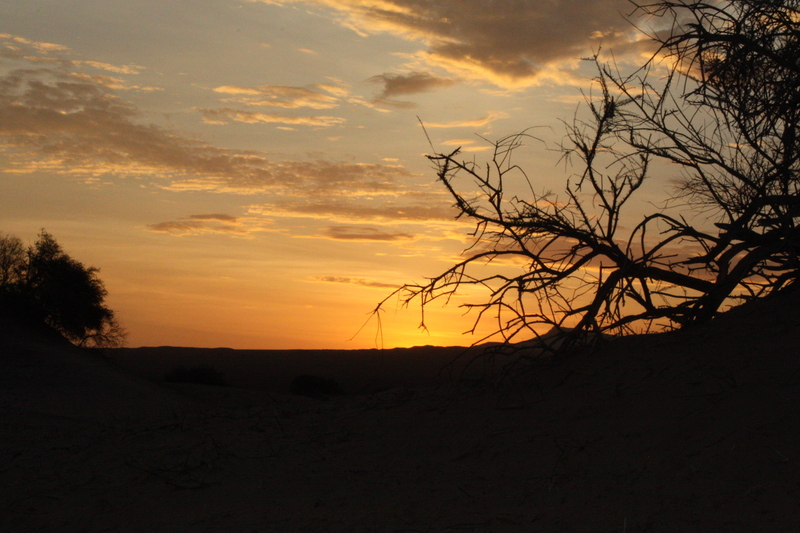 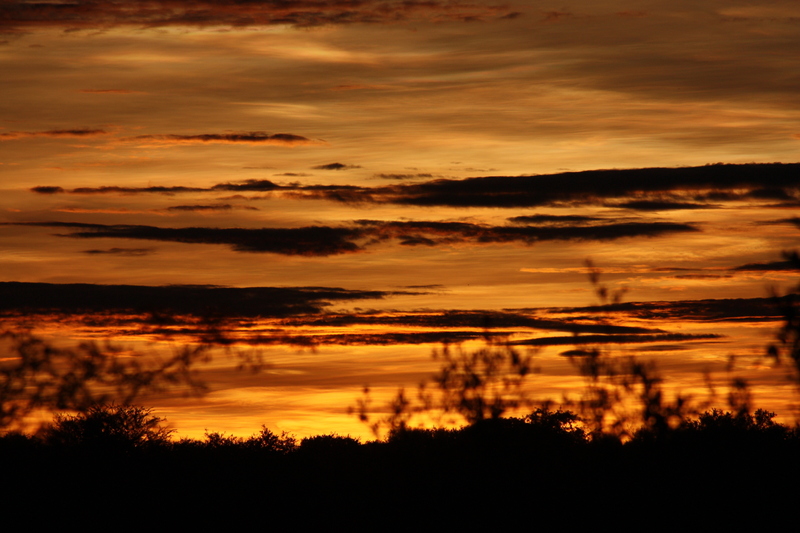 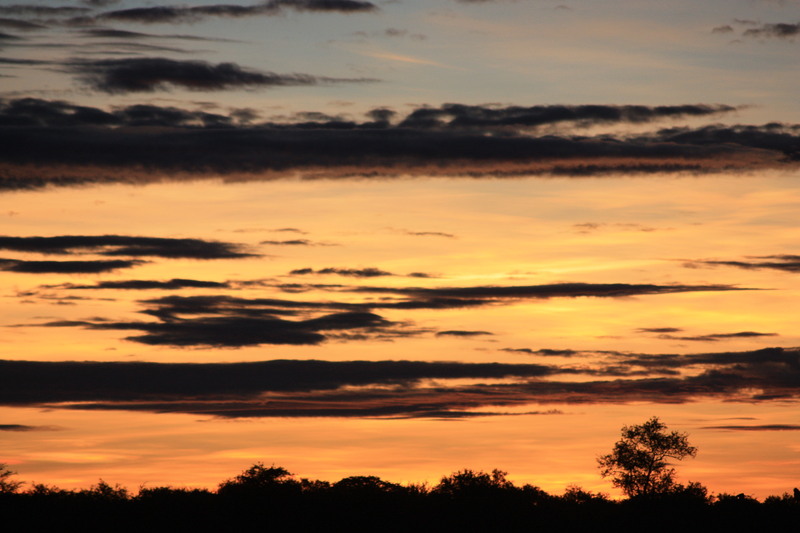 and the beautiful African Sunset and Sunrise…………. 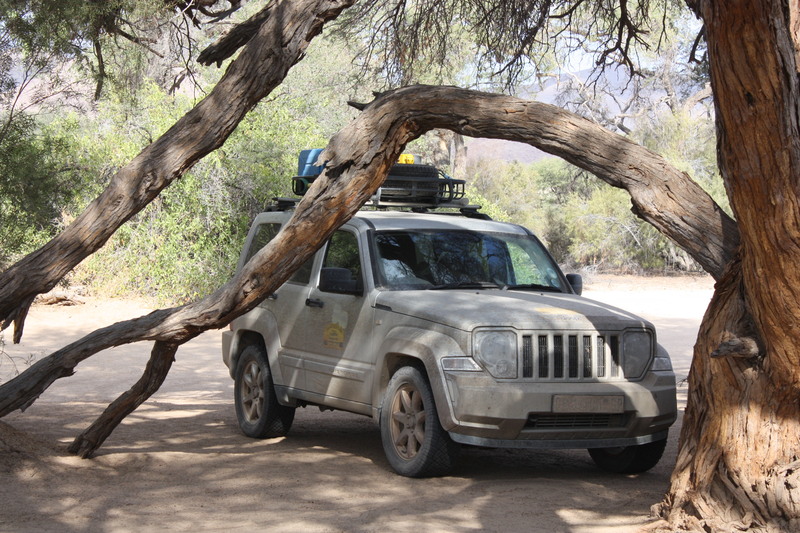 The Grabbers did an excellent job and the Tule Roof Rack was a blessing. 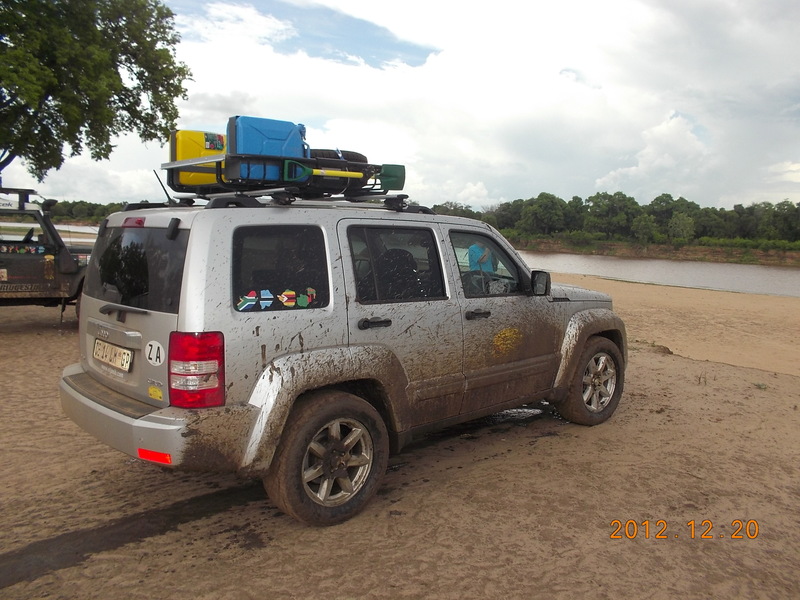 21 days, 5 countries, 8500 km, 150hr driving time and an average fuel consumption of 8.5 l/100 km. 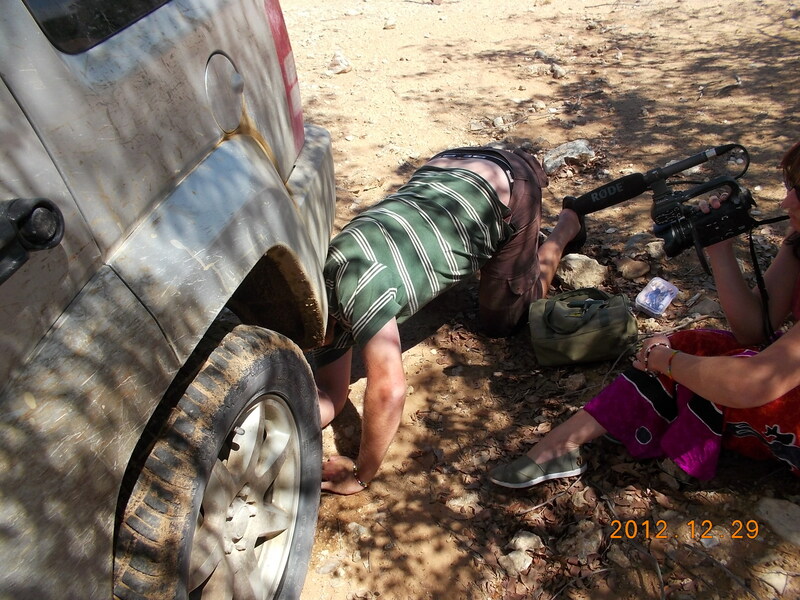 “Wilson” did not take a drop of water during the trip and I only had to top up once with about 100ml of oil. 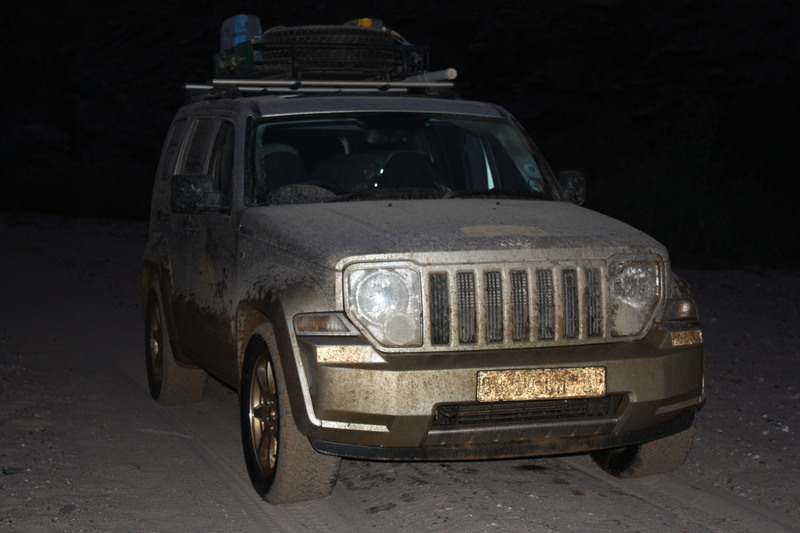 After this awesome Adventure I can proudly say “Wilson” ………. 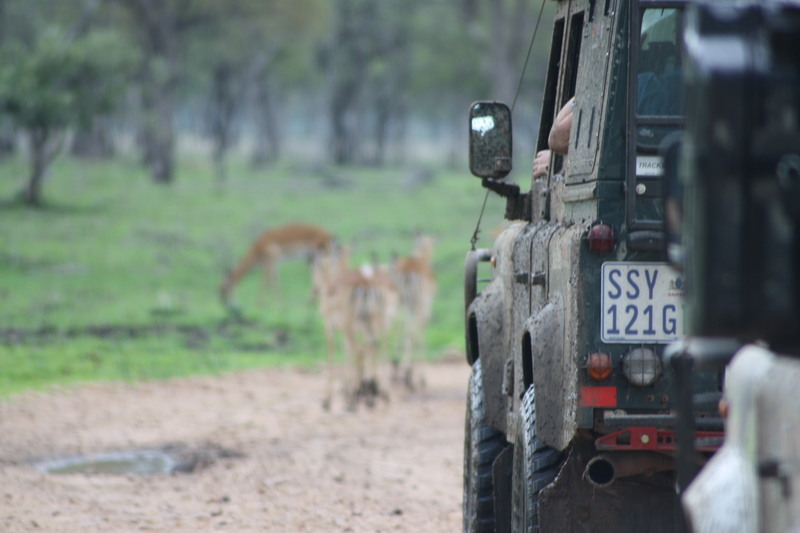 is definitely not just a standard City Slicker 4×4.